We had a vague research plan. In fact, we were treating this trip as a sort of reconnaissance, to check out the area, and hopefully make some contacts. 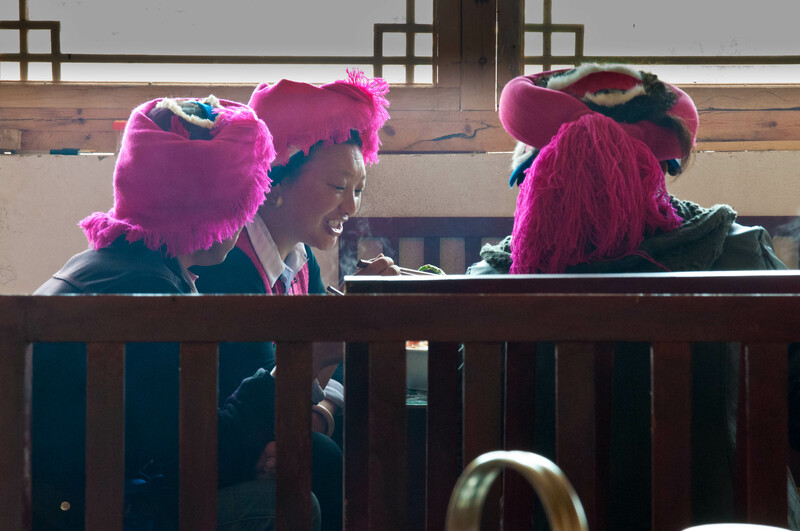 We are both interested in Chinese dialects, language contact, and Chinese language education among China’s ethnic minorities, particularly Tibetans. 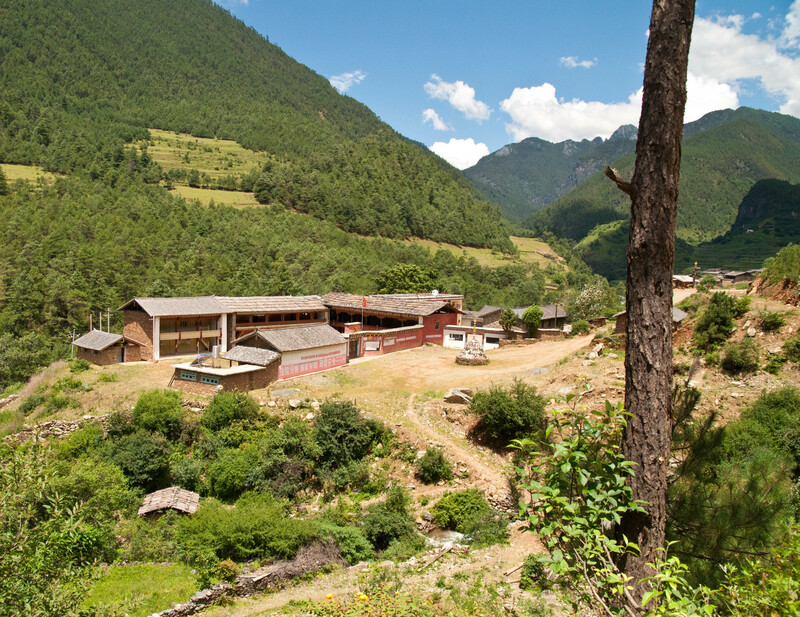 We hoped to make contact with some rural schools to see how Tibetans are learning Chinese. The first challenge we encountered was finding information about the river valley we wanted to visit. 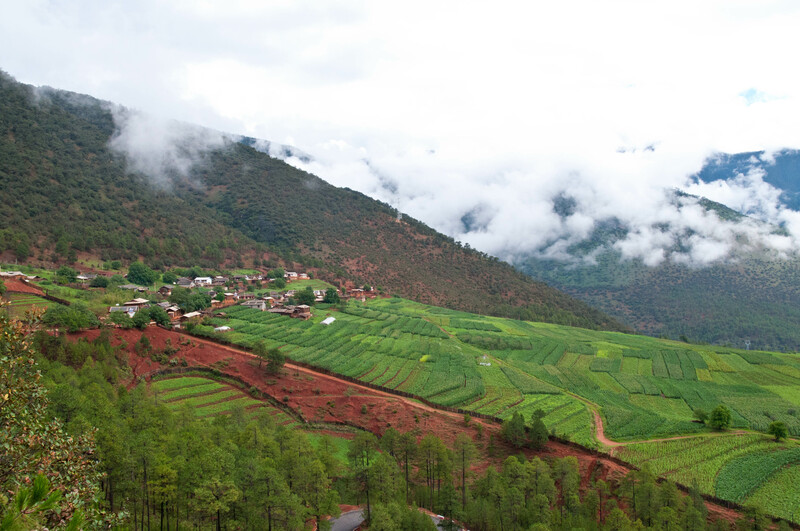 I had heard about the Niru Valley from a former student who had spent a short time there the previous year. A remote place like this does not appear in the Lonely Planet Guide or any other guide. Searching online also did not produce much. We finally found a hand drawn map from a Chinese blogger who had visited the region. The information was scant, but better than nothing. 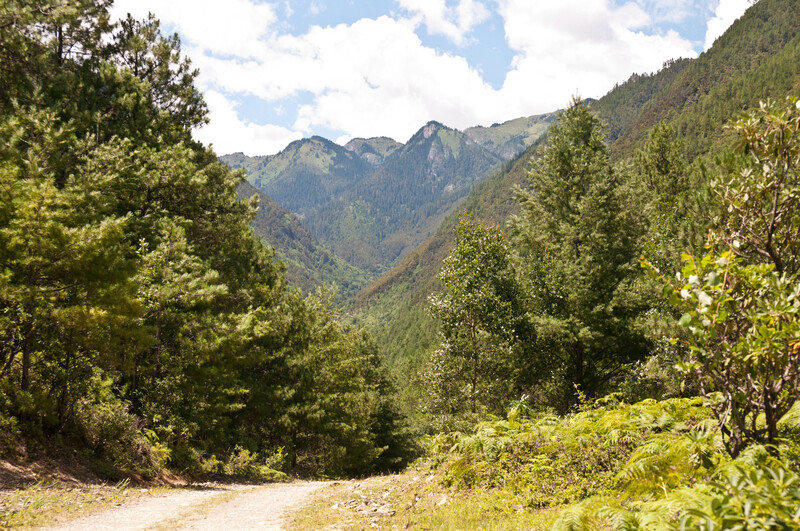 We planned to hike up this valley past the village Hongxiu (at least that’s what we had heard) to the Tibetan village of Niru. We hoped there was a school there and that we might be able to meet the teacher, even though school was out for the summer. 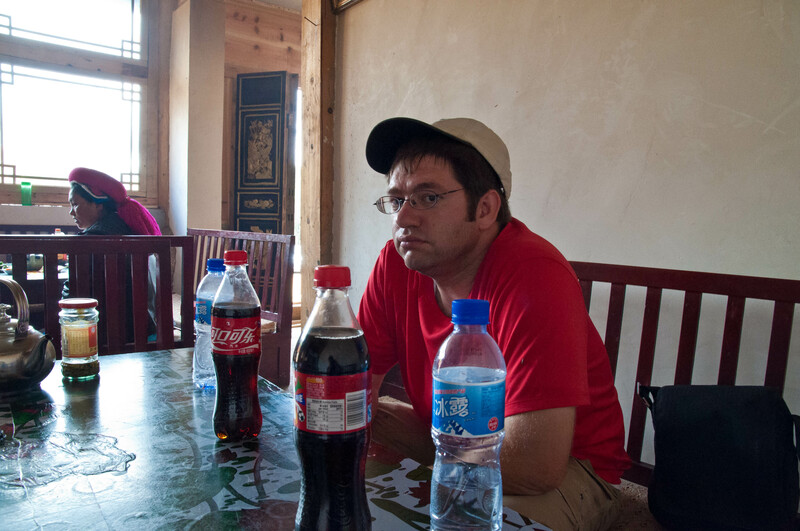 We also hoped to interview some locals and talk to them about their experiences learning Chinese. 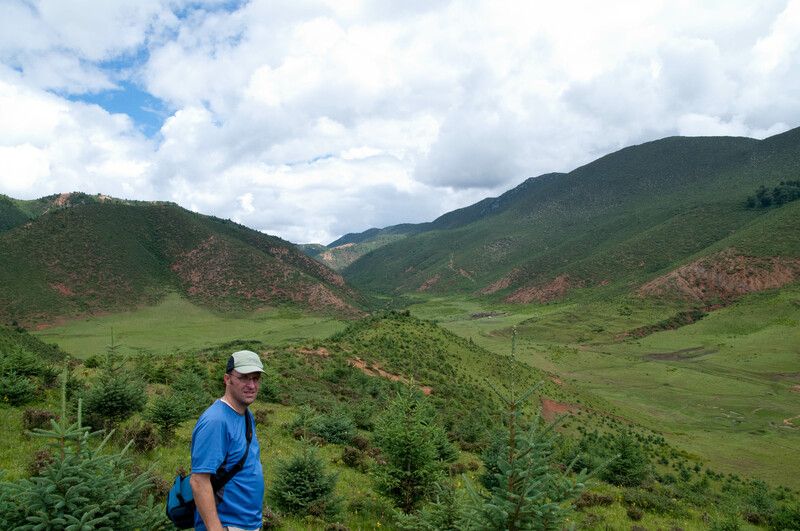 But more than anything we wanted to see some natural, remote, and wild parts of China. 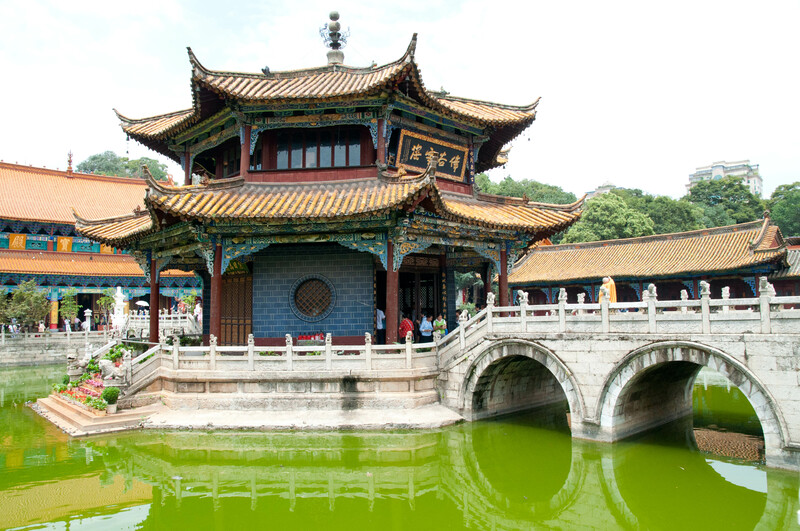 We had both spent plenty of time in big Chinese cities and had seen all the big cultural sites many times. The evening before we left we went down to the entrance to the old town where drivers and their minivans congregate. We talked to a few guys until we met a guy we liked. He was a Tibetan who was born and raised in Shangri-la. 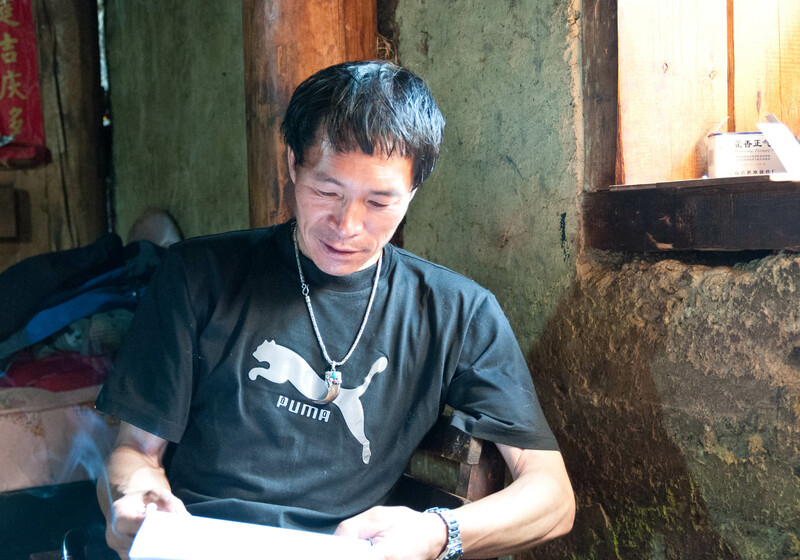 We negotiated a price for him to drive us to the village of Luoji. The next morning we met him and we began our journey. 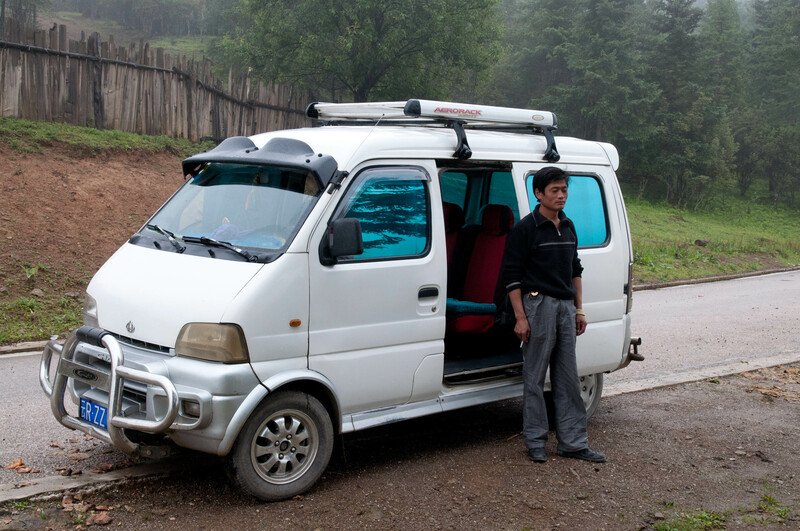 Minivans in China are not like minivans in the U.S. which are actually quite large. These are tiny little vans, and yet they still can seat up to 6 or 7 people. 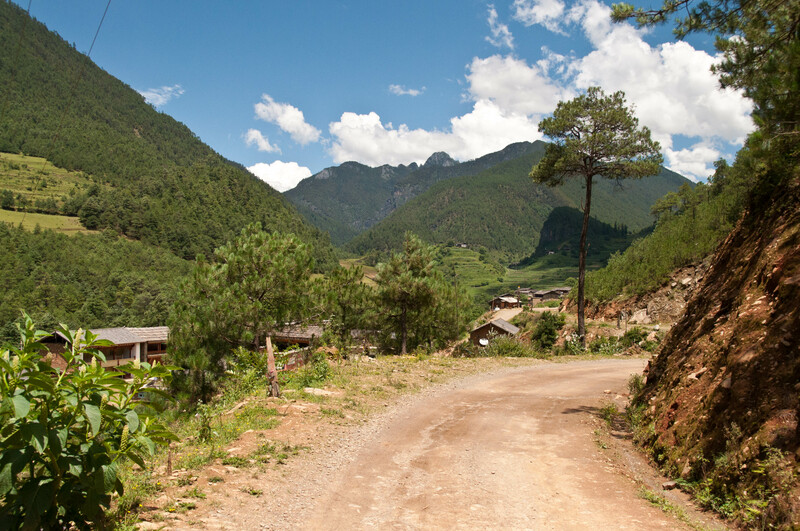 Luoji is an ethnic Lisu village several hours drive southeast of Shangri-la. 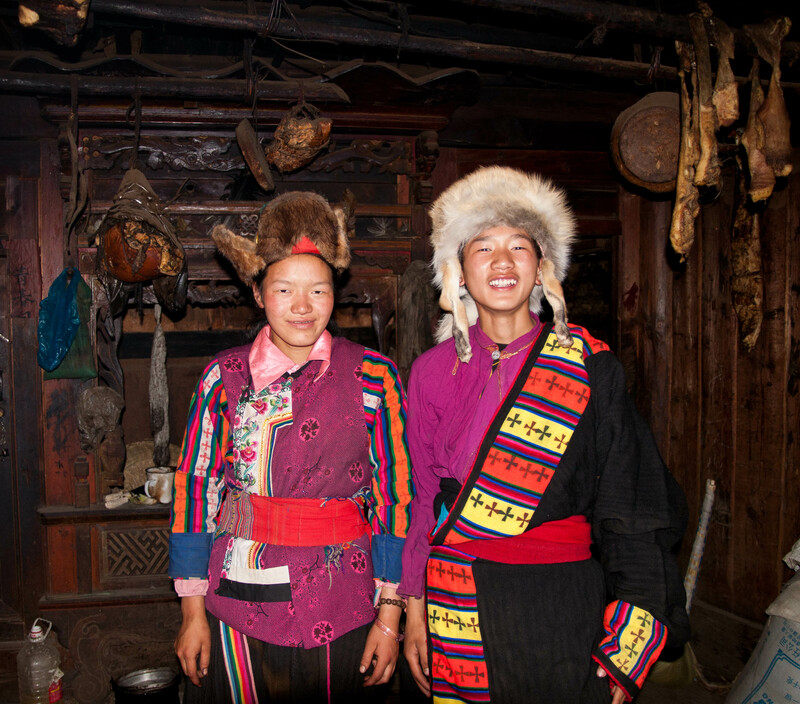 The Lisu are an ethnic (non-Chinese) group that have lived in Yunnan Province for hundreds of years. 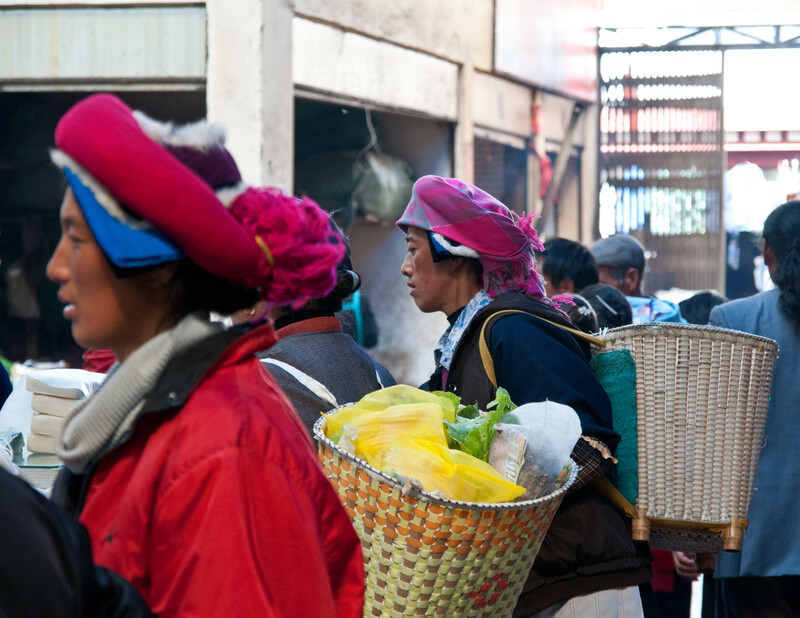 In fact, there are more ethnic minority groups in Yunnan than any other place in China. 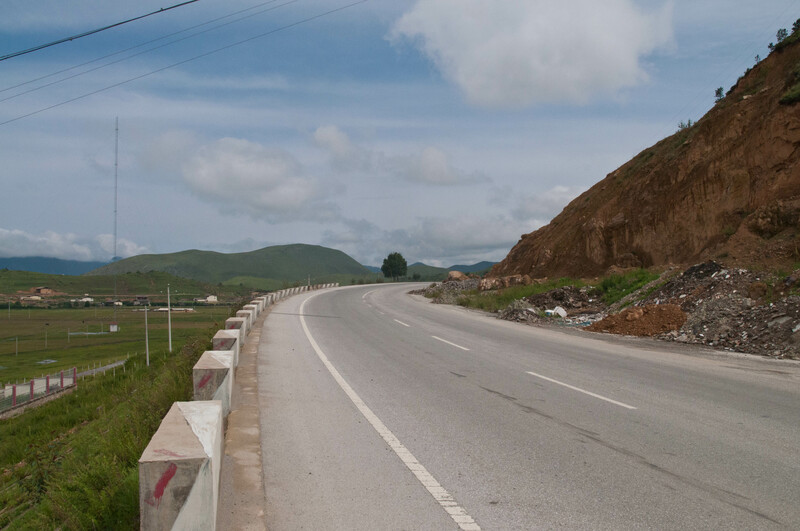 The road to Luoji started out as a nicely paved two lane road. 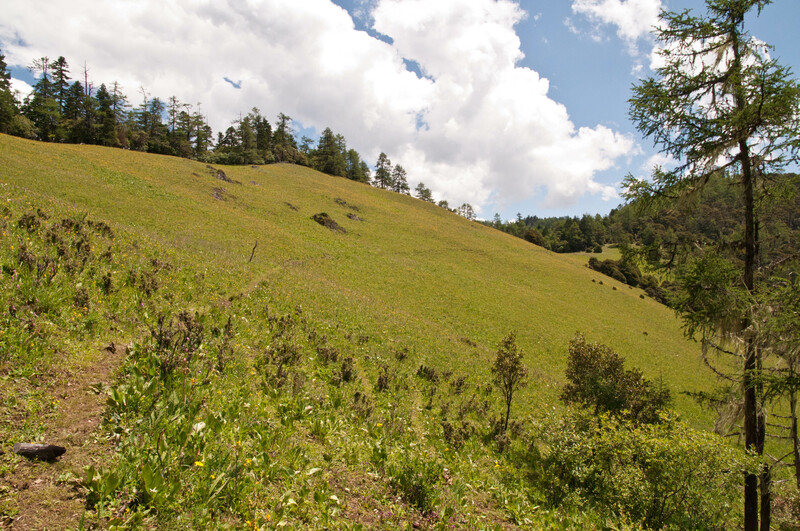 We first climbed up out of the Shangri-la plain, then began descending into a deep valley. 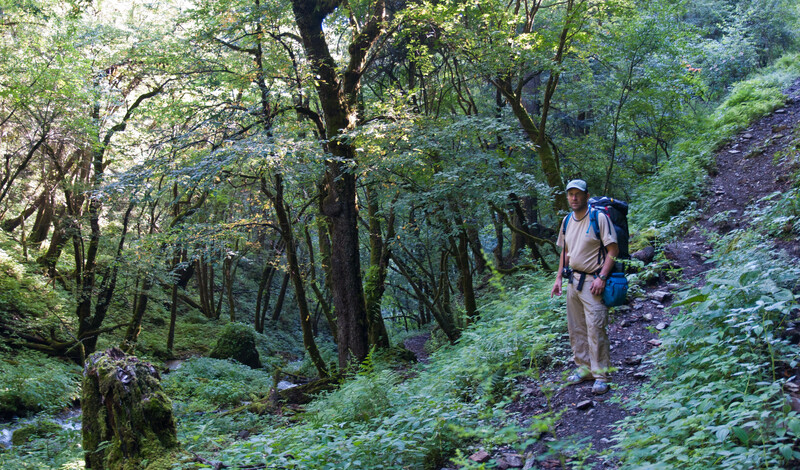 For the first two hours we climbed up and down switchbacked roads through very green and lush countryside. 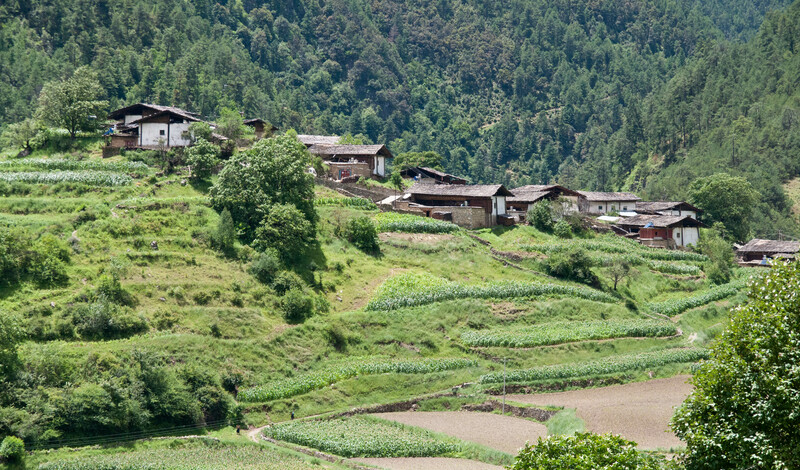 Occasionally there would be a village on the hillside with terraced farmland. 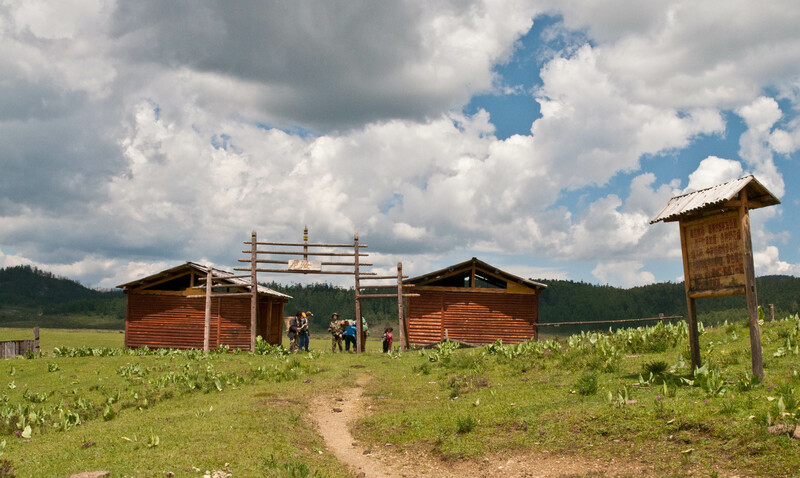 We also passed a ranch with rustic buildings with livestock. Our driver was delightful. He had a high school education and had pretty good Mandarin. My experience is that the more education a person has the better their Mandarin is. 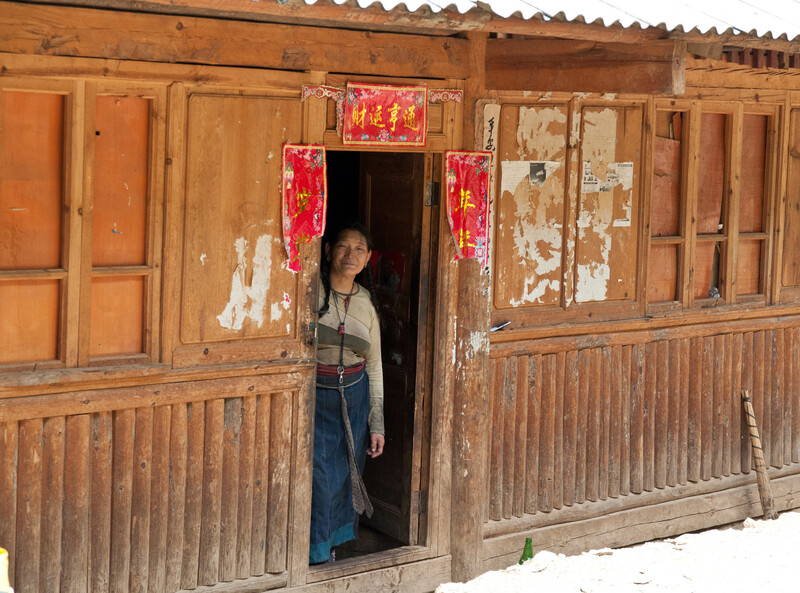 I have spoken with plenty of people in rural areas of China that had very rough and broken Mandarin. (It is secretly gratifying to talk to Chinese that have worse Mandarin Chinese than I do). We really enjoyed talking with him as we drove. He told us all about his education, particularly how they learned Mandarin Chinese as children. He told us all about his family. He was married and had two daughters, of which he seemed very proud. After about two hours, the road began to deteriorate. It went from nicely paved blacktop to a type of crushed rock road, to a dirt road full of pot holes, and deep muddy pools. It was pretty rough going for about an hour and a half or two hours. 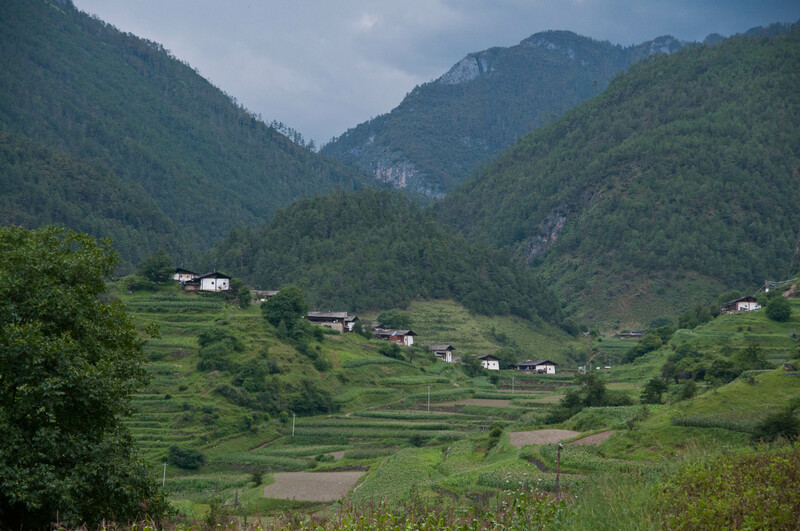 After about three and half or four hours we arrived in the small village of Luoji. The main road ended here. At the end of the road was a small restaurant, a guest house, and a small store. We had bought some things in Shangri-la so didn’t bother buying anything. When we got out of the minivan, we were met with stares. It was as if they had never seen foreigners before. They even seemed a little spooked. We were anxious to get out of town, so to speak, so we paid our driver and bid him a warm farewell. He had never been to Niru but he pointed out the way. 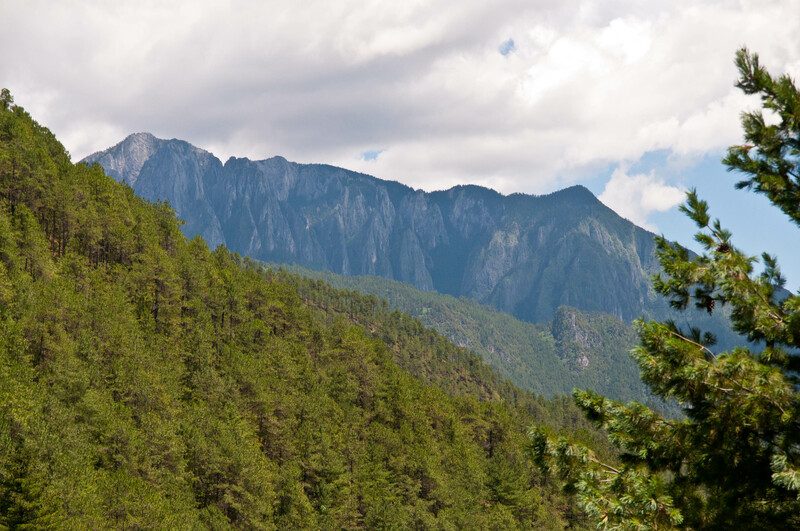 Luoji was much lower in elevation than Shangri-la, probably by at least three thousand feet. It was much warmer down here in this river valley. Shangri-la had been very pleasant and cool, being over 10,000 feet in elevation. We were surprised it was so warm here. 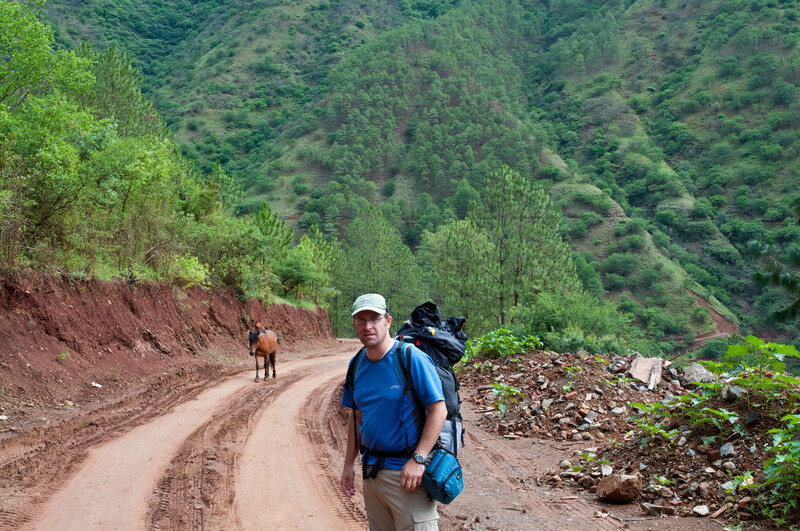 With all our belongings in midsized backpacks we set off down a narrow dirt road. We felt a sense of excitement mixed with a bit of trepidation at the unknown. 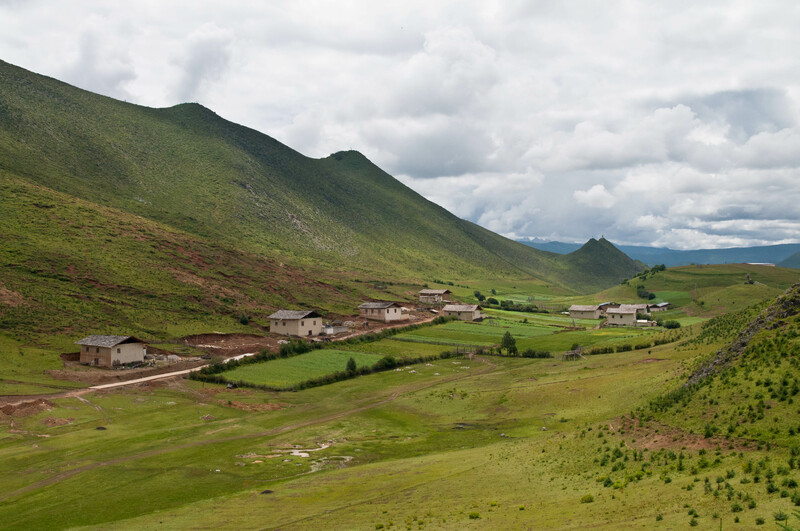 We really did not know what to expect up this valley, but we hoped to meet some rural Tibetans, see some beautiful unspoiled country, and enjoy the peace and quiet of the countryside. 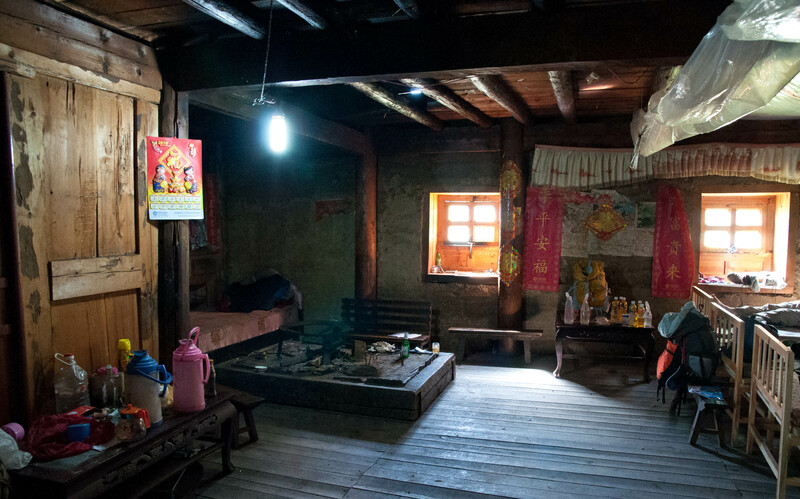 We had read a Chinese blog report that there was a rustic guesthouse up the valley in an area called Hongxiu Village, but we were not sure where it was. We assumed we would be able to buy food at stores, or eat at small restaurants. In Shangri-la we had bought some crackers, coconut cookies, some instant noodles, and some peanuts. We each carried two quarts of water. We did not bring any camping gear as we planned to stay in guesthouses along the way. 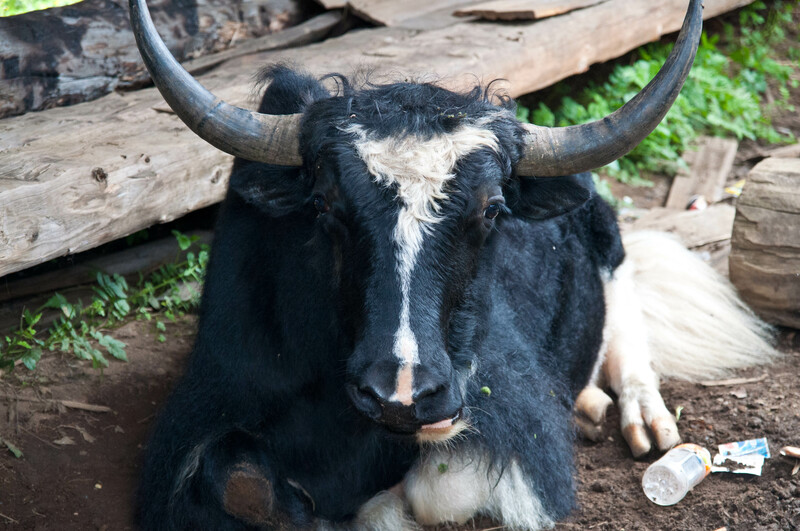 We were also hoping to hike high into the mountains above Niru to some high mountain pasturelands where the local Tibetans grazed their yaks in the summertime. Three hours later we are sitting by the side of the road, hot, sweaty, and already running low on water. 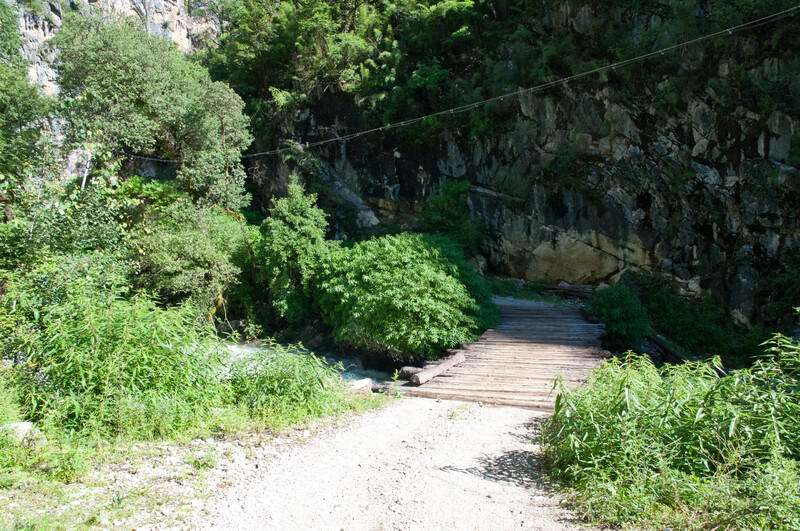 The road out of Luoji dropped down into the bottom of the valley and crossed a river, then switchbacked up the other side for a couple miles. It was steep going for quite awhile. 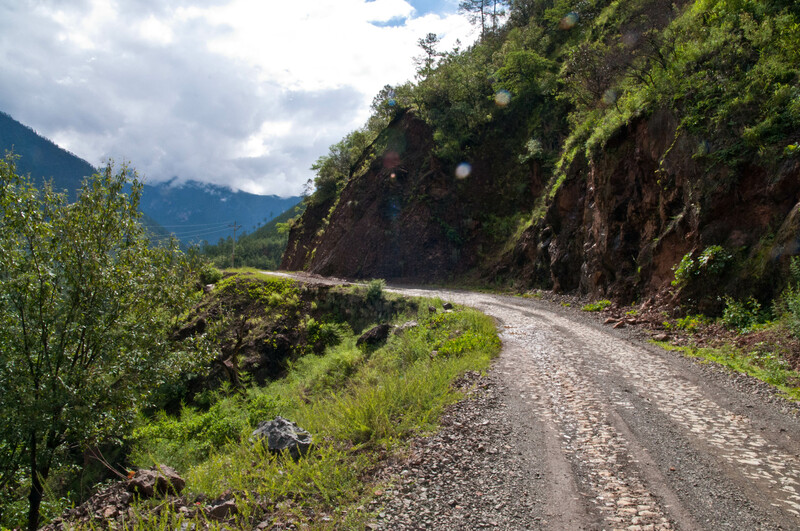 Once we got to the top of the gorge, the road turned left up into the Niru Valley along the Niru River. At this point the river was far below us at the bottom of the valley. 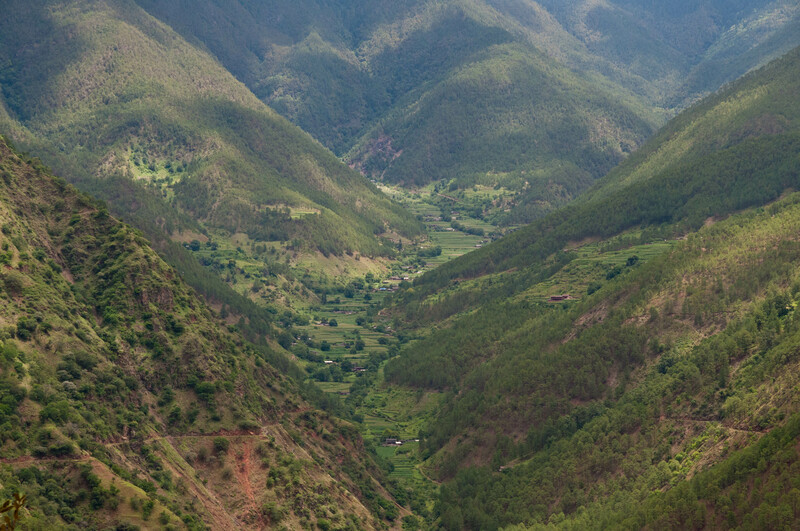 Across the valley picturesque farms dotted the mountainsides and side valleys. It was very idyllic and looked like something out of a coffee table book. 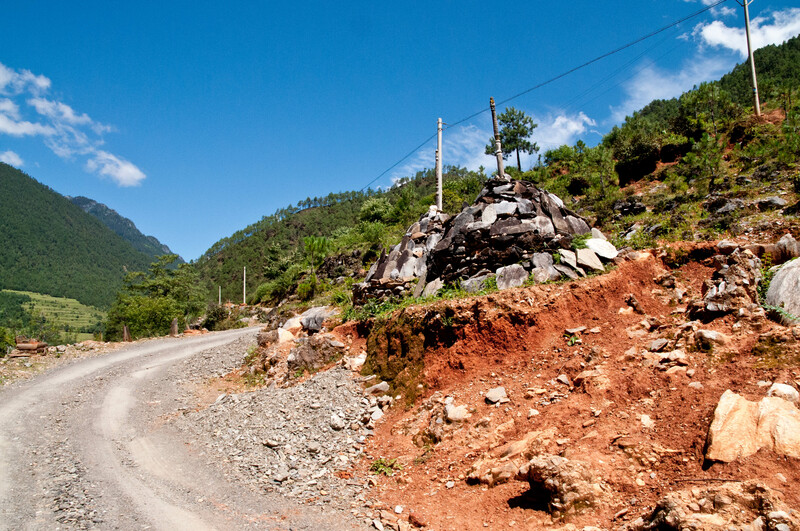 We were told by some locals in Luoji that the road to Niru was built the year earlier. Up until that time it was not much more than a trail. 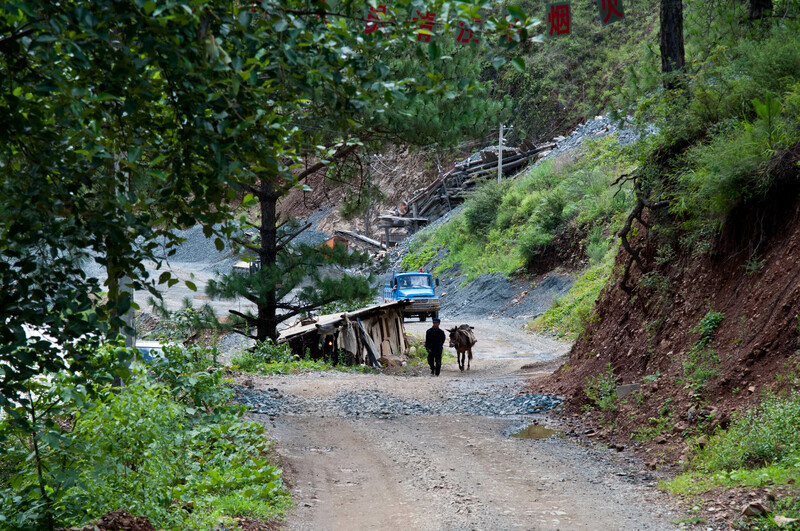 In several places the road is washed out, or covered by rocks from small landslides. Occasionally a jeep or truck passes us. We are sitting taking stock of the situation. We’re running low on water but there is a small creek running down the mountainside and across the road. We fill our bottles and treat them with purification tablets that I carry in my first aid kit. That should be good for a few more hours. We certainly were not expecting this kind of heat. After another couple hours we come upon a small cluster of wood frame houses. We are again running a bit low on water, so we decide to see if someone can offer us some water. 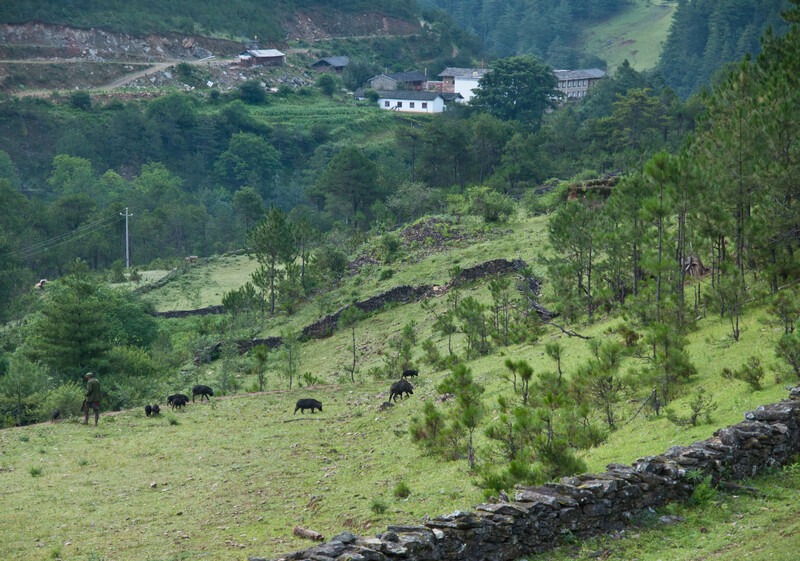 We leave the main road and head down a small side road that leads to the farmhouses. Almost immediately a mangy dog appears barking ferociously. We both instinctively reach down and pick up a few rocks. A few well-aimed throws sends the dog on his way. We heard stories of the fearsome, and huge Tibetan mastiffs. 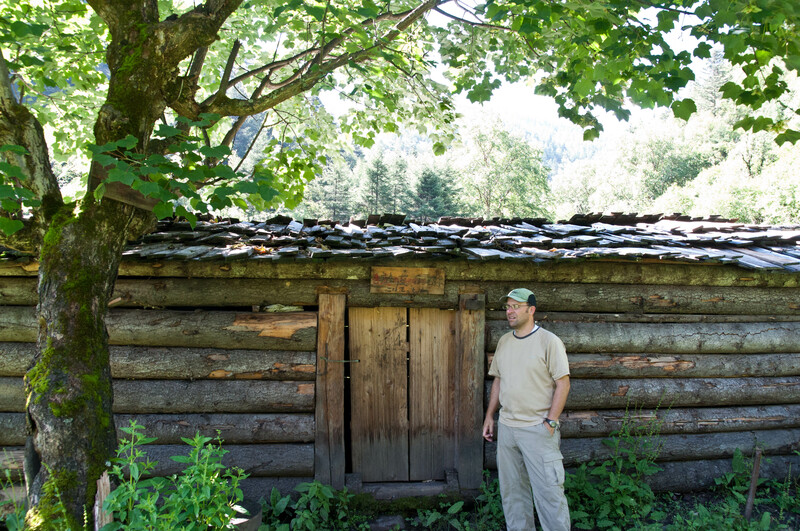 We approach what looks like a very old wood frame house. There is a woman in the yard washing clothes in a large metal washbasin. We greet her in Chinese. She turns and yells something in a language we do not understand. A young teenage girl appears from inside the house. 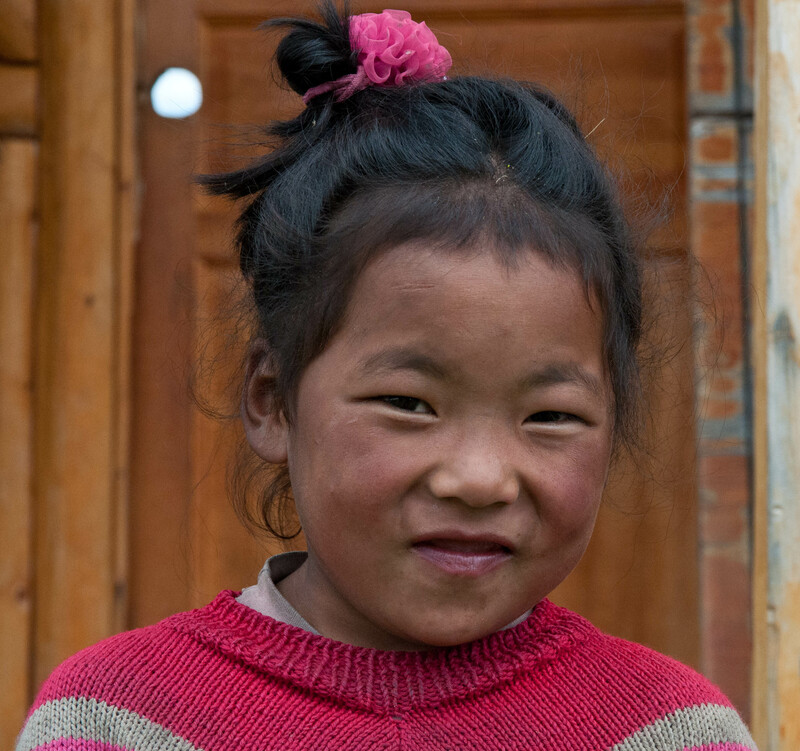 She speaks Chinese, as most school-age kids in China do. They are Lisu and her mother does not speak Chinese. We ask them if there are any stores around. They say the only store around is back in Luoji, so we ask if they can give us some water. 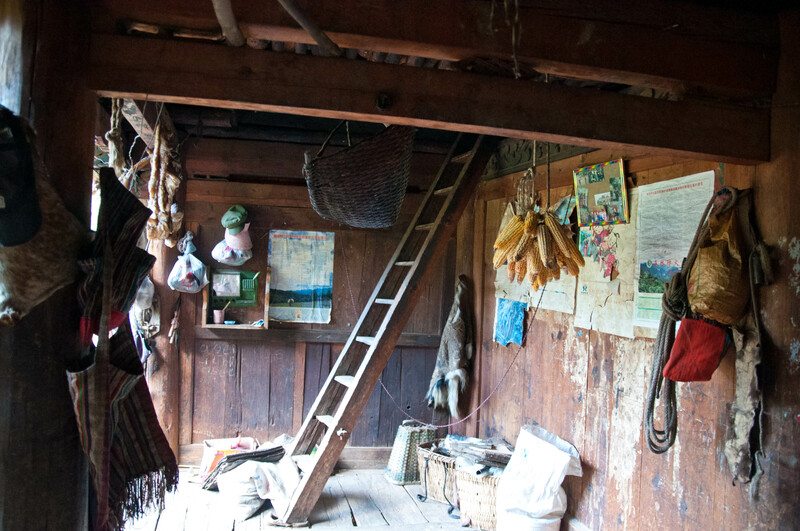 She invites us into the house, so we drop our packs outside the front door and enter a dimly lit, very rustic house. It is made entirely of wood, the floor, walls, ceiling. There are three chickens wandering around inside. 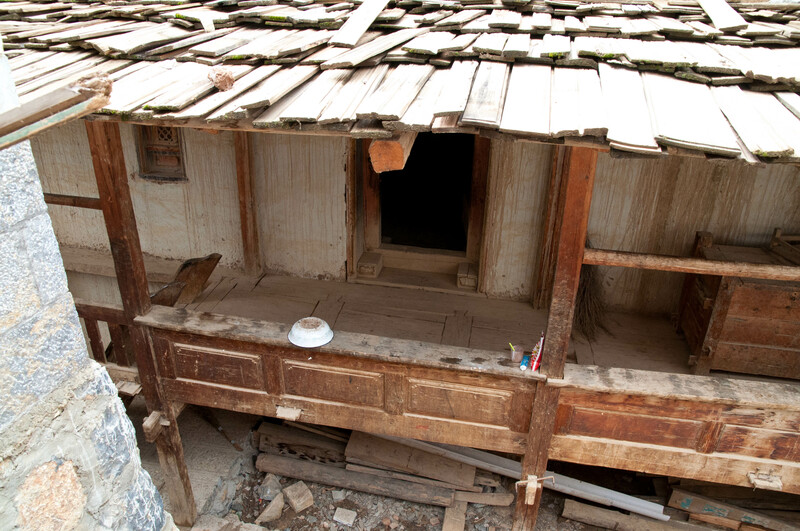 There does not appear to be any running water or plumbing. The young girl gives us each a cup of boiling water and we sit and chat. She is in middle school and says there is a small school nearby that teaches all the kids in this part of the valley. 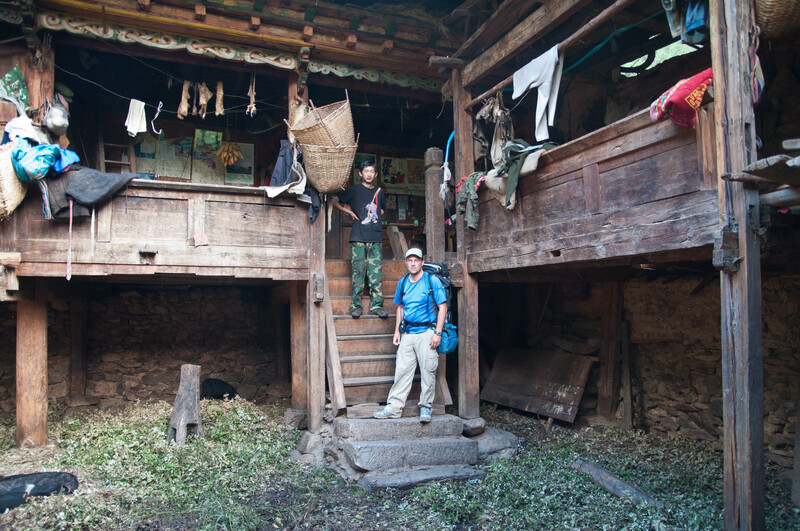 She tells us that most of the kids are Lisu or Naxi. She has okay Mandarin, though it is accented. Her mother sits by smiling. They tell us that they have never seen foreigners before, except on TV. After about fifteen minutes we thank them and take our leave. A bit further down the road, we come across another cluster of houses. We wander around a bit, until we find someone and ask them if there is a store nearby. A young girl runs off, returns a few minutes later with an middle aged women who shows us to an old building that looks like it used to be a store. Inside the floor is littered with boxes and trash. She rips open a few boxes until she finds one with bottled Chinese sports drink. The expiration date is a year old, but probably can’t do too much harm so we each buy two bottles. It looks like a type of guesthouse was build here but nothing came of it. It was deserted. Their Chinese was pretty rough so we didn’t spend much time there. We thanked them for the drinks and continued up the road. The entire day the road gradually climbed up the valley. 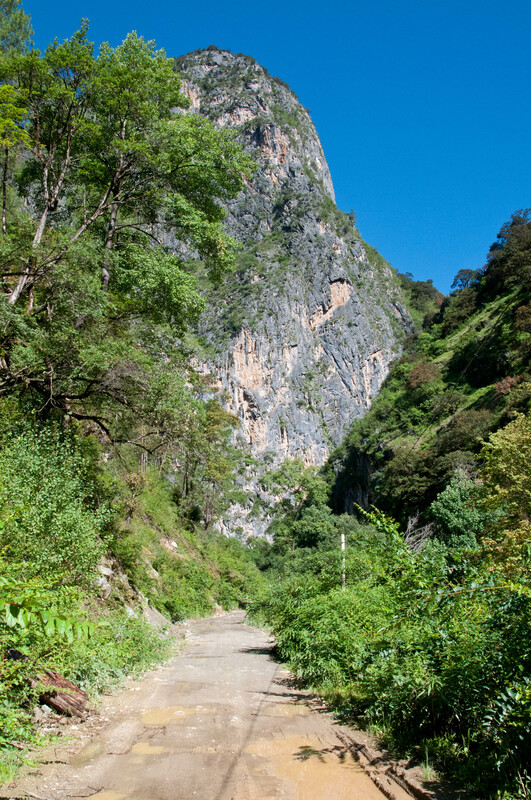 By afternoon the road had dropped down to the bottom of the valley and we were hiking along the swift and roaring Niru River. 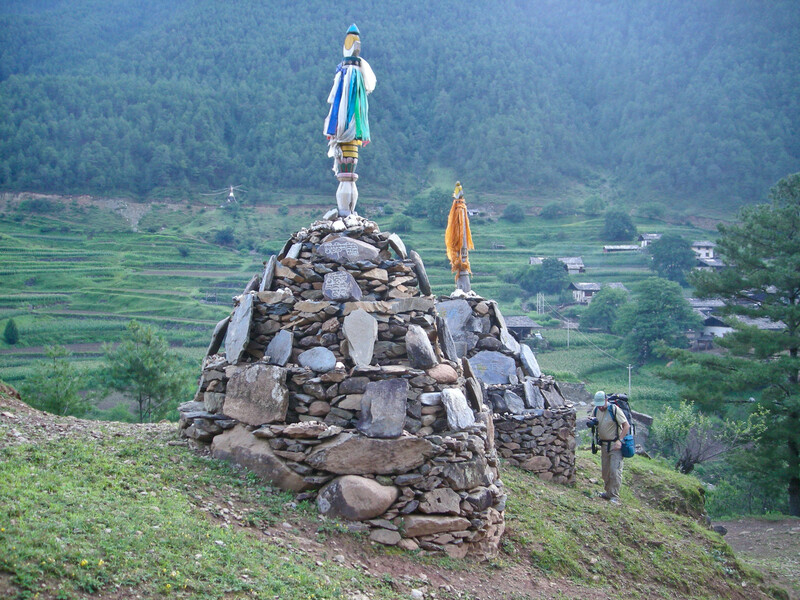 After another hour or so of hiking we came to a gate over the road with a sign saying “Niru.” We had finally arrived. 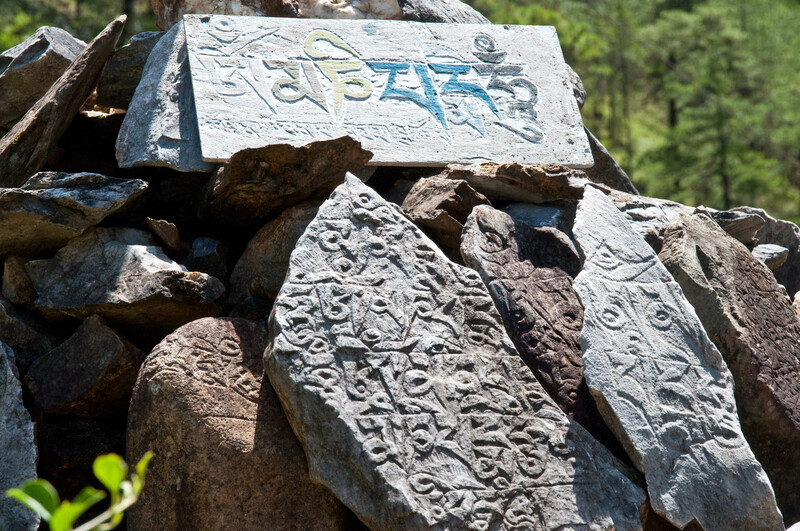 This was the beginning of the Tibetan area. 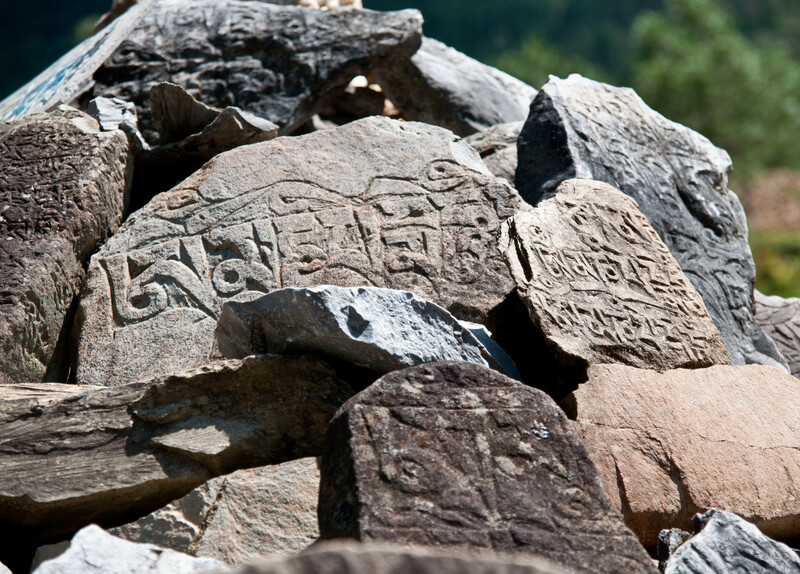 At the top of the sign was Tibetan writing with large Chinese characters below. We were pretty tired. 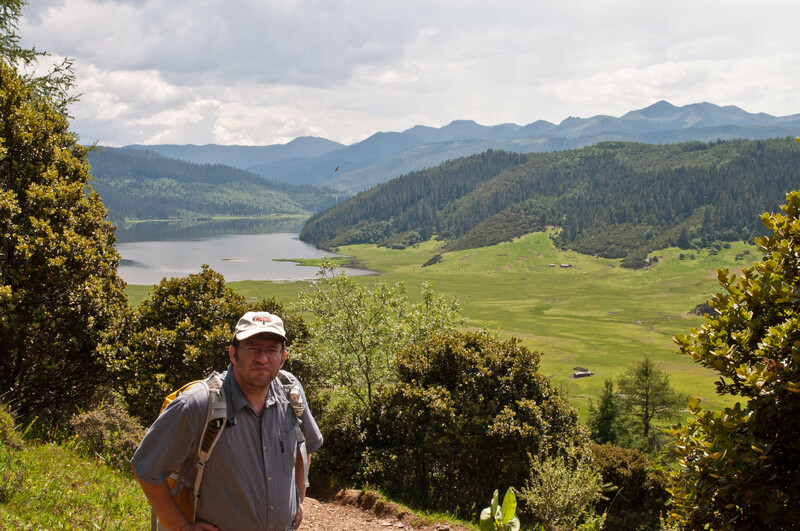 We had been hiking for about eight hours and had covered probably 15-17 kilometers. 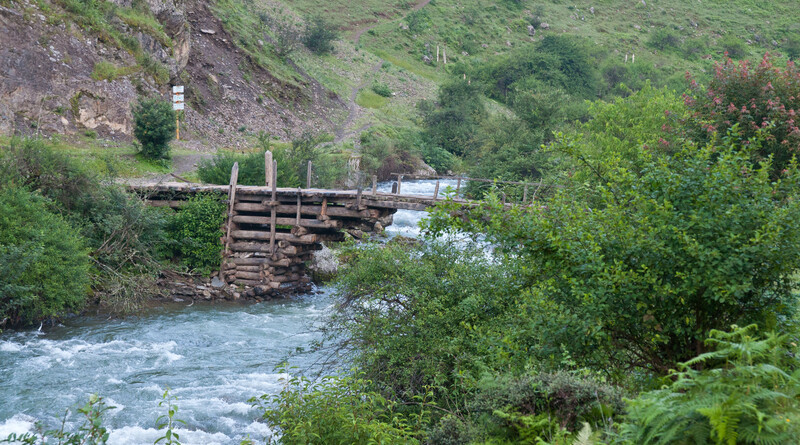 But we were disappointed that no village appeared, only occasionally farm house along the road or across the river. 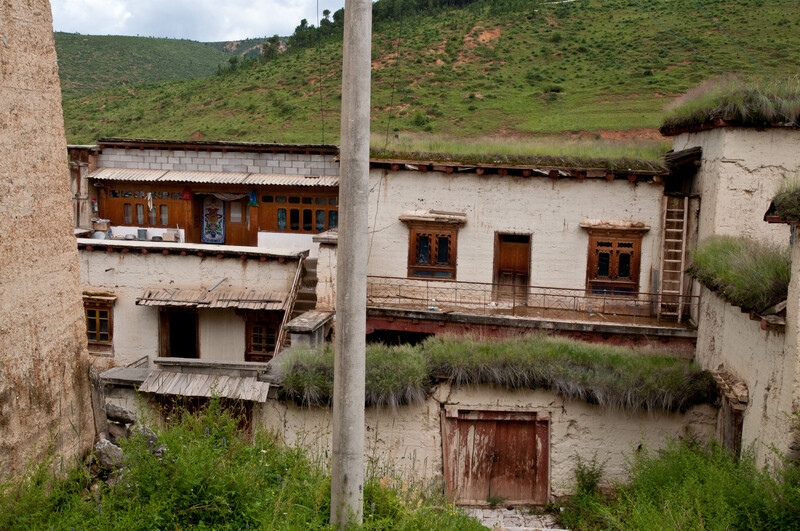 The homes here though were distinctively Tibetan. We began to get a little concerned about where we might stay for the night. It was getting late and we were tired. 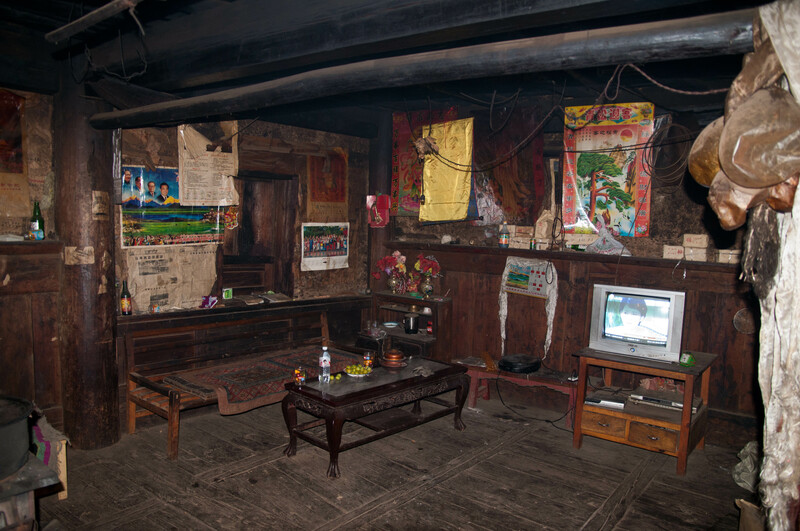 A few minutes later we approached a Tibetan farmhouse with a tattered sign advertising a guesthouse. The sign was all torn up and half of it was hanging down to the ground. It didn’t look too promising, so we decided to walk on a bit and see what we could see. Every time someone would pass in a car we would ask how far it was to Niru. We got everything from two hours to seven hours so we really did not know how much further it was to the village proper. 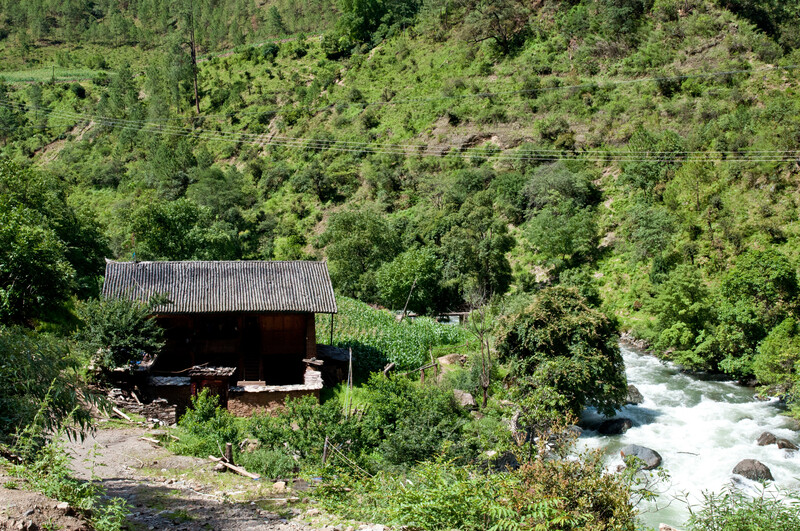 Another few kilometers up the road we met a farmer on the road in front of his house. It looked like a newly built house and was nicer than any of the other farmhouses we had seen along the way. We chatted for a bit, and asked him if we could stay at his place for the night. He said he could not house us, but didn’t really give any reason. I think he was kind of scared of maybe getting in trouble for housing foreigners without proper permission. 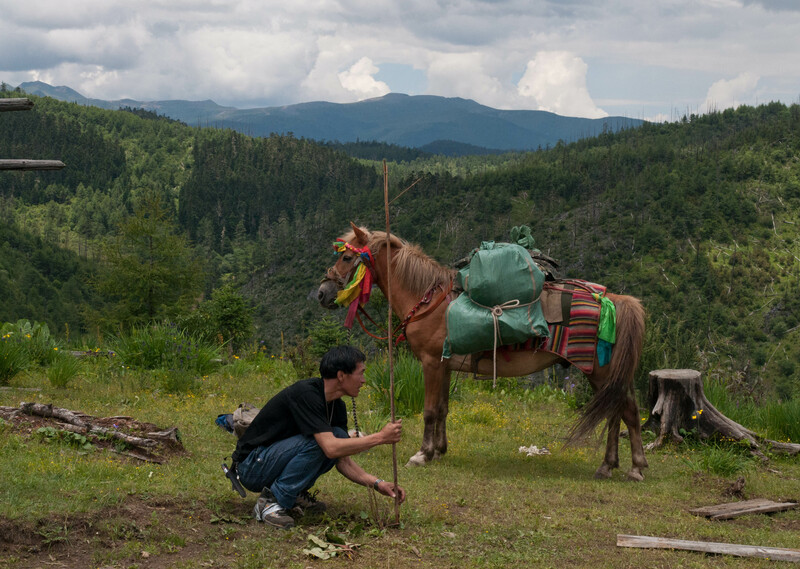 He told us that this valley was gearing up for the tourist trade but was not ready yet. He said there had been some tourist here, but they were all Chinese, never foreigners. He gave us some boiled water so we could make our instant noodles for dinner. 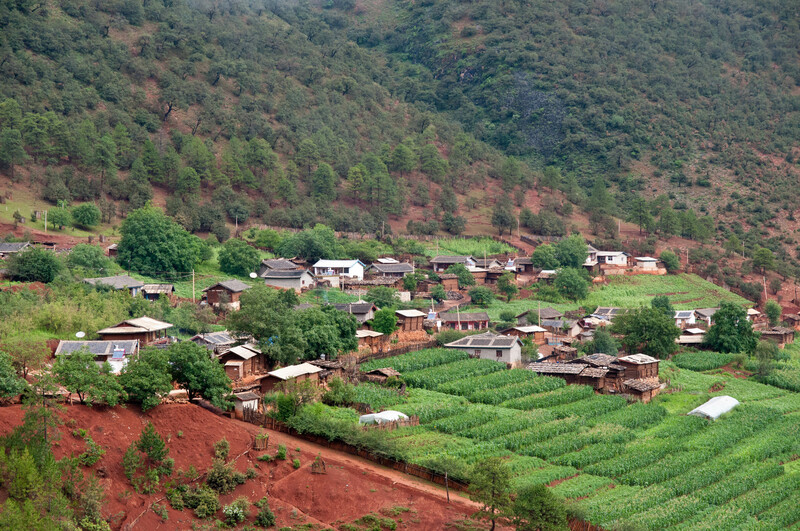 No one has heard of a Hongxiu Village. And so we sat on the side of the road eating our noodles wondering how far it was to the actual village. 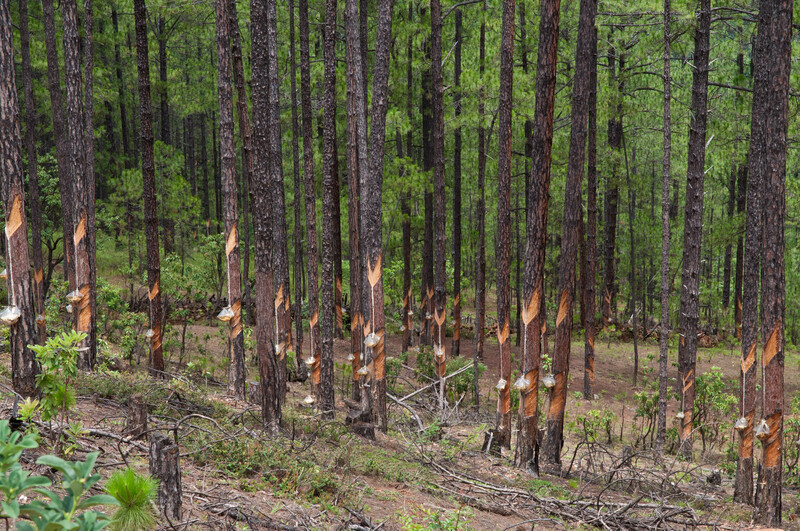 We sat on a log eating, a few black pigs rooting around in the brush behind us. 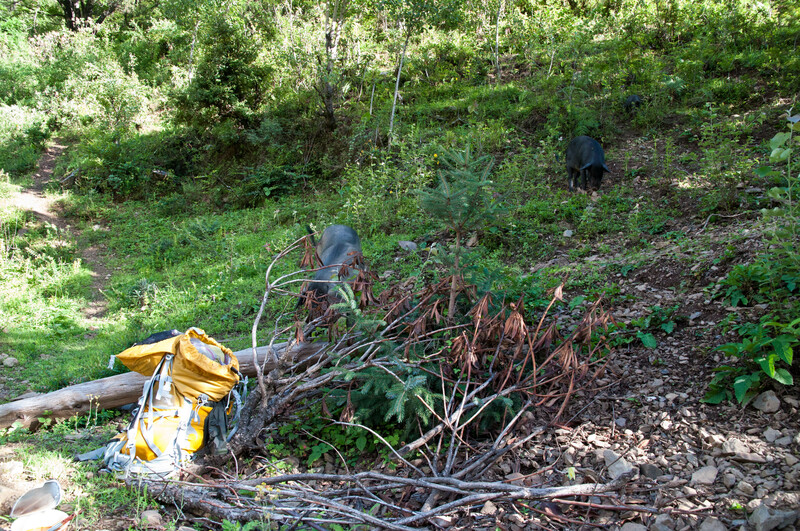 Michael’s stomach was acting up so he headed up the hillside into the woods to take care of business. 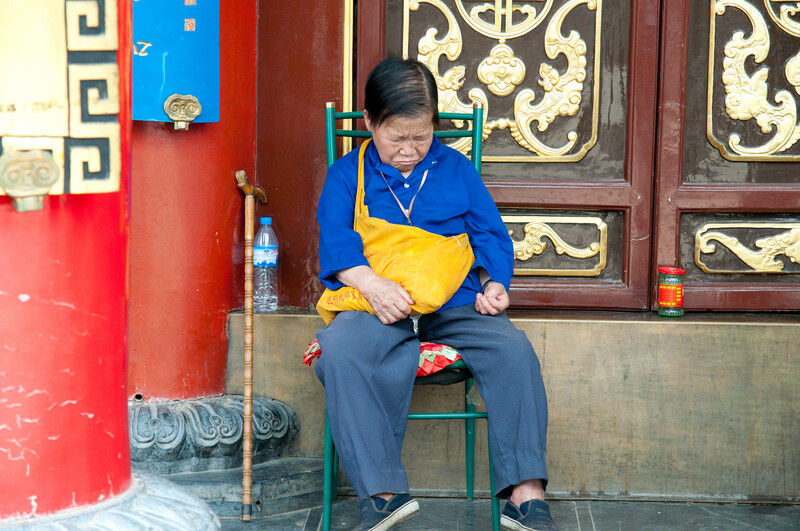 I sat alone enjoying the peace and quiet that I was so unaccustomed to in China. Dark clouds were moving in from up the valley and it looked like it might rain. 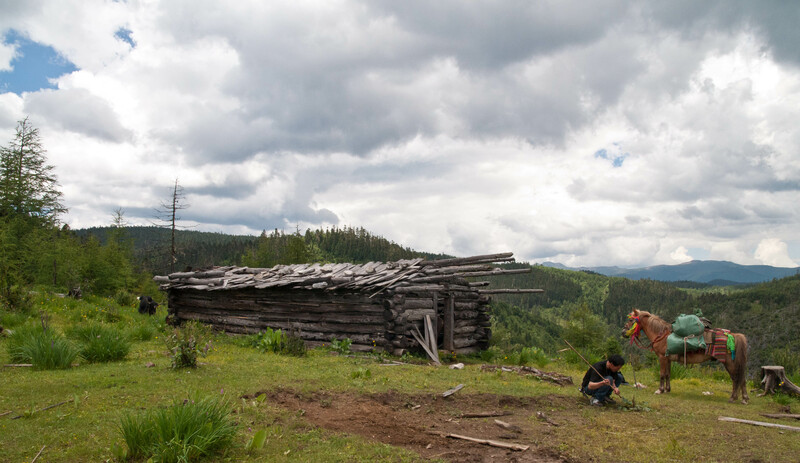 We had no camping gear, did not know how much further the village was, and could not find anyone around to take us in. 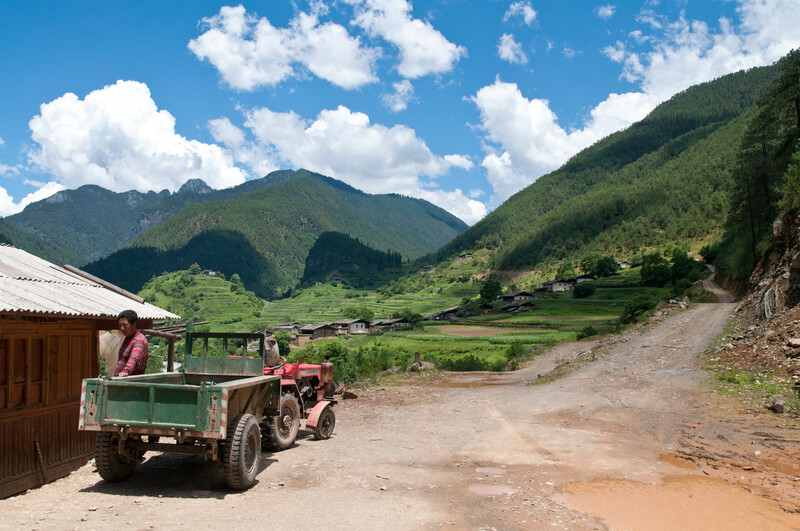 Most of the Tibetan farmers that we had seen would wave to us, then quickly disappear. As I sat there two kids, a teenaged girl and boy, came walking down the road from up the canyon. They were very surprised to see a foreigner sitting there on a log eating a bowl of noodles. Our conversation went like this. They both burst out laughing. They are both Tibetan, but give us their Chinese names. (I am intentionally not using their names here because, though the chances are remote, I do not want to risk getting them into any trouble). 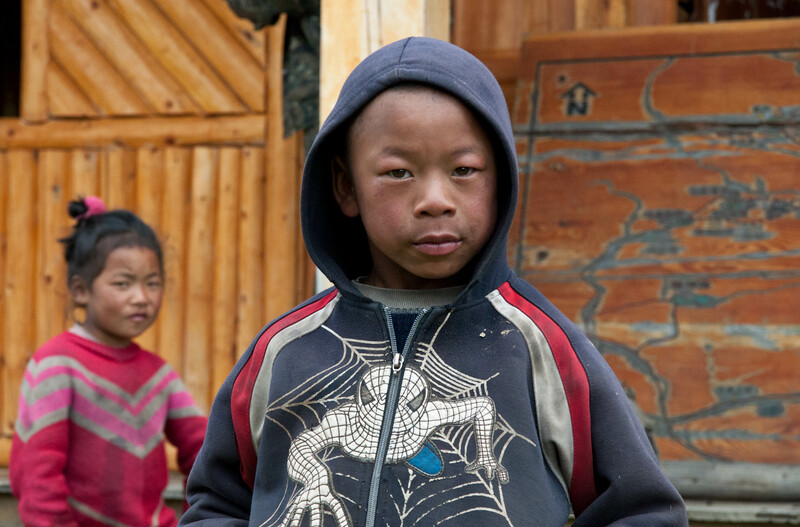 Many Tibetans have Chinese names, which sometimes are transliterations of their Tibetan names and sometimes are just made up Chinese names. 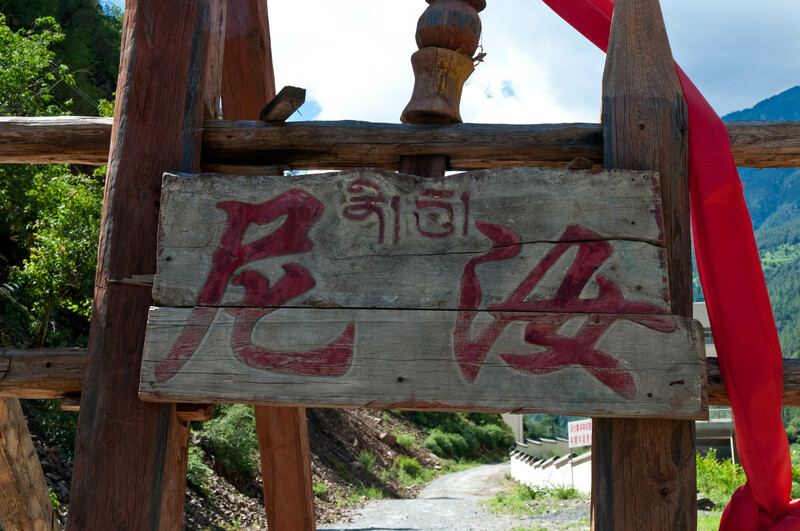 You cannot translate an English (or Tibetan) name into Chinese, so if you want a Chinese name, you get a native to help you pick out a Chinese name. She is fifteen years old, he is seventeen, and she is actually his aunt. 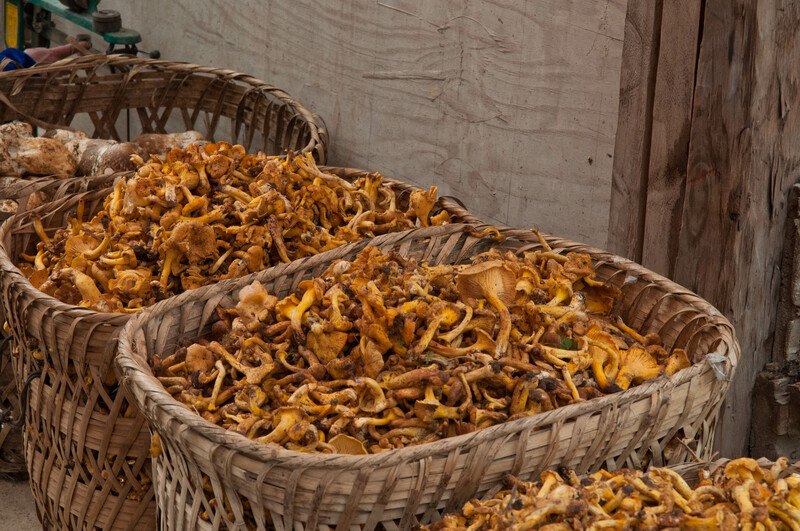 They have just returned from ten days in the mountains picking wild mushrooms. 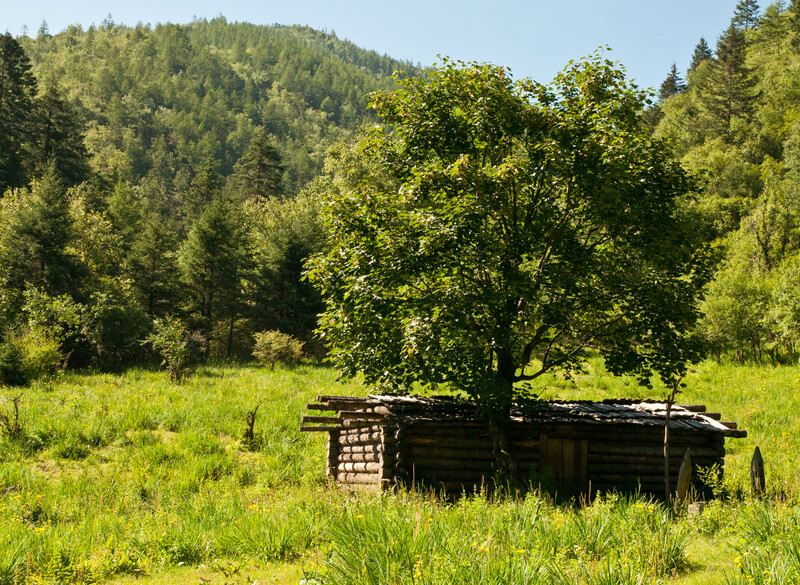 Their families have a cabin up in the mountains where they stay with a couple other families, picking mushrooms. 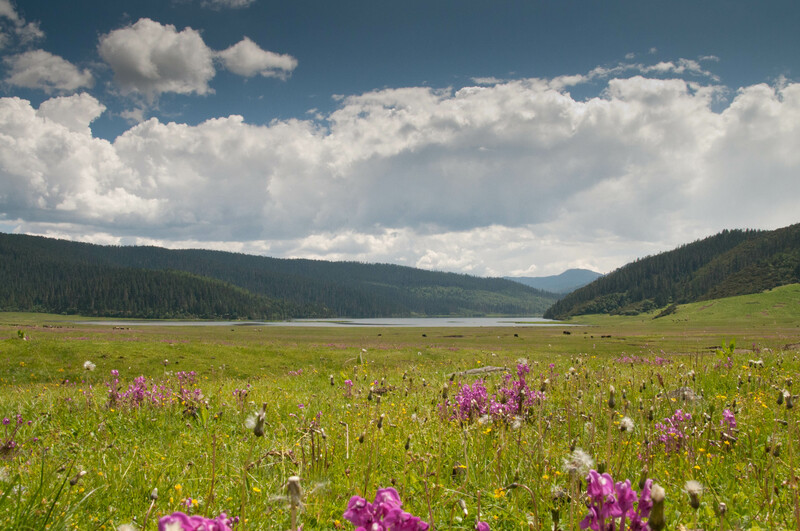 They had come down into the valley and sold their mushroom crop to a buyer who would then sell them in Shangri-la. 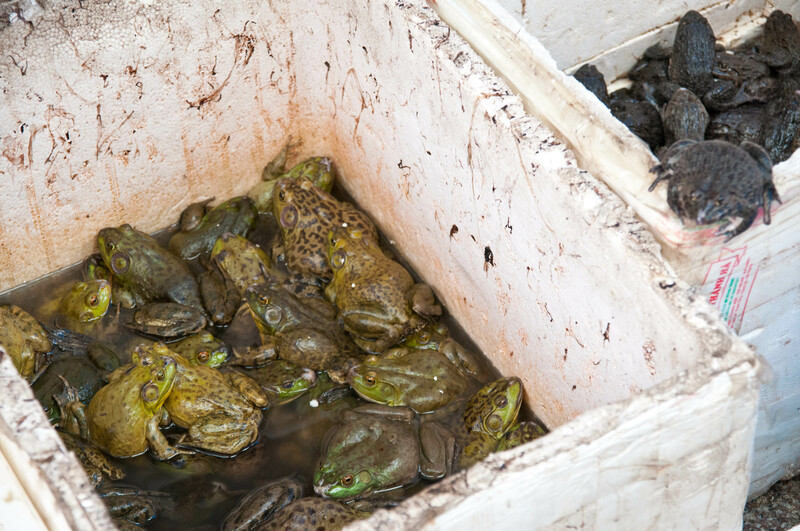 They were returning home for the night to clean up. She would then head back up to the mushroom camp, and he would stay at home, while his mom would head up to the camp. They offered to help us find a place to stay. So we headed back down the road, from where we had come. 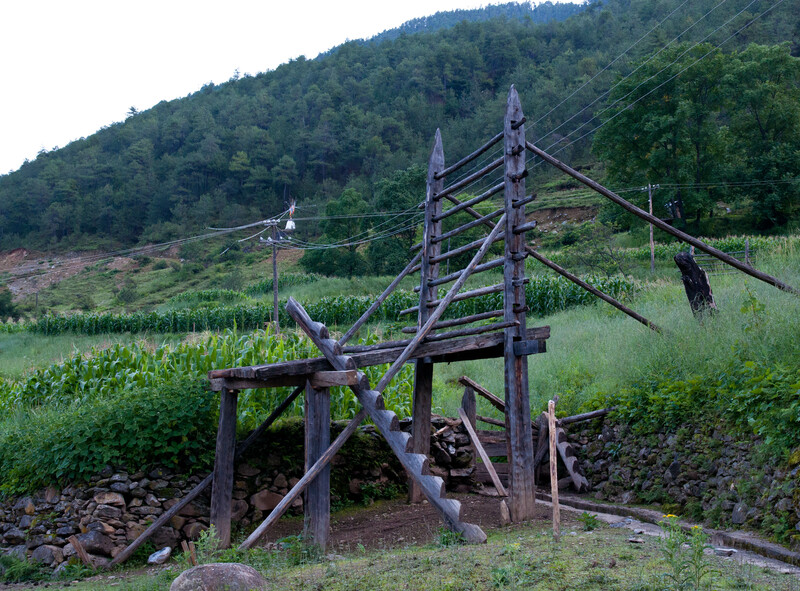 When we would arrive at a farm, they would shout out (in Tibetan) to the residents. They knew everyone all up and down the valley. No one seemed to be around and they were perplexed. 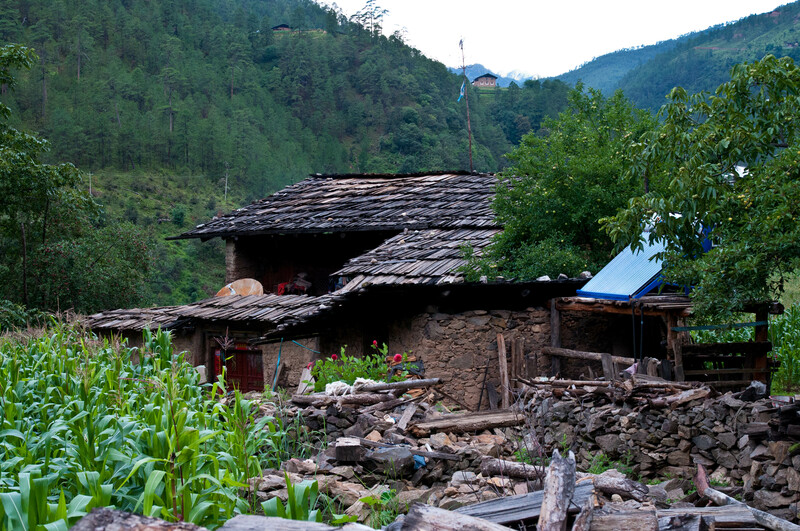 When we arrived at the farm with the tattered guesthouse sign, they shouted out to a women in the courtyard of the home. She looked up, saw us foreigners, then quickly disappeared into her house She would not come out no matter how much the kids called out. They were both very amused by this. Finally, they suggest that we just come home with them. I tell them that I don’t think their mothers would approve of them dragging home two middle-aged white foreigners. They laugh again and assure us it will be fine. They tell us that their mothers have never seen foreigners before and will really enjoy it. I continue to resist, until the boy finally says, “I’ll call my mom and ask if its okay.” To our surprise he pulls a cell phone out of his pocket and proceeds to call his mom. 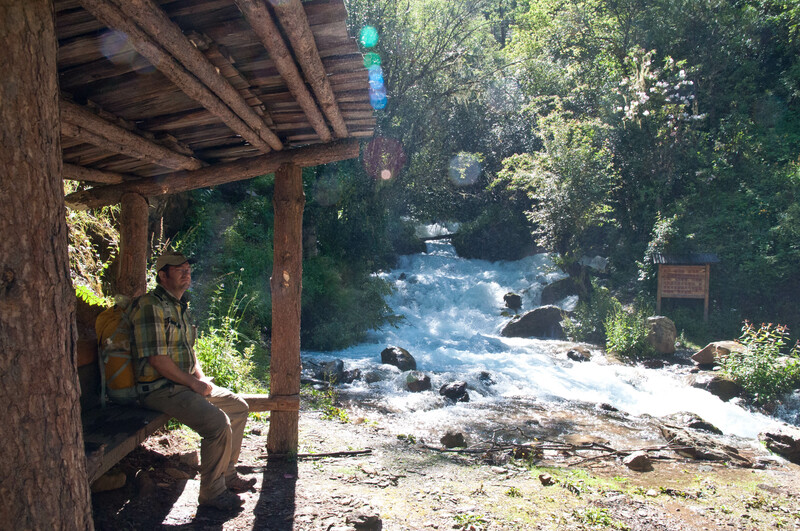 We cannot believe that there is cell phone coverage up this remote valley. The girl explains that there is pretty good coverage all up and down the valley. Cell phone coverage all over China is pretty good, but we did not expect it up here. The conversation with his mother is all in Tibetan so we cannot tell what is said. 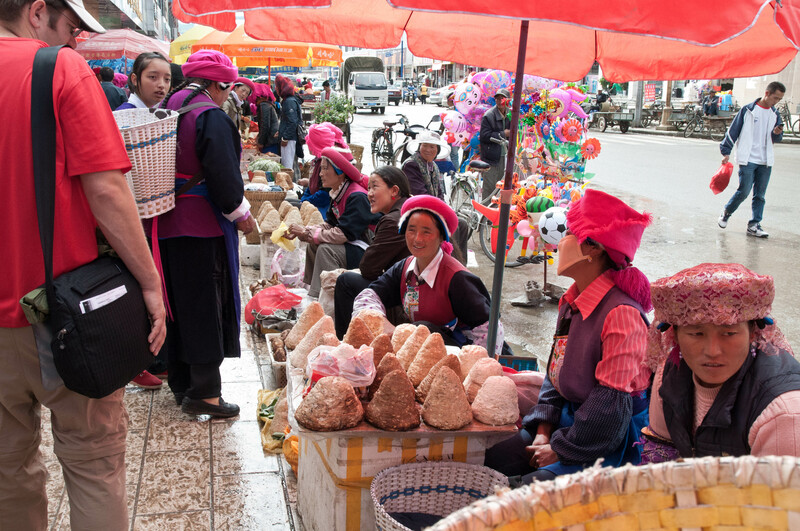 In fact we have both studied a little Tibetan before this trip, but we learned very quickly that we were learning standard Lhasa Tibetan, and the dialect spoken in this area was quite different. So our efforts did not help us too much, except for some basic greetings. Our driver also taught us some basic phrases while we were driving out to Luoji. He tells us that his mom said it was okay for us to stay the night at his house. Michael and I look at each other, shrug our shoulders, and gratefully follow them down the road. 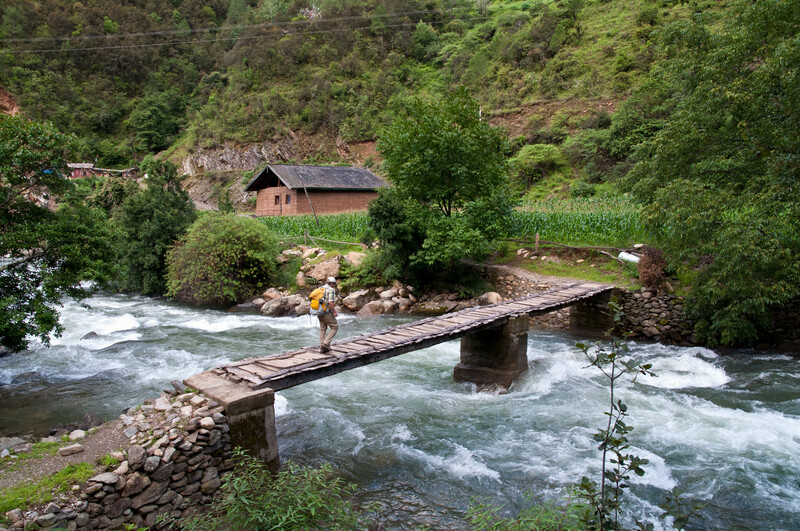 We hike back down the road for two or three kilometers, before leaving the road and crossing a rickety bridge across the river. 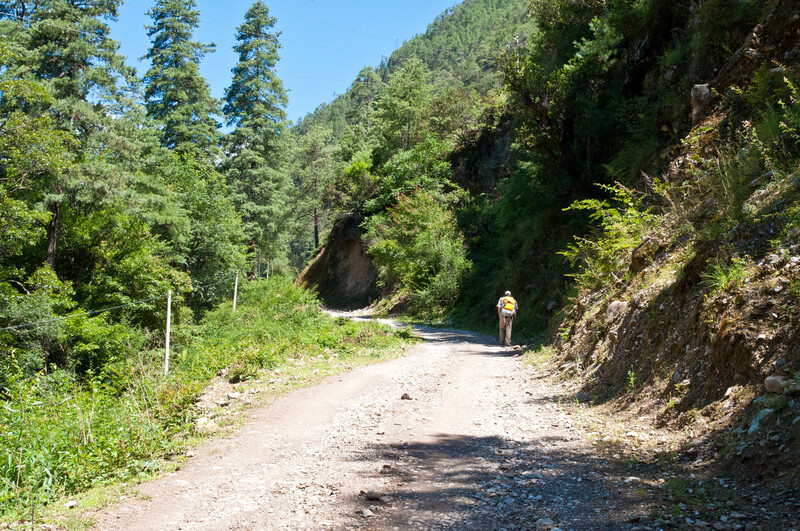 We then follow them up a very steep, narrow trail up a mountainside to the top of a bluff where there are two traditional Tibetan houses surrounded by cornfields. The first house is where the girl lives, and the second house is where the boy lives. We all proceed to his house. 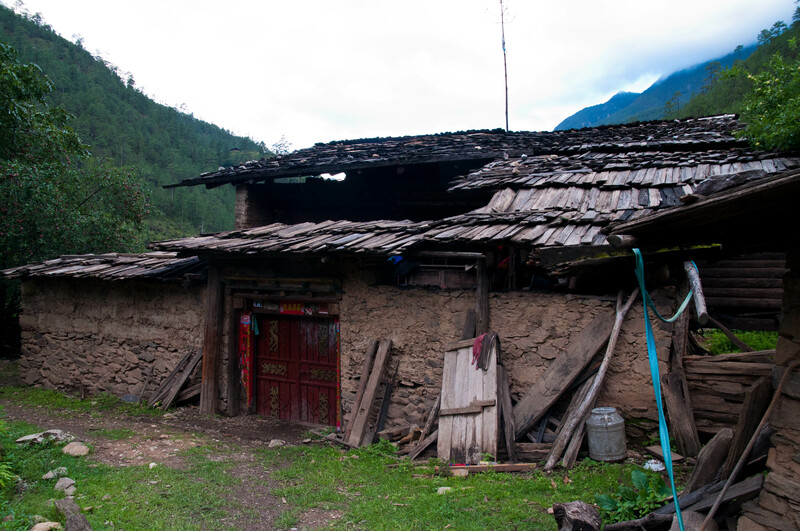 These houses are similar to the ones we had seen in the outskirts of Shangri-la, though they are much smaller, and more rustic. There is a high wall around the house and a gate that opens into a courtyard. The courtyard is covered to depth of about 18 inches with leaves and branches. This is to absorb the animal waste. 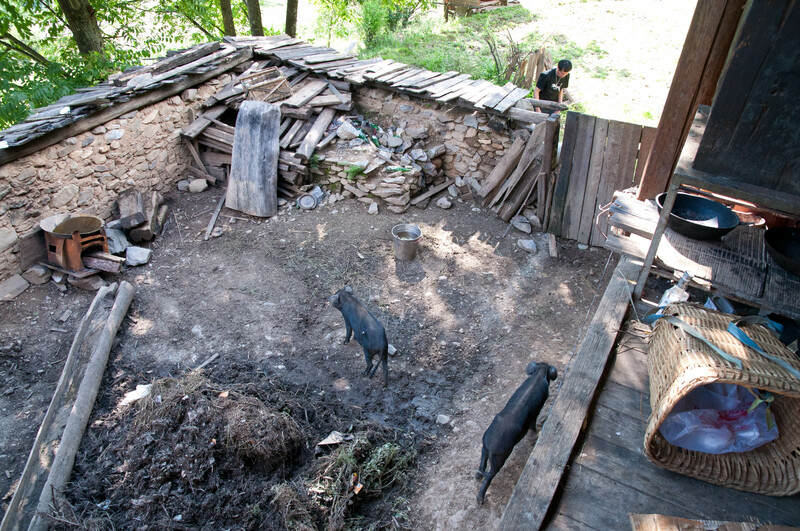 There are several small black pigs there as well as several chickens. We walk across the small courtyard, and up a steep wooden stairway to the second floor and into the house. It is post and beam construction, made entirely of wood. 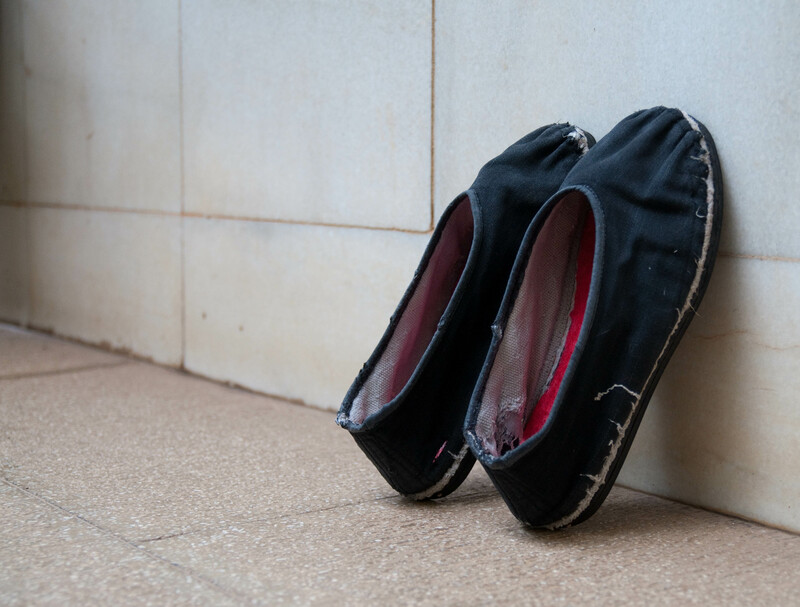 The floor is rough wooden planks, burnished smooth by countless footfalls. There are no glass windows, just one small opening, a out two feet square, with a wooden door over it. It is very dark inside, only illuminated by two large, but very dim bare light bulbs hanging from the ceiling. It smells like wood smoke. His mother greets us warmly, a broad smile spreading across her wind burned face. 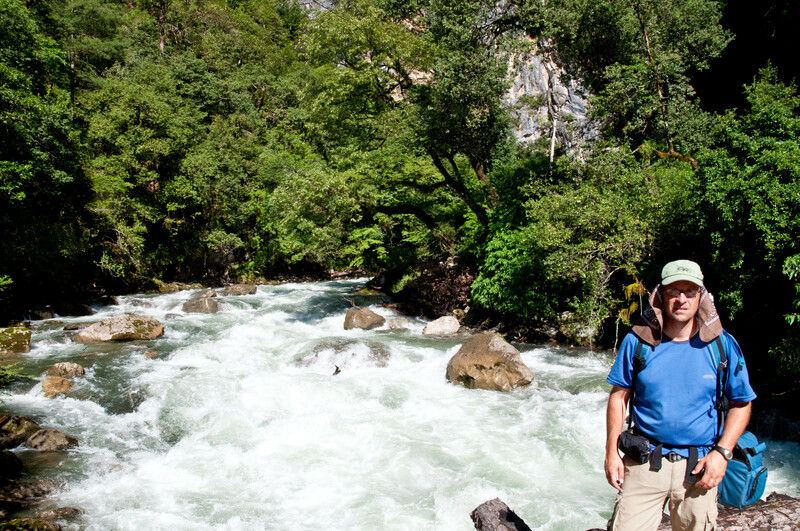 It is obvious that this woman has spent her life working in the outdoors. 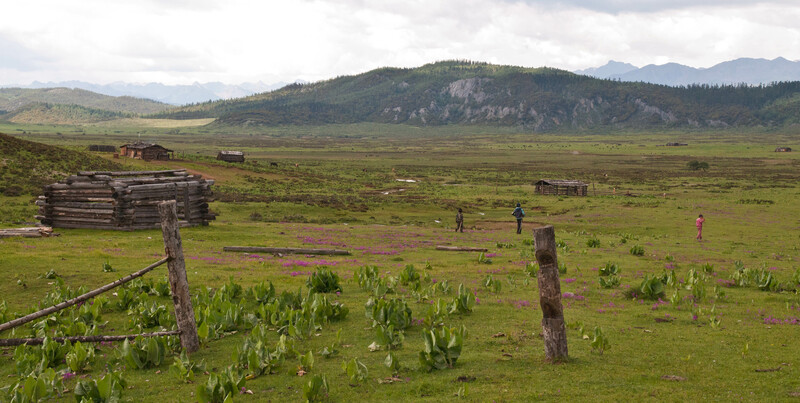 No fancy headdress or colorful clothing out here in this remote area. On one side of the room is the open fire for cooking. There is a large steel wok in a kind of frame over the fire. 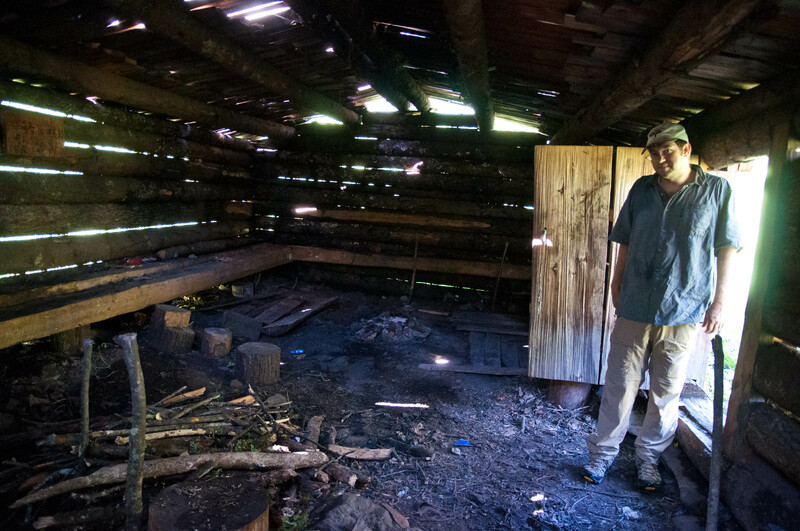 Next to it is a steel woodburning stove that they use for heat in the winter. 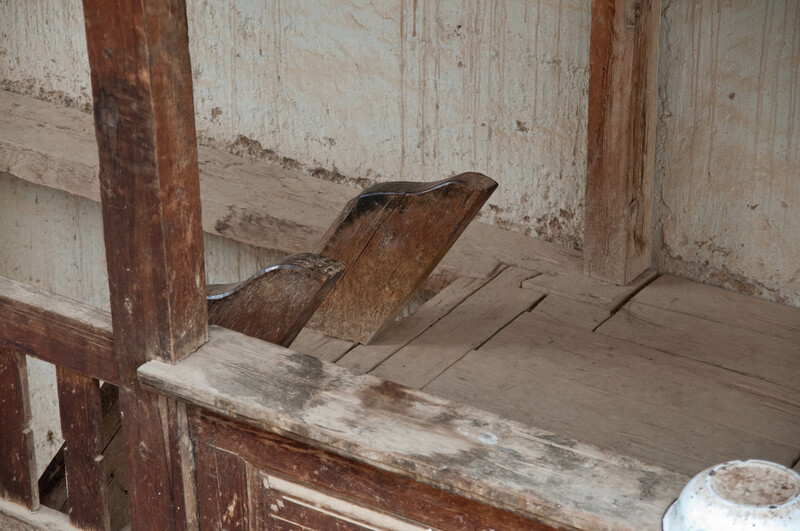 The only furniture in the room are two low wooden platforms that are used for sitting. They are all quite excited to have guests, especially foreigners. The mother gets busy cooking a simple meal. 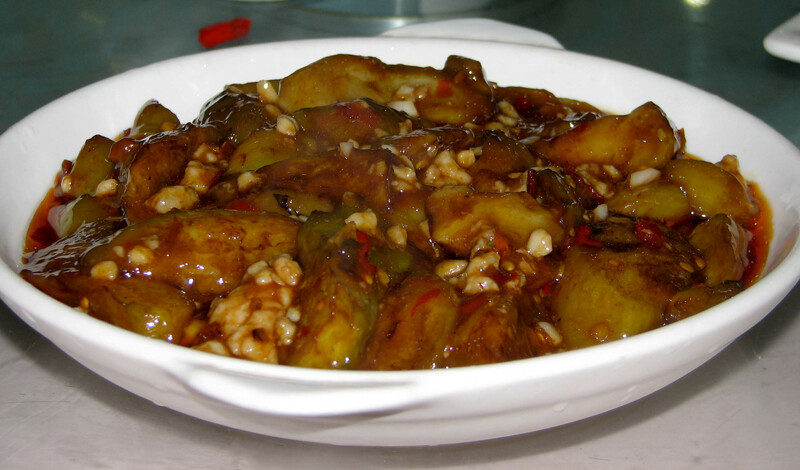 It consists of stir-fried potatoes with just a little salt, and some stir-fried squash and some yak cheese. It is very simple, but much appreciated. 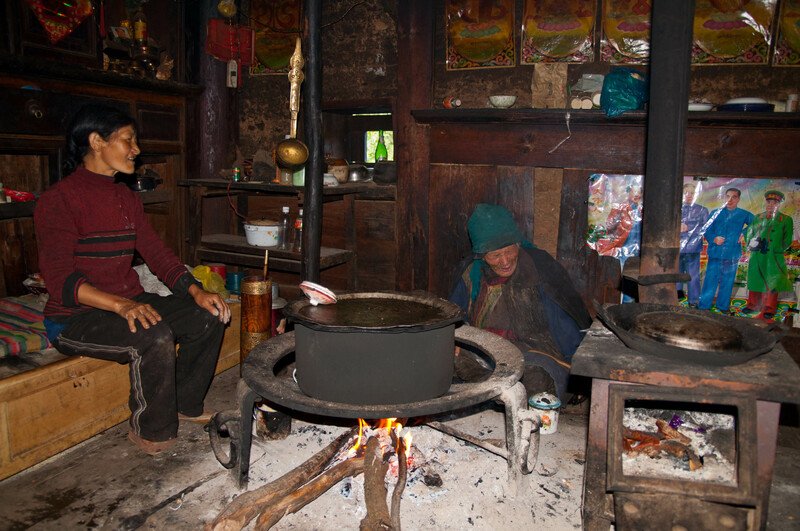 They cook over an open fire indoors. Above the fire is a woven platform where cheese is stored. Above this is a hole in the ceiling where the smoke mostly dissipates into the third floor storage area. 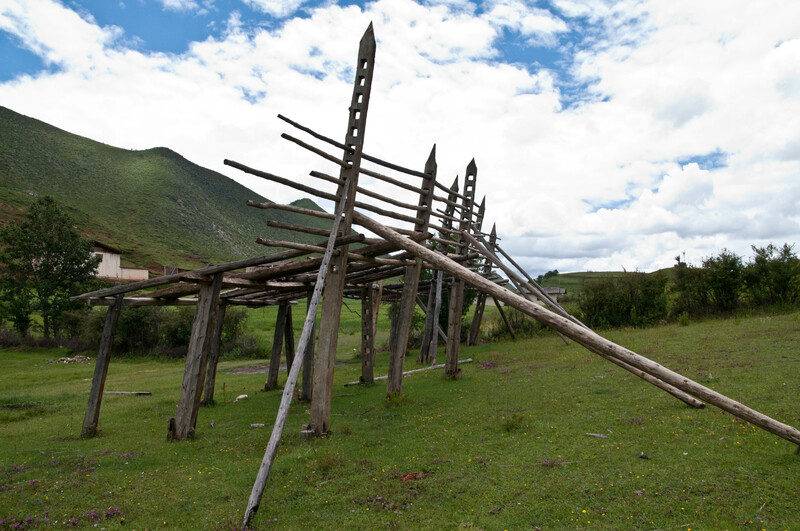 This is where they store grain, corn and barley, yak hides, chili peppers, and so on. They grow corn and squash. 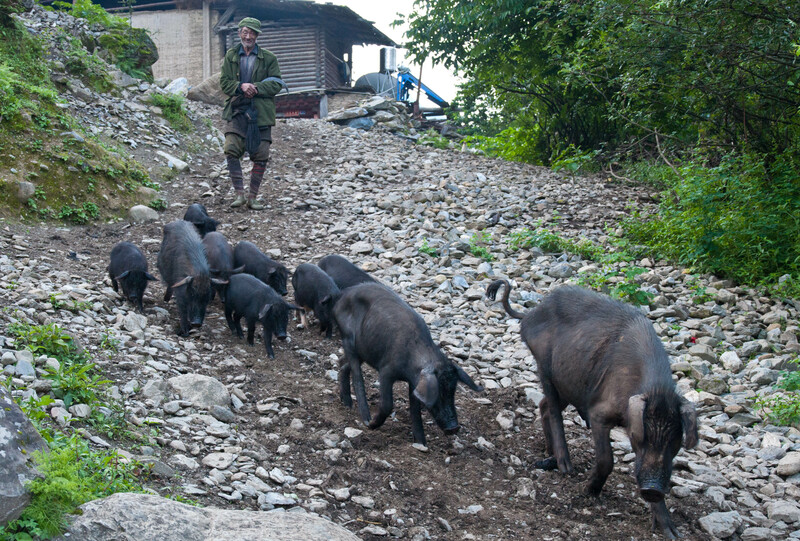 They collect wild mushrooms, raise pigs and chickens, and rely heavily on yaks for butter, cheese, meat, and their skins for clothing and tents. 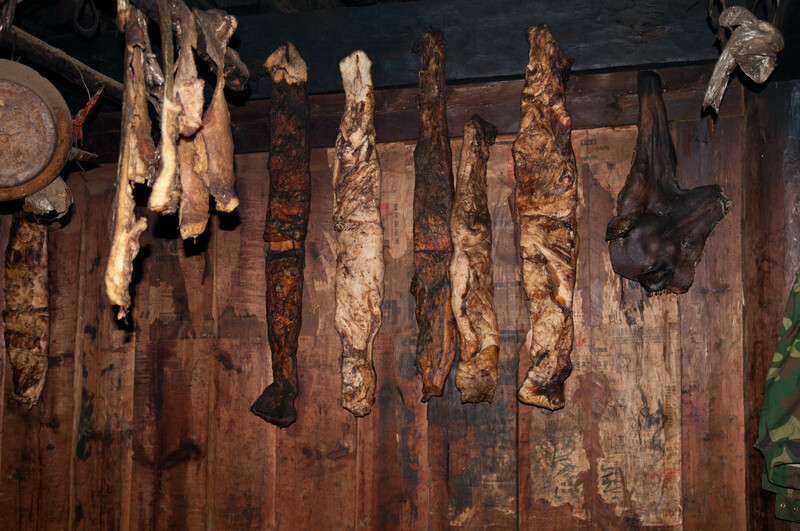 Smoked and dried pork hangs from the ceiling. 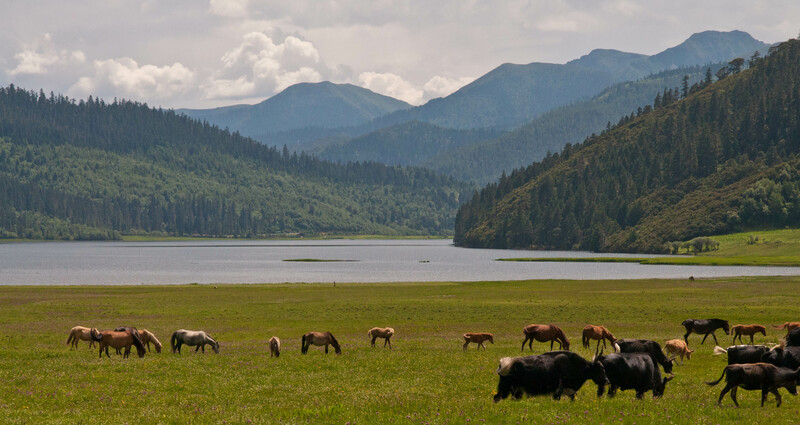 The men are with the yaks in the high summer pastures. 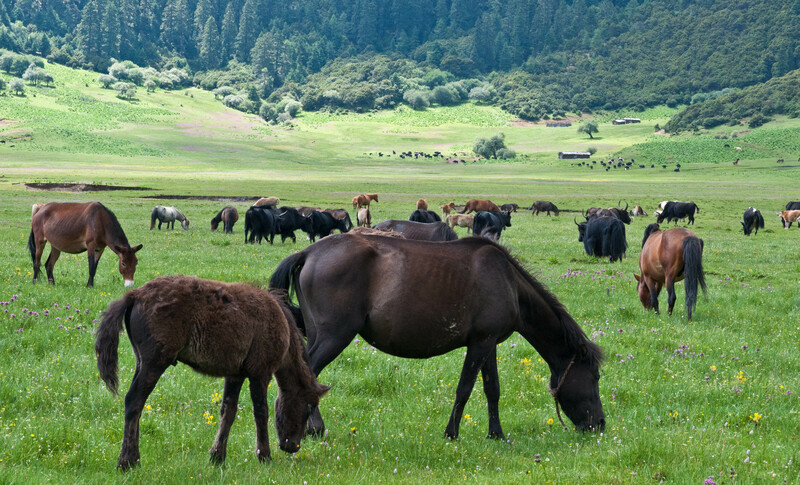 In fact, the fathers are away most of the year with their yak herds. 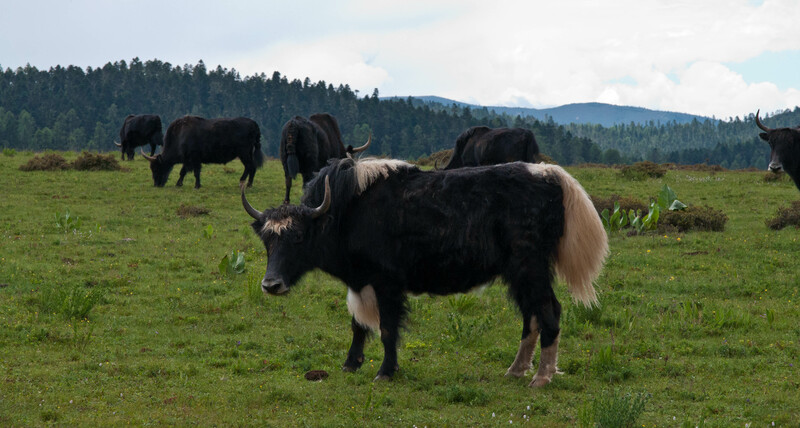 The boy’s older brother is with his father and the yak herds. There is no running water in the house. They collect water from a nearby creek, and store it in a large, probably 30 gallon barrel, in the corner of the large room. There is no bathroom. At one point I have to go and ask the boy where I should go. He laughs, as if this is a ridiculous question, and simply says, just go anywhere outside. 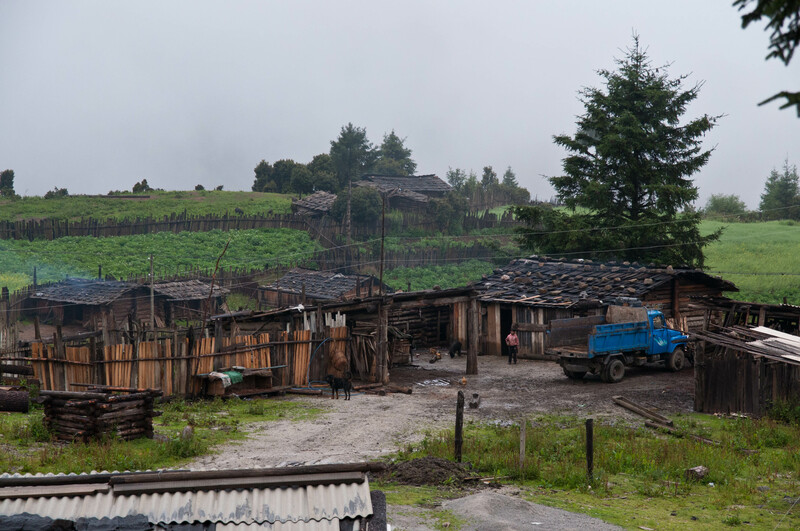 As rustic as these farmhouses are, they all have satellite television, and solar hot water heaters with cisterns on a high platform. So there is hot water to wash with. The girl is a sophomore in high school. She boards at the high school in Shangri-la during the school year. She has very good Mandarin Chinese. She tells us all about her schooling, even pulling out some of her textbooks. She also studies English and shows us one of her English textbooks, but she cannot really say much in English. The boy only attended through primary school. As a result his Chinese is heavily accented and we sometimes have a hard time understanding what he is saying. But he is very patient with us, and laughs often. They are very gracious hosts, and allow me to take lots of pictures of them and their humble home. Realizing that I have a camera, they want me to take pictures of them in their formal, traditional dress. They run into one of the two bedrooms, off the main room, and return with a pile of brightly colored clothing. 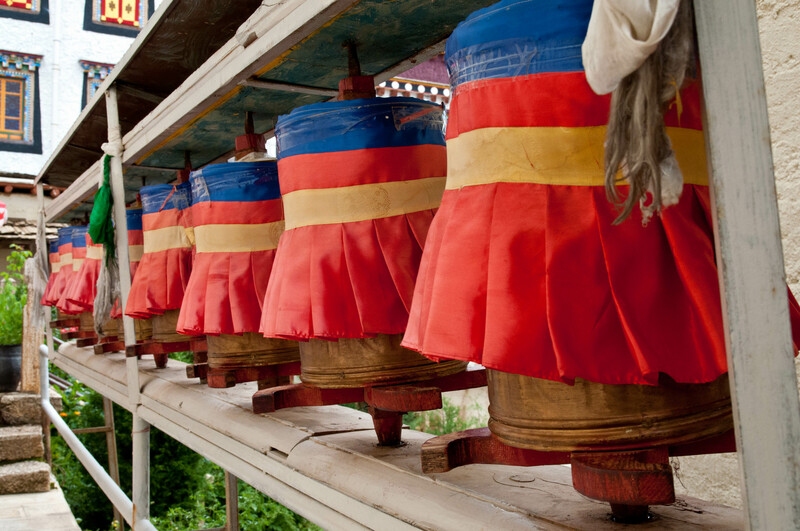 They proceed to dress up in their traditional clothing that they wear at weddings and during the Tibetan New Year celebrations. They are beautiful and all hand made. After taking photos of them, they insist that we try on the clothes as well. 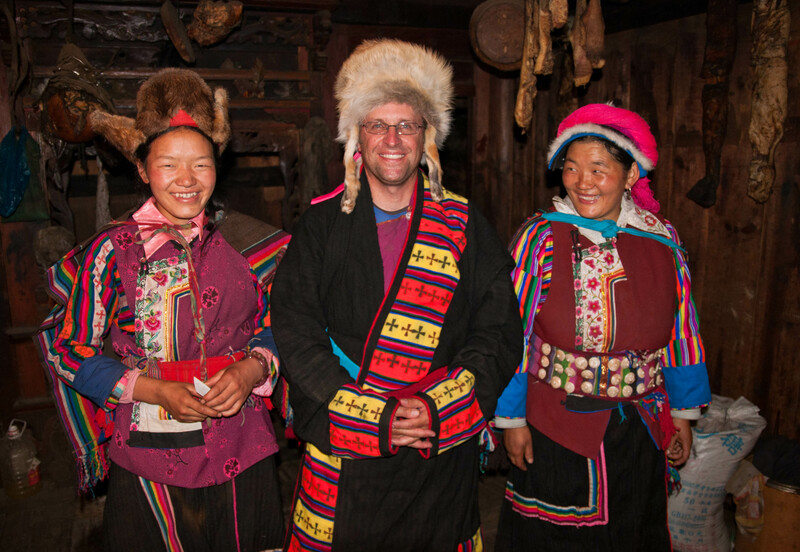 They are very amused and laugh when we try on their these traditional clothing. We laugh along with them as we contemplate what we are doing, and the good luck that has brought us here. The black robe I try on his made from yak wool and is heavy and thick. The hat is made from fox fur. We have a very enjoyable evening visiting with them. It’s getting late and they need to get up early in the morning. In fact the boy’s mother is getting up at 2:00 am to head up to the mushroom picking camp. 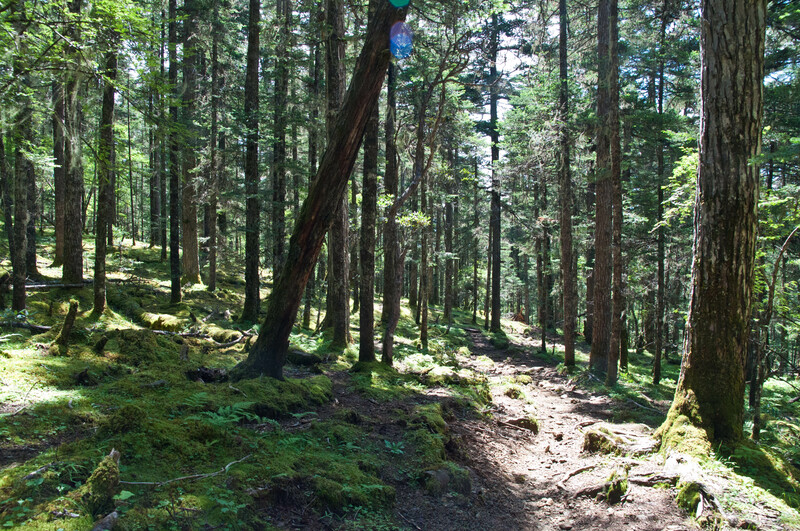 It is a ten to twelve hour hike up into the mountains. The girl prepares to go home and tells us that we need to stop by in the morning before we leave to have some fresh milk from their cow. 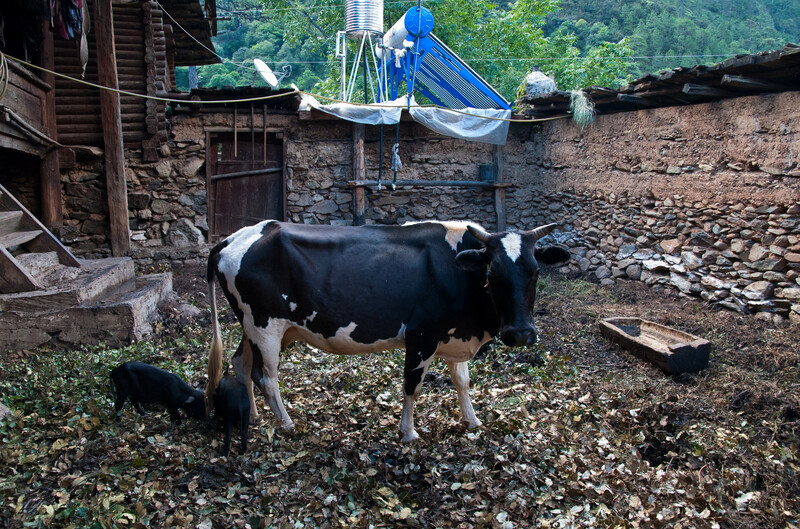 She is very proud of the fact that they have a milk cow. 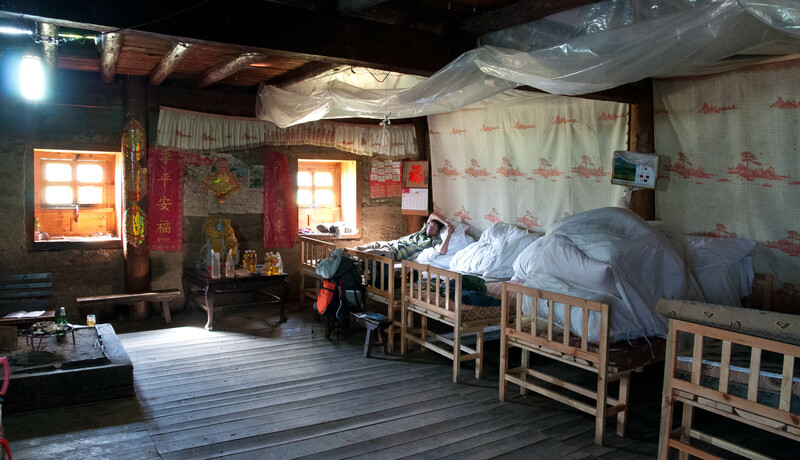 They prepare a bed for us by pushing the two wooden platforms together. They throw a wool rug over it, with a couple more heavy wool blankets and a couple pillows. We have travel sheets that we use as well. It is a very hard bed, but we are grateful to have a place to sleep. When they turn the lights out the room is absolutely pitch dark. 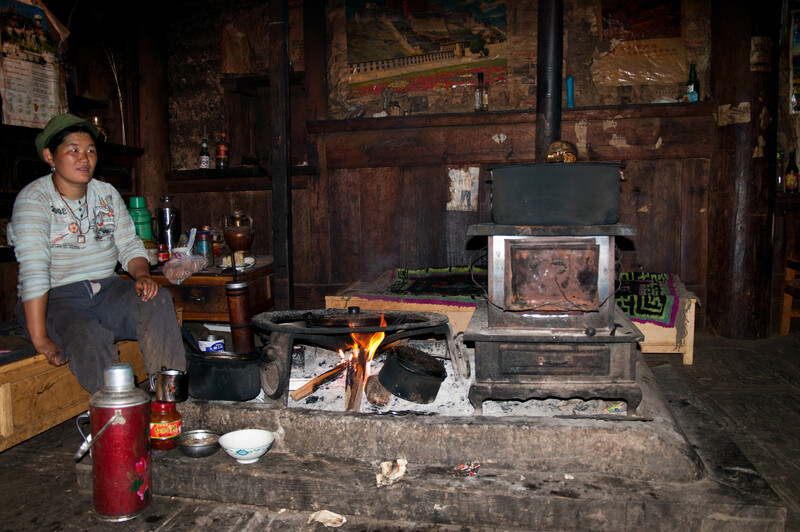 The mother is up early, re-stoking the fire and making yak butter tea, then she is off. Later that morning, around 7:30, the boy is up re-stoking the fire and preparing breakfast for us. 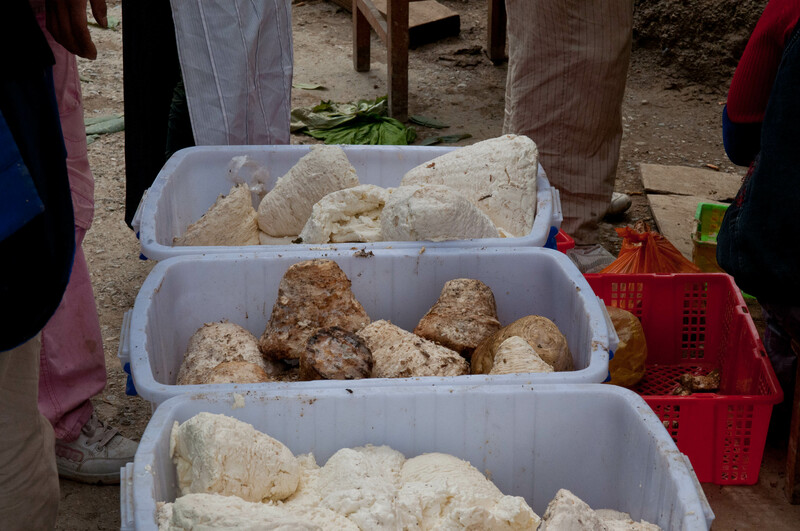 We have traditional Tibetan tsampa, which is really just barley flour, yak cheese, and yak butter tea. 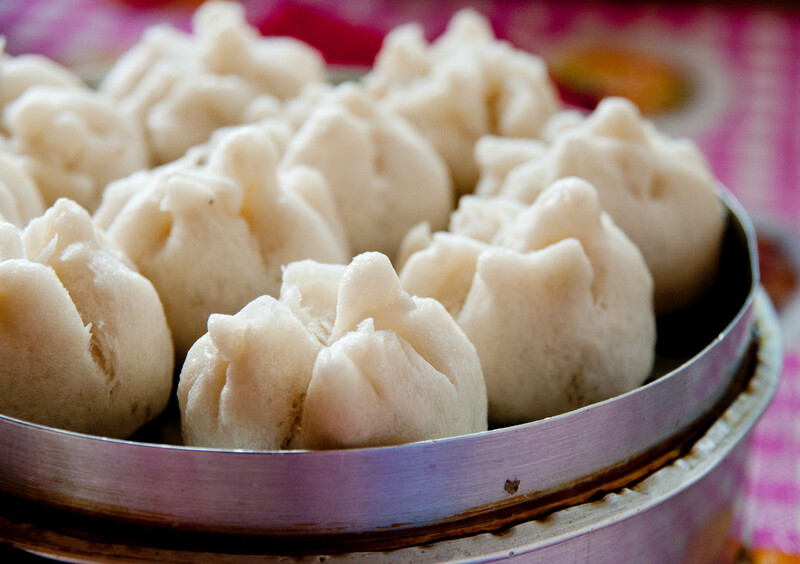 In some Tibetan areas tsampa is made by mixing barley flour with yak butter tea to form round dough balls. 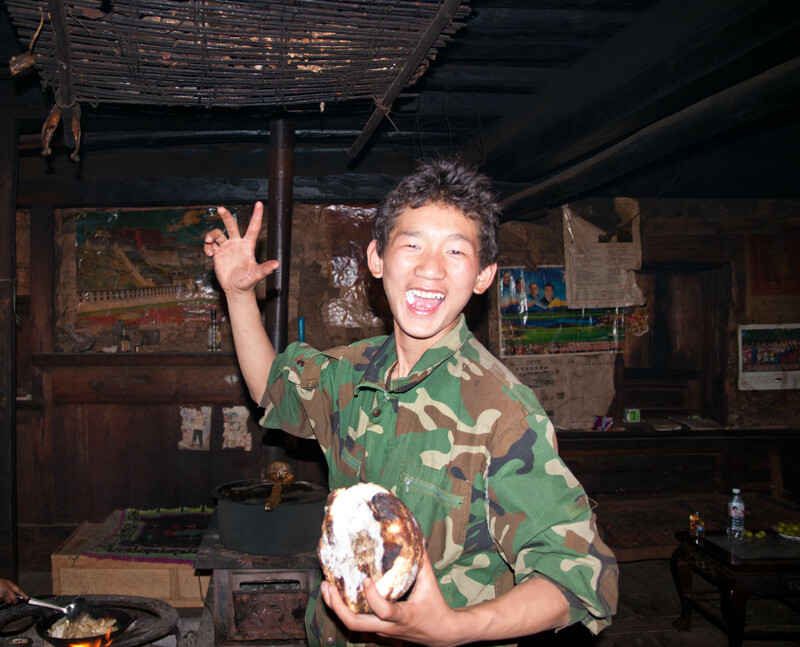 For many Tibetans, this is their primary diet, along with lots of butter tea. 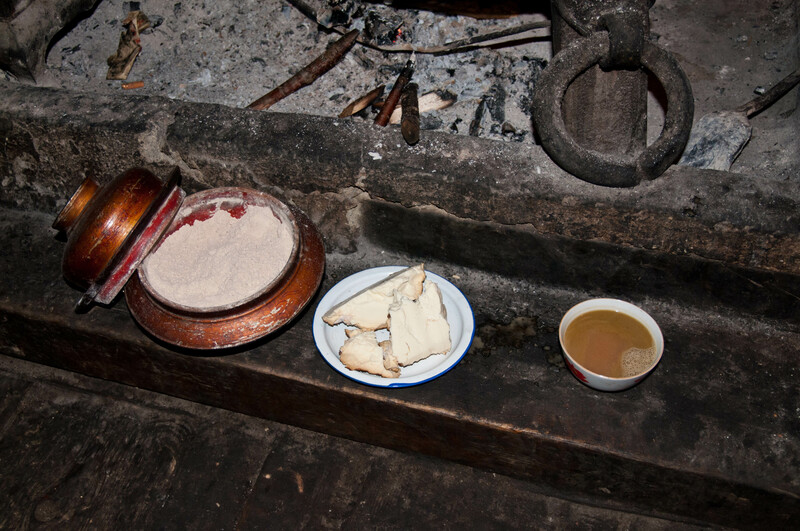 In this area the barley flour is eaten raw accompanied with butter tea. You just grab a pinch of flour and pop it into your mouth, and wash it down with tea. 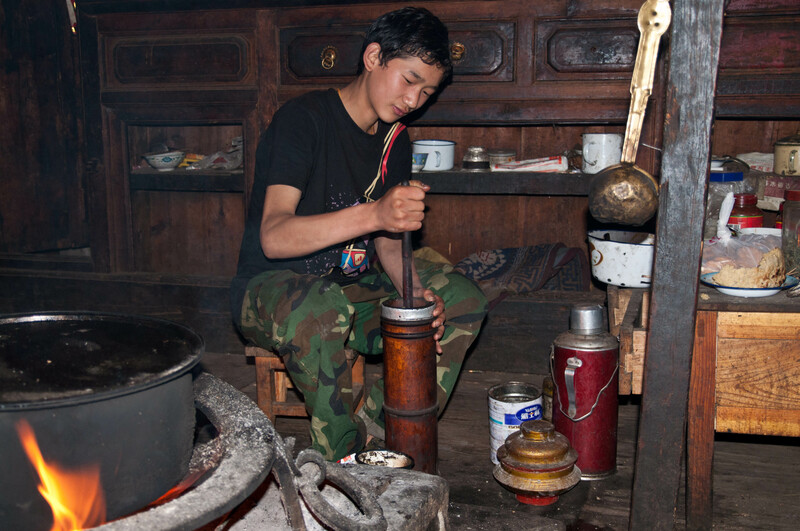 Yak butter tea is made with hot water, yak butter, salt and tea leaves. 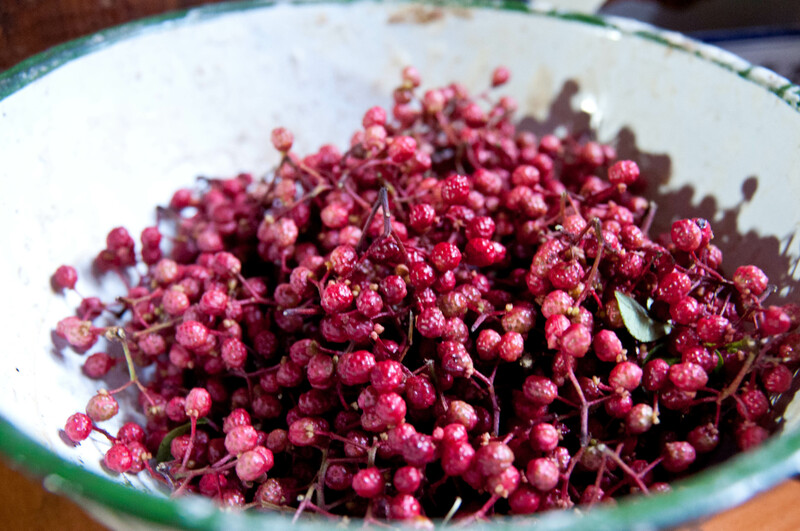 It is very strong, and most westerners have a difficult time getting it down. The tea is prepared in a wooden cylindrical churn. It wasn’t the most appetizing breakfast, but what a unique cultural experience. We were profoundly grateful to be having this experience. After breakfast, we pack up and head next door. We meet the girl’s mother, and her 90-something year old grandmother, who has been blind for the past twenty years. 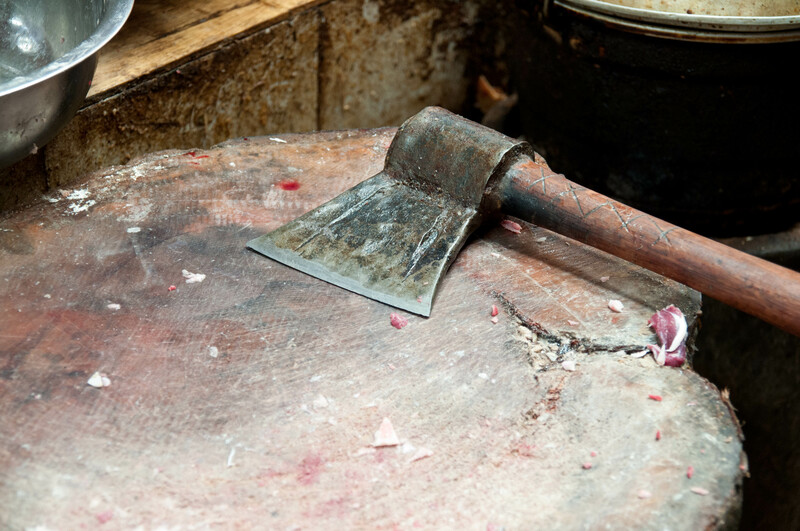 No doubt cooking over a fire indoors for many years had something to do with that. 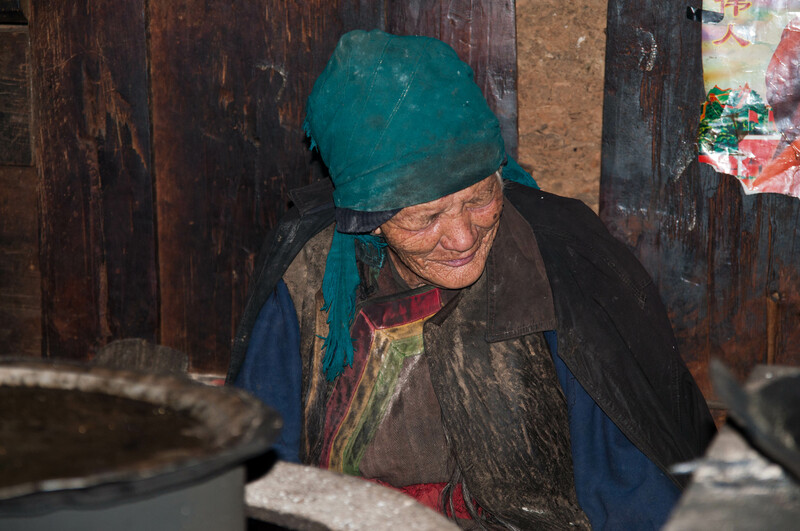 The mothers speak just a little Chinese, but the grandmother only speaks Tibetan. The proudly serve us each a large bowl of milk. To our surprise it is very sour and full of curds. We sip it tentatively. Michael leans over and says he’s going to hurl if he has to drink any more. I’m trying not to laugh. I guess I have learned to mentally shut out gross things and just put them down. But I admit, the sour, curdled milk is pretty bad. 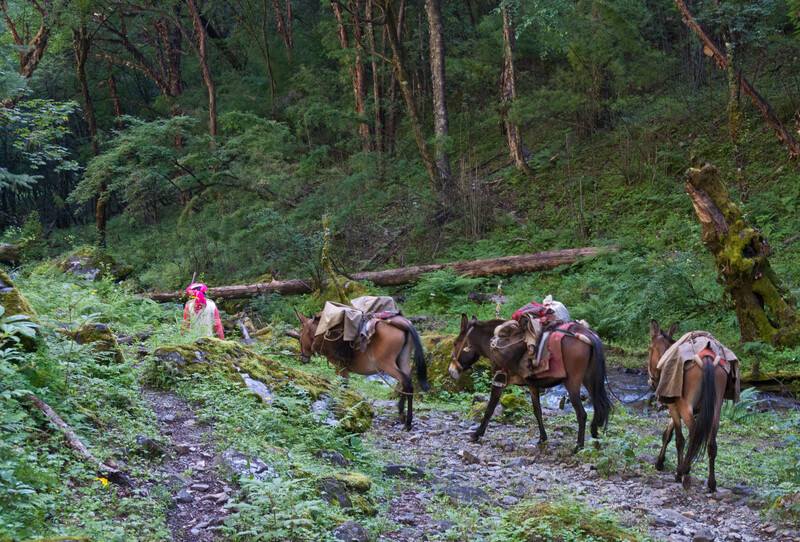 After a short visit, we thank them, and head down the steep trail, across the river, and back onto the road. 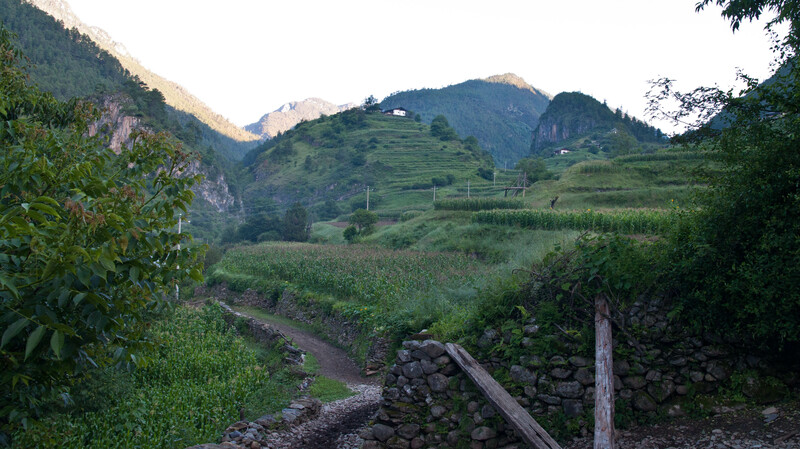 They assure us it is only about a four hour walk to the village of Niru. 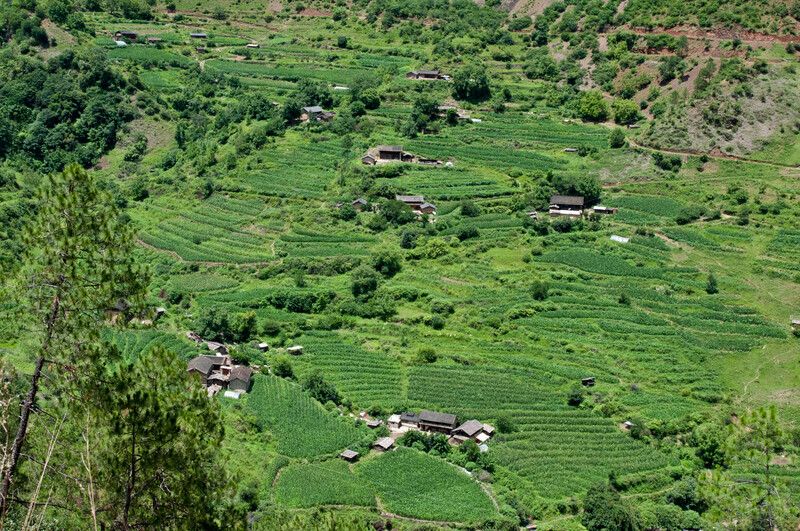 It turns out that this whole long section of the valley is technically Niru village, but at the end of the valley is the cluster of homes that constitute the village proper. The city of Shangri-la looking toward the old town. Buddhist temple on the right and a huge prayer wheel on the left. 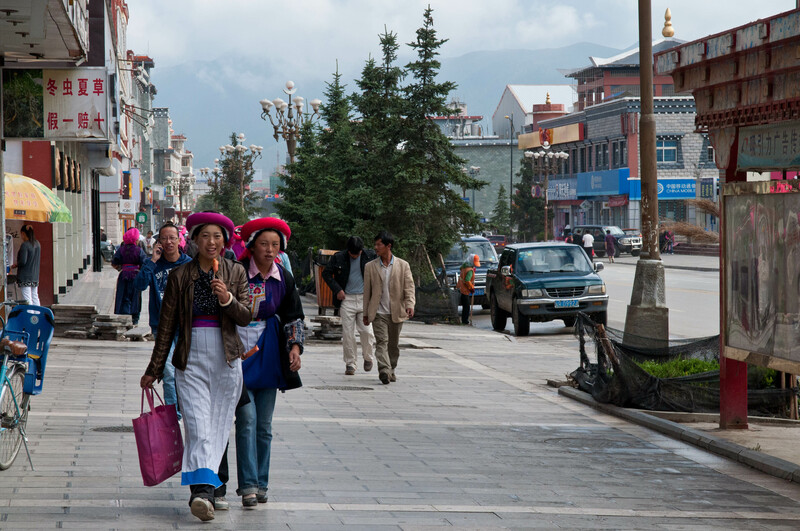 The city of Shangri-la has a population of around 120,000 and sits at 3200 m (10,498′). That may sound like a pretty good sized city, but on Chinese standards, it’s pretty tiny. 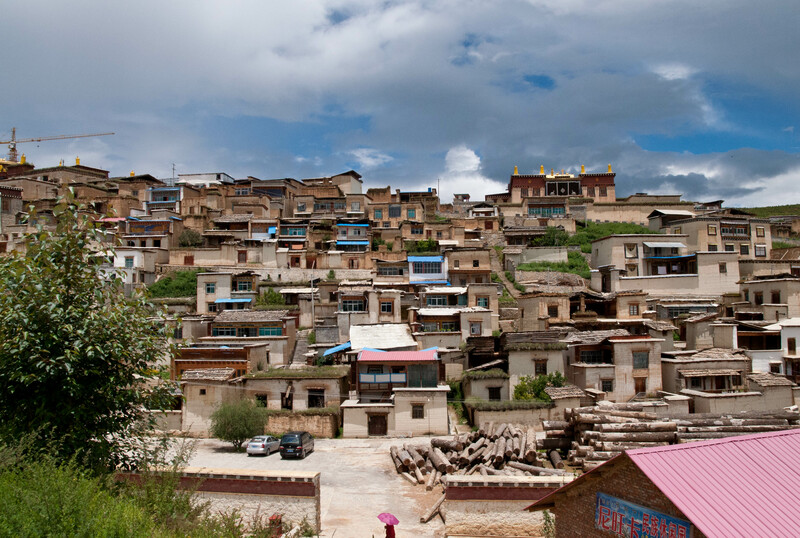 The city consists of an old section where all the Tibetans used to live and a new section recently built up by the Chinese. This is typical of many Chinese cities—the original older city, and a newly developed section. For example, a couple years ago I was in Qingdao visiting an academic program there. I was staying in the new section of town and I didn’t like it. It was very modern with lots of new shiny skyscrapers, and shopping areas, but it was all very bland, with very few people on the streets. It was even hard to find a decent restaurant that was reasonably priced. The border between the new city and the old was stark. Literally cross a street and it was like the old China that I know and love—tons of little shops and restaurants, crowds of people on the streets, old architecture, lots of character. 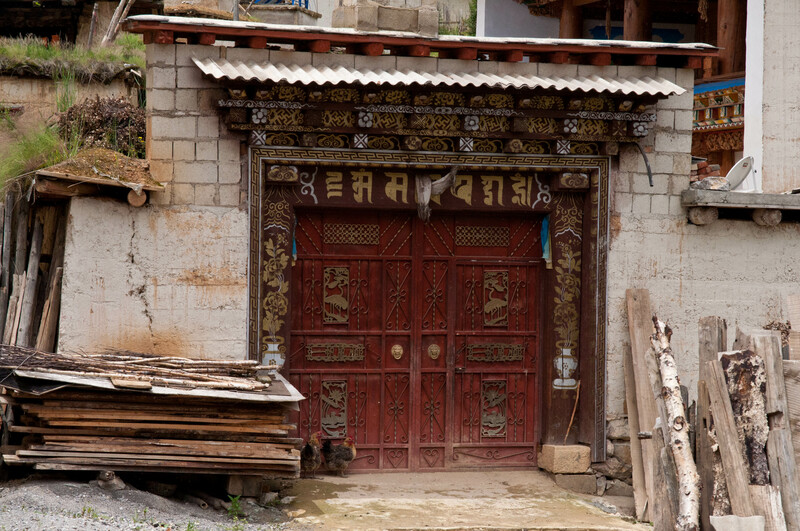 Shangri-la’s old town was charming and quaint, but a little too “restored.” That is, they went a little too far with tourists in mind. It is full of little restaurants, coffee shops, stores selling all kinds of tourist trinkets, and guest houses. 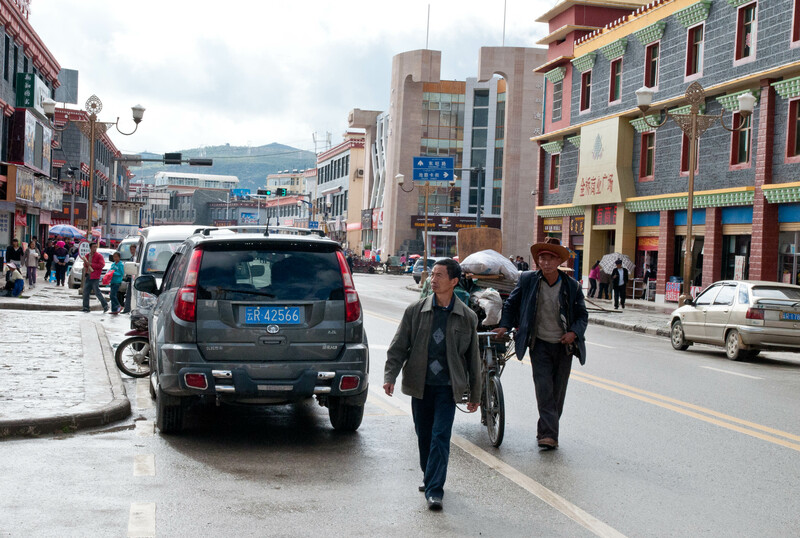 The new city is rather typical of most Chinese cities, bland concrete architecture, wide streets, and generic stores. 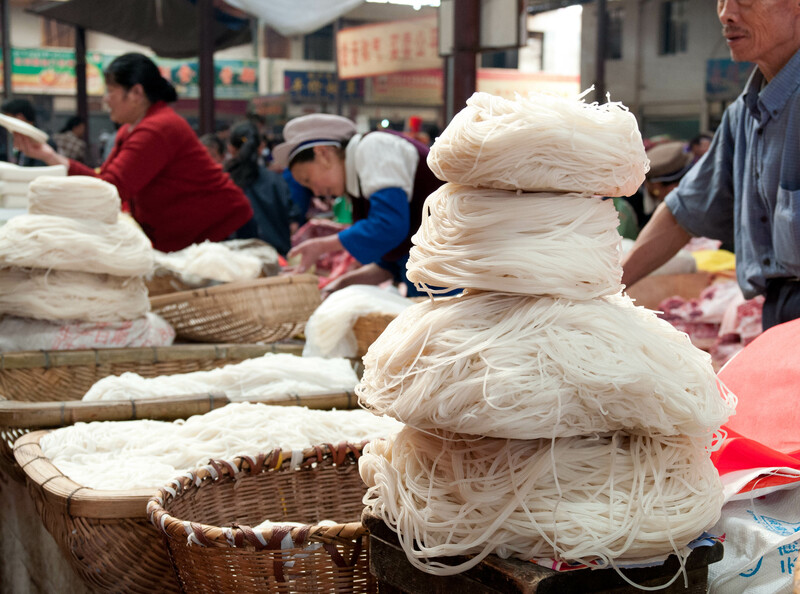 But Shangri-la is still predominantly Tibetan, and that is who you see on the streets and in the markets. Yes there are Chinese run businesses and restaurants, but there is still a huge Tibetan presence. 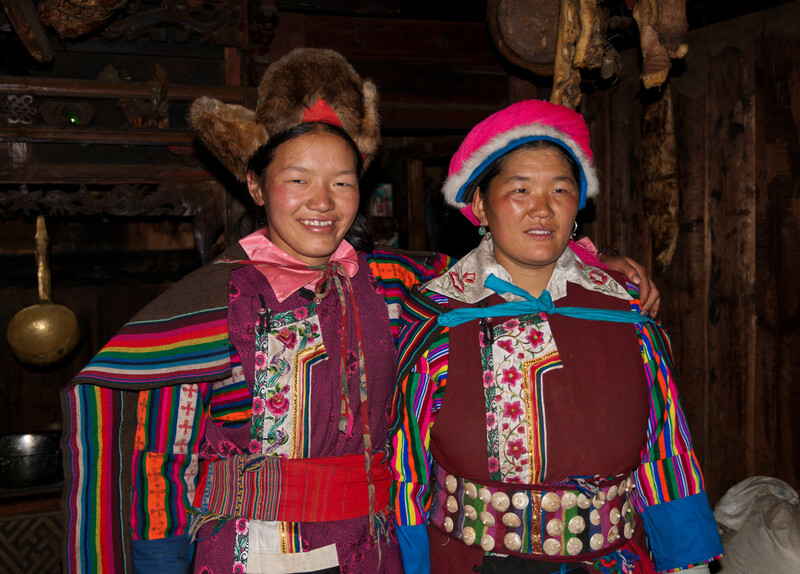 Tibetan women in this part of the Tibetan realm have a distinctive dress. Nearly all the women in the city seem to wear pants (oftentimes jeans), a bright blue apron. sometimes with a white apron over the top it, and a distinctive headdress that sometimes consists of bright fuchsia yarn wound together, or a woven scarf. They are very bright and colorful. Some women also wear brightly colored blouses or vest-like coverings. 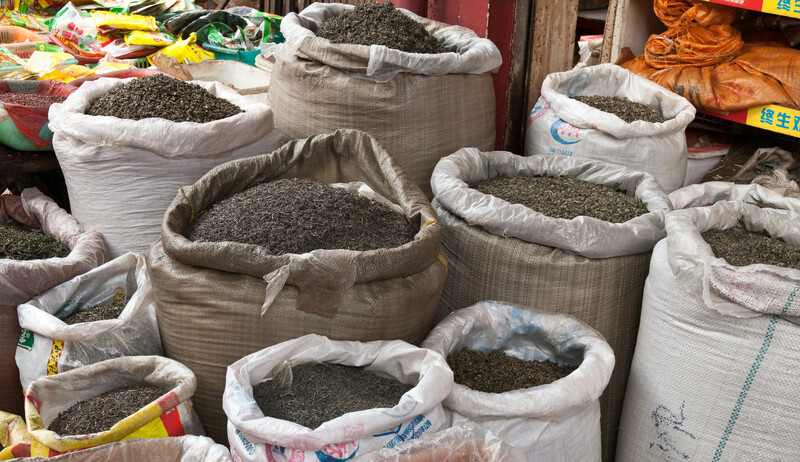 One morning while out exploring we came upon a thriving street market. 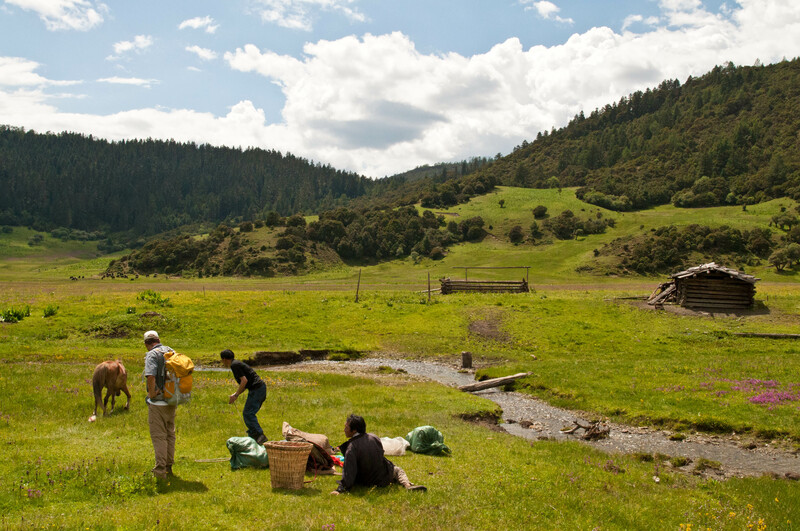 This is where we had our first taste of yak cheese. Though a bit strong and somewhat smoky, I kind of liked it. Michael was not too thrilled about it though. 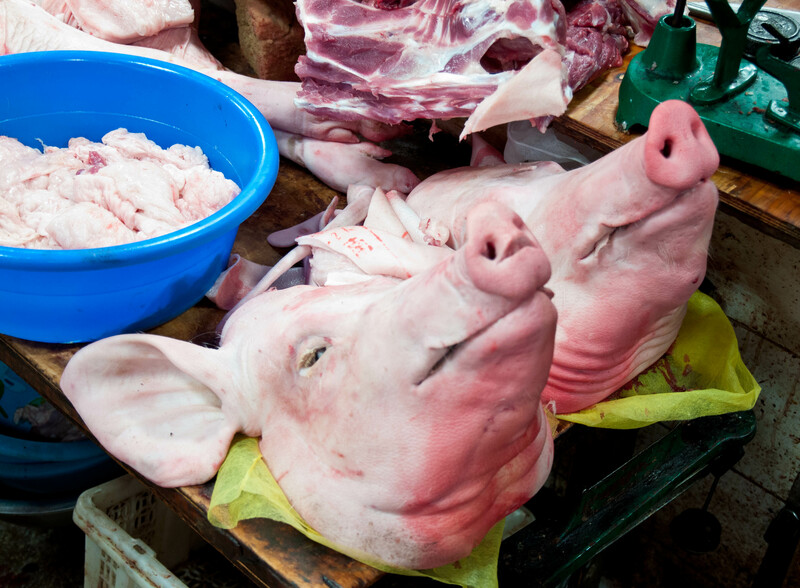 We then stumbled on an indoor market selling meat, produce, and other things. 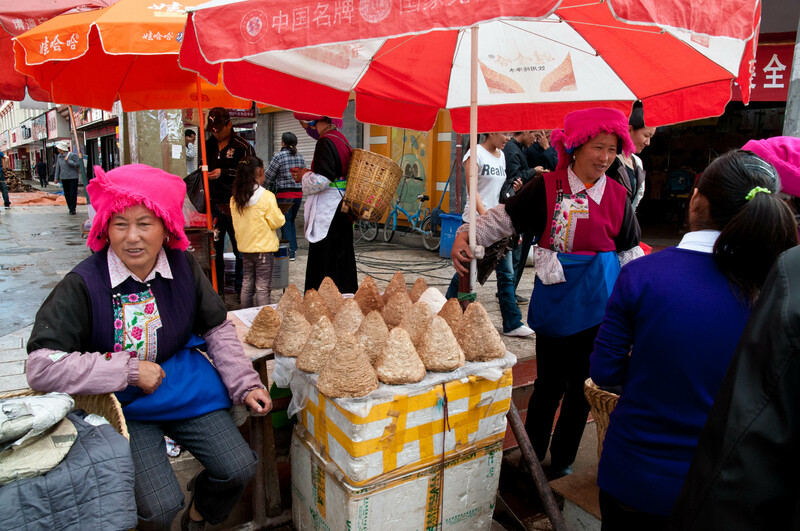 In Chinese we would call this a 农贸市场 nóngmào shìchǎng, or a farmer’s market. I love these kinds of markets and we had a great time wandering around taking pictures. The highlight was when Michael slipped on a big chunk of pig fat on the ground and almost went down. Fresh market. 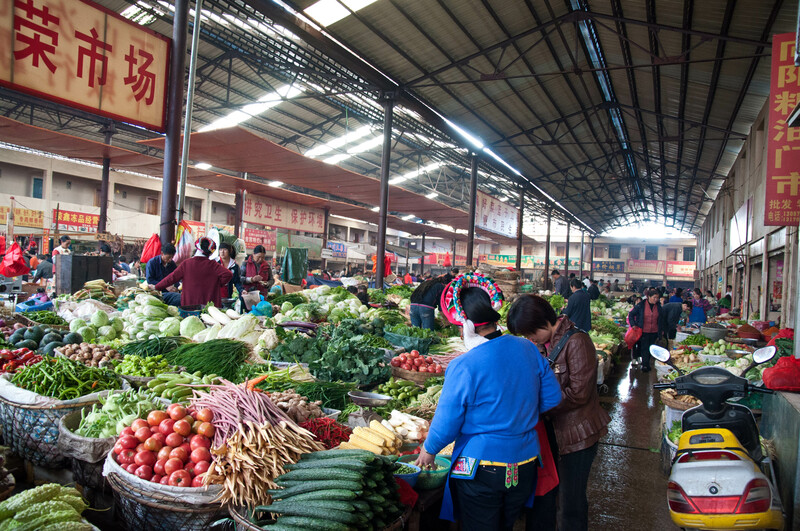 The characters in the upper left say cài shìchǎng or "vegetable market"
These kinds of markets sell an astonishing array of goods, from fresh meat and vegetables to dry goods and live animals in some cases. Below is a sampling of goods. 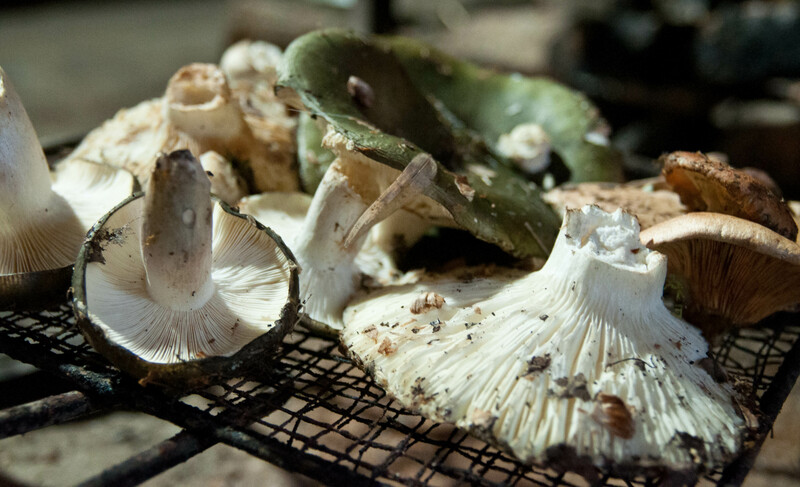 Another day we were wandering around on the outskirts of town and came upon a mushroom market. 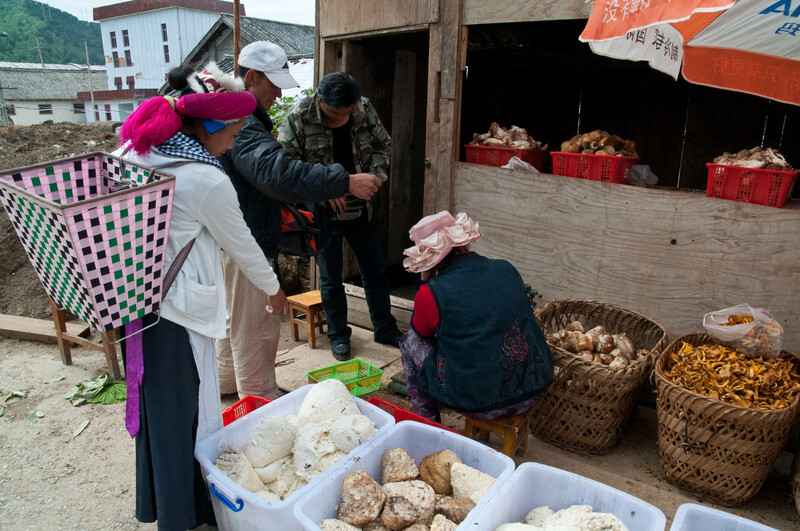 July and August is wild mushroom season in this part of Yunnan Province and many Tibetans roam the mountains picking mushrooms to sell in the markets. 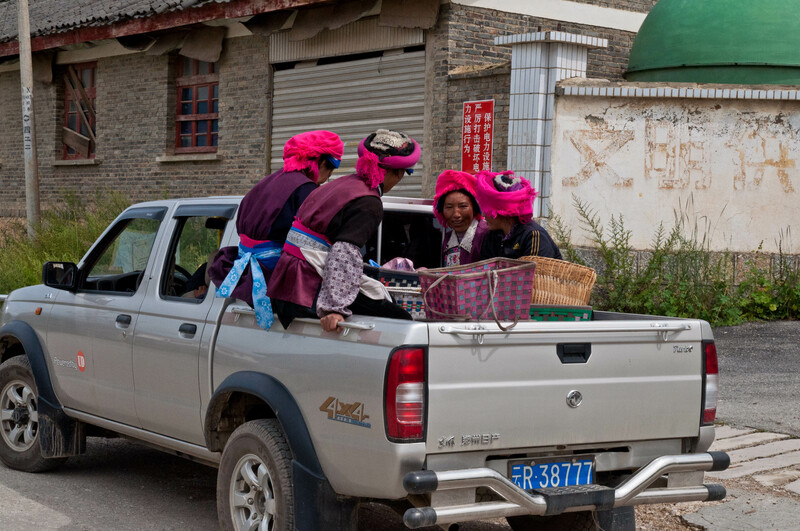 This is one way for rural Tibetans to earn some cash. 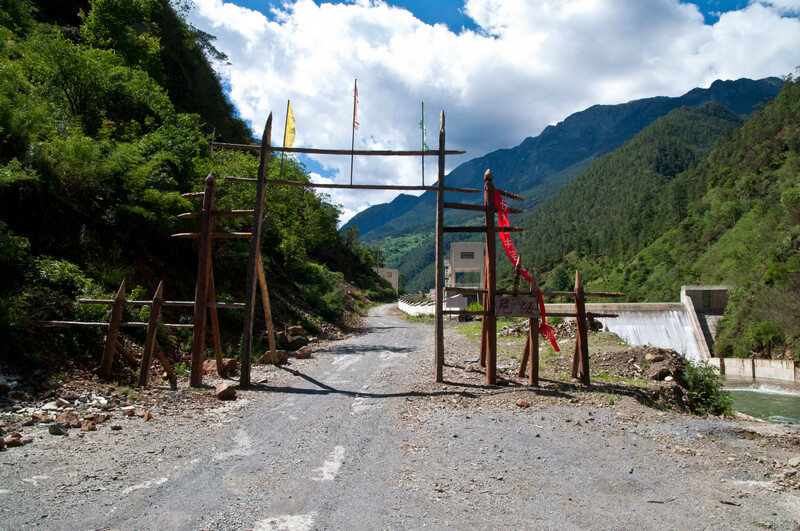 The road to Tibet, a few hours drive away. In late July of 2010, a colleague and friend of mine attended and spoke at an academic conference at Yunnan University in Kunming. 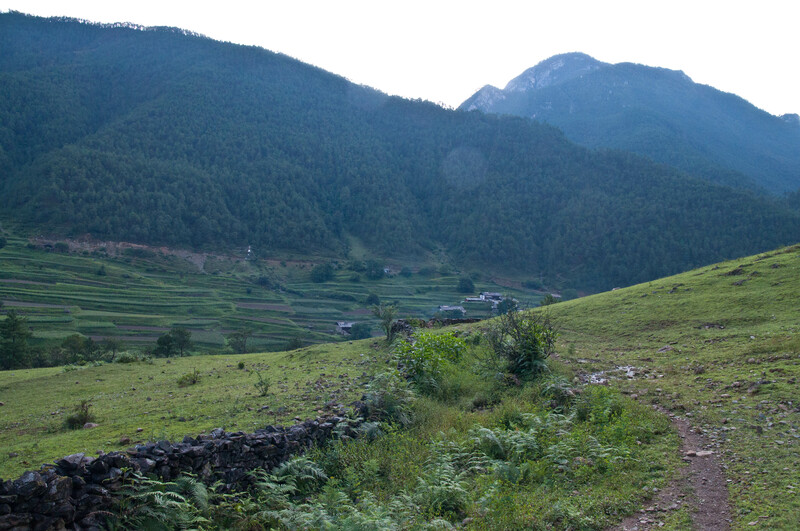 Since we were in a wonderful and scenic part of China, we decided to take some time after the conference to do some trekking. 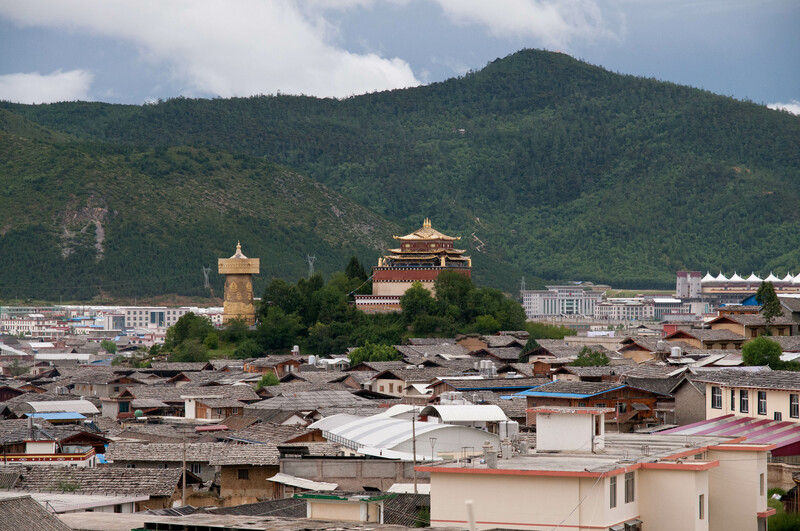 We both have interest in Tibet and the border regions of Tibet where about half of all Tibetans live. 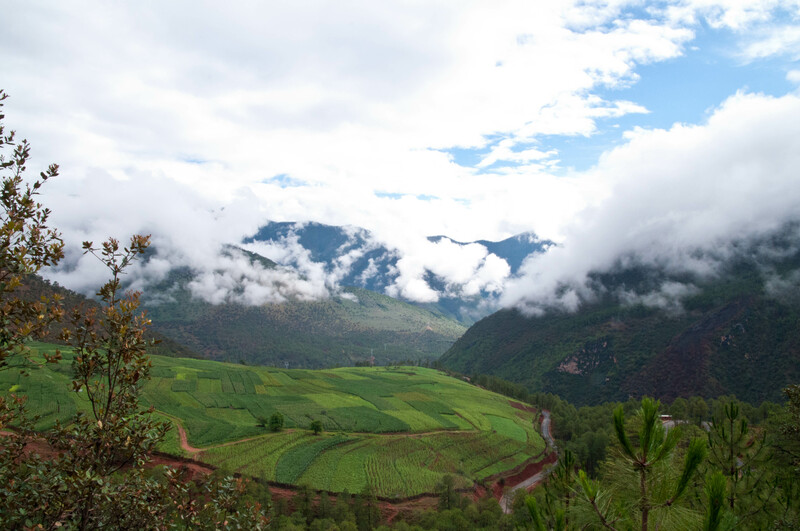 Yunnan Province in China’s southwest has three Tibetan Autonomous counties. 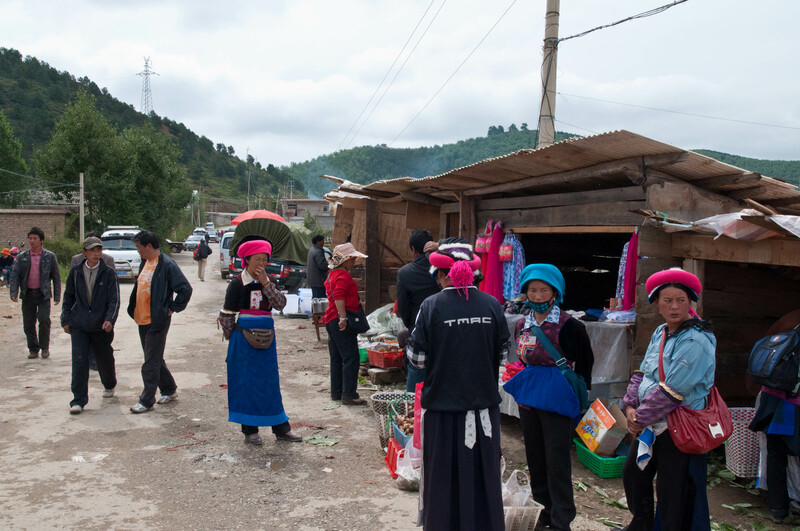 One of my former students had traveled to the Shangri-la region in upper northwestern Yunnan and the region seemed really interesting with a high Tibetan population. My friend had also visited the city in the 90’s. 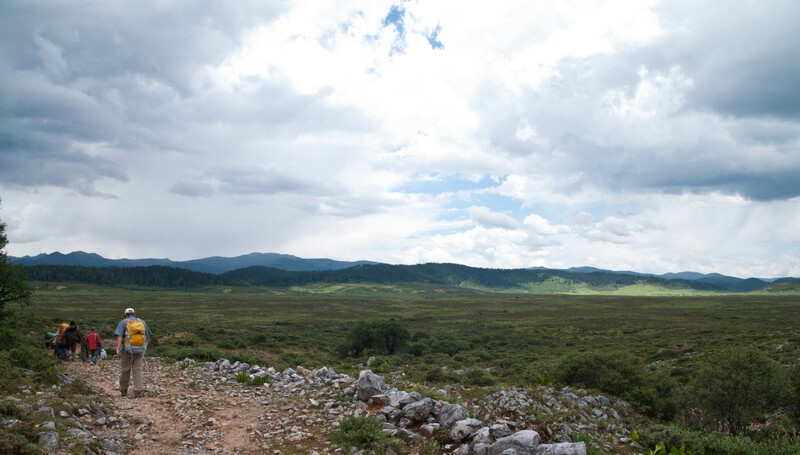 In 2001, in order to attract tourists, the city of Zhongdian 中甸 zhōngdiàn was renamed Shangri-la 香各里拉 xiānggēlǐlā. 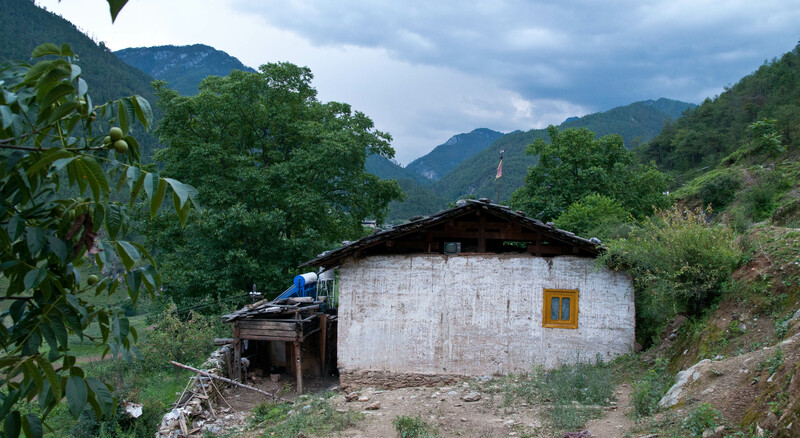 The name Shangri-la came to the west from the novel written by James Hilton about a mysterious Himalayan utopia isolated from the world. 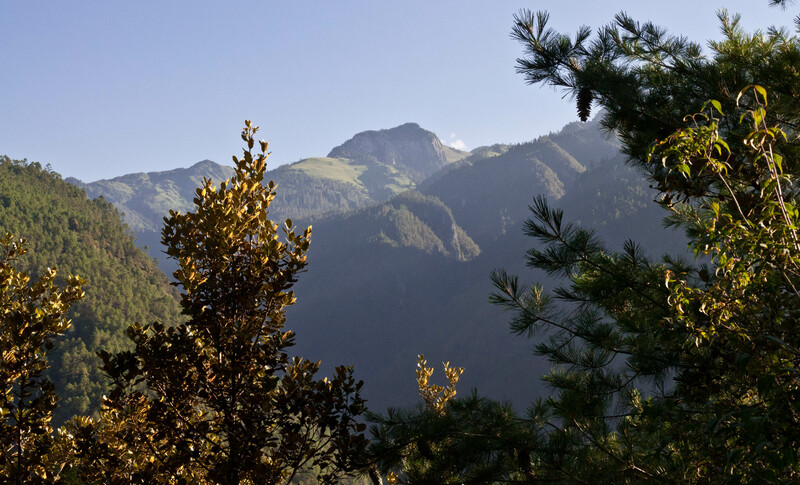 Several places in the Himalayas have been thought to be this place described in his novel, but only China was brazen enough to actually name a town Shangri-la. 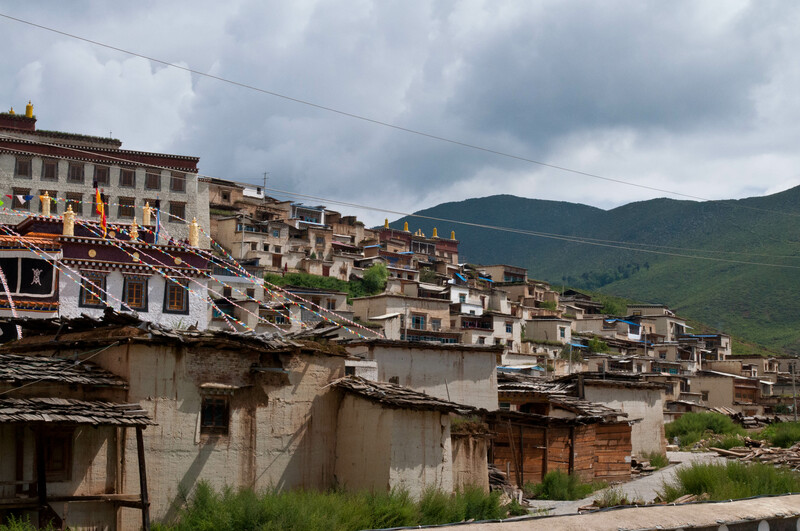 In the old days, (in the 90’s and previously) Zhongdian was a dusty, almost one street town, where it was not uncommon to literally see Kham Tibetan “cowboys” ride into town on their horses. 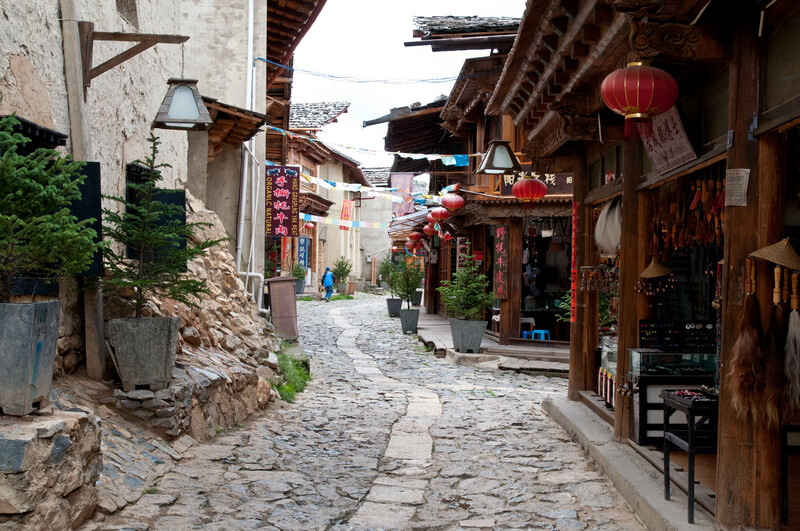 The old town consisted of narrow winding alleys through a large cluster of old wooden frame buildings. After 2001, that all changed as the Chinese spent millions of yuan “improving” the city. These improvements included completely rebuilding the old city gearing it toward the tourist industry, widening streets, building luxury hotels, restaurants, an airport, and so on. After our conference, we flew to Shangri-la from Kunming. We had arranged to stay at a small guest house (Kevin’s Trekking Inn) where my former student had stayed. It was also recommended in the Lonely Planet guidebook. 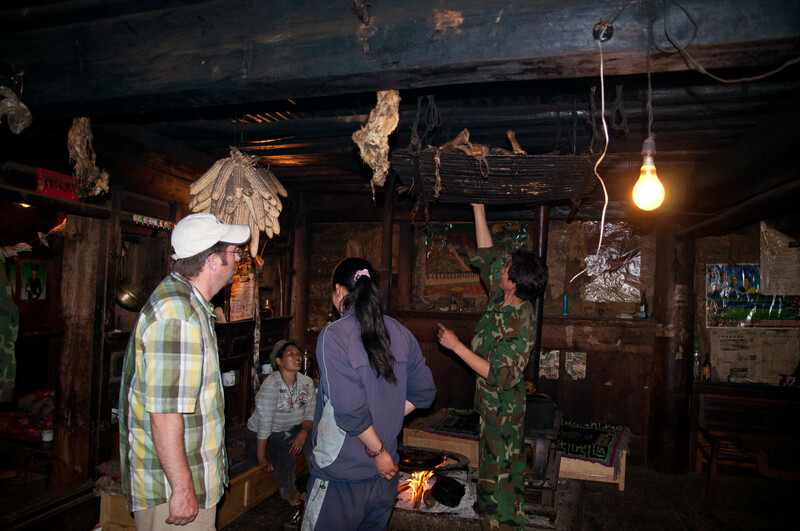 The place was run by a Han Chinese guy and staffed with a couple Tibetans. It was a bit of a mixed bag. The rooms were okay, but the water was unreliable, meaning we only had water for a short time each day, and what we did have was pretty weak and very cold. They claimed that their well was low on water, but we suspected there was some politics going on, that and the fact that the guesthouse was on a hillside where it was probably more difficult to get water. 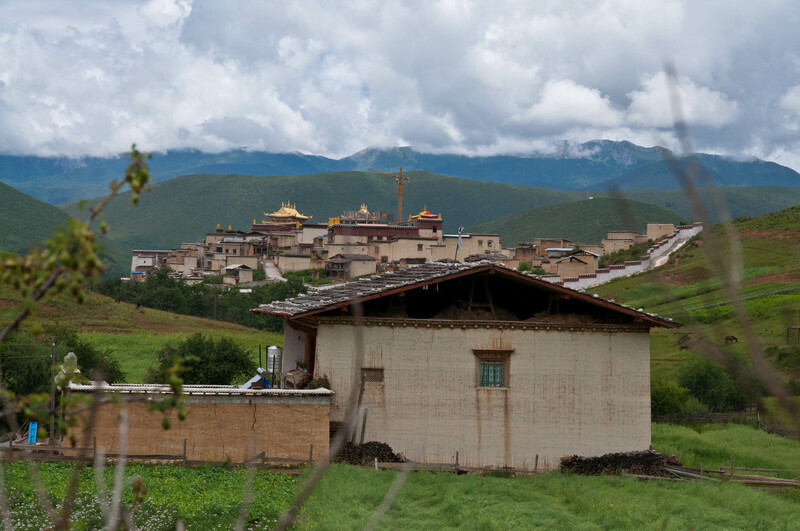 Our first objective was to visit the large Songzanlin Monastery 松赞林寺 sōngzànlín sì outside of town. We took a local bus that ran the length of one of the main roads in town up to the monastery. 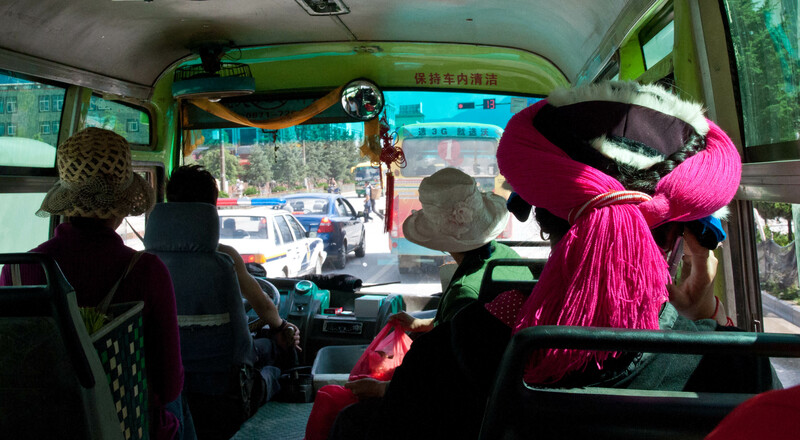 The bus was full of Tibetans. It made a mandatory stop at a new building where we were forced to get off and buy a ticket to the monastery (all part of the tourist plan). From there we boarded another bus that took us up to the monastery. 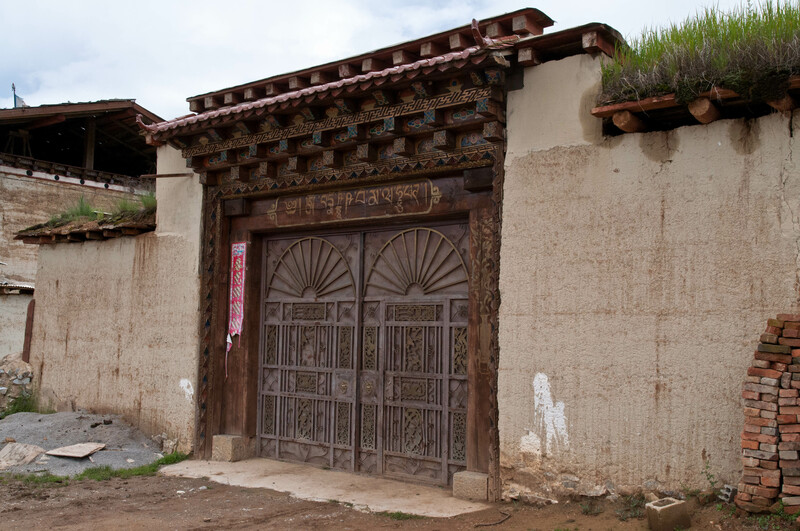 The monastery itself was originally built in 1679, and is the largest and most famous Buddhist monastery in the Kham region of Tibet. 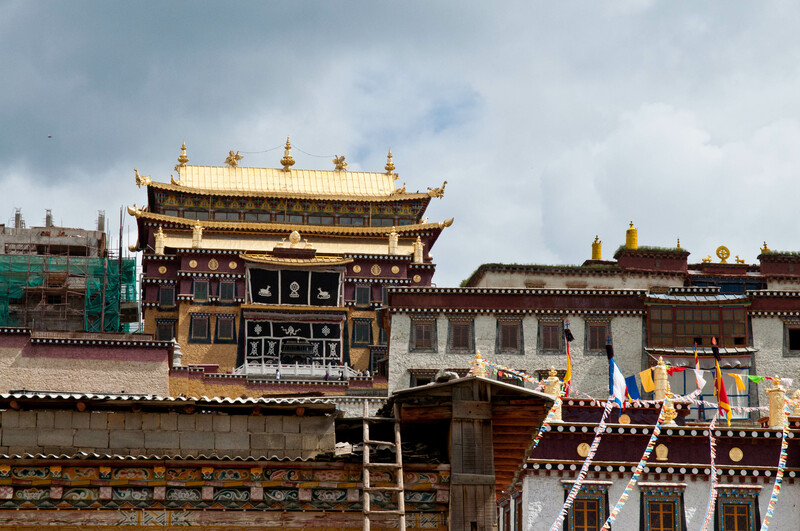 It is also known as the little Potala Palace because of its traditional architecture. It sits on the side of a mountain at 10,827 feet. 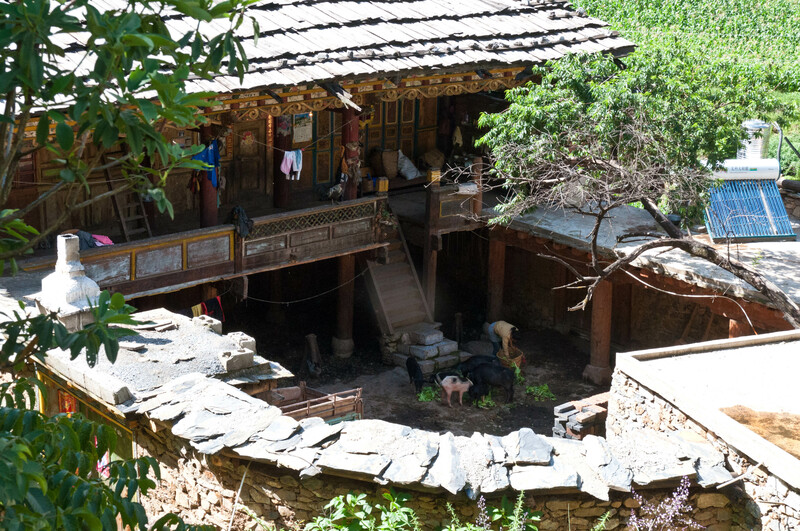 The whole complex consists of the temple, two lamaseries, and a large jumble of small wooden living quarters clinging to the hillside. My friend had visited this monastery in the early 90’s and reported that the monks were very friendly and showed him all around. We were looking forward to this kind of reception but were disappointed that even though we spoke Chinese, we received a pretty chilly reception. They did not seem to be interested in talking to us. 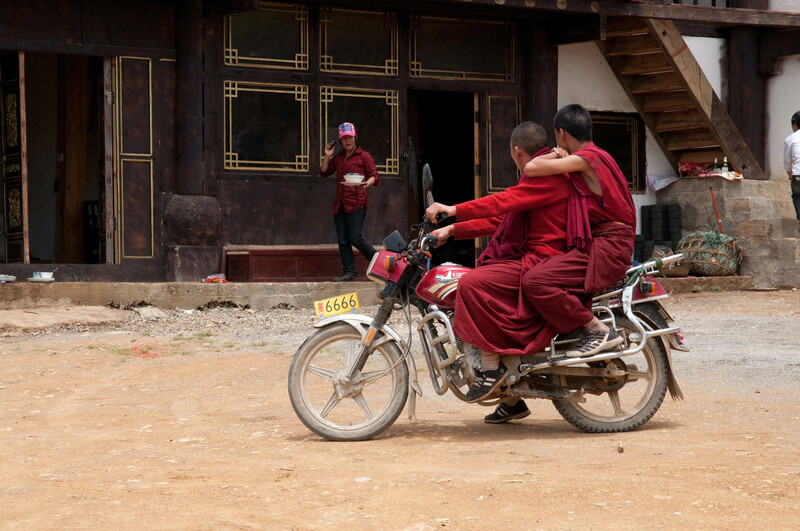 I suppose at this point they were tired of all the tourists traipsing around their monastery. We spent several hours wandering around the complex of temples and houses. 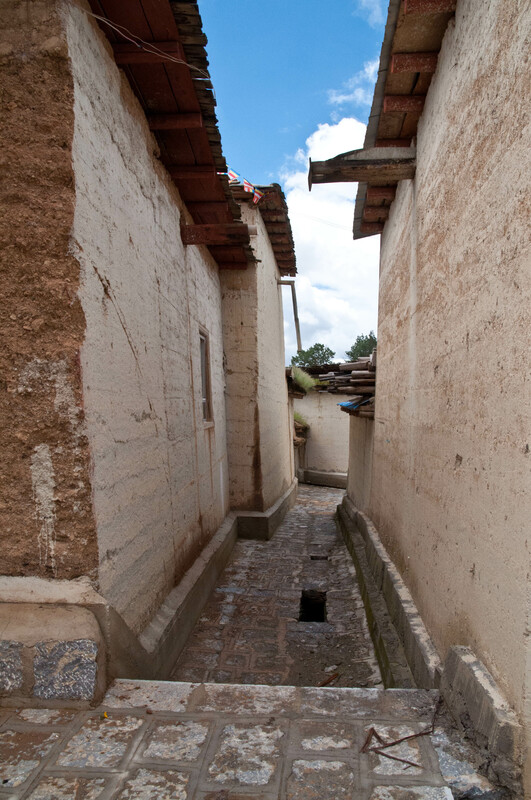 All the structures were made of wood and a maze of narrow alleys cut through the dwellings. 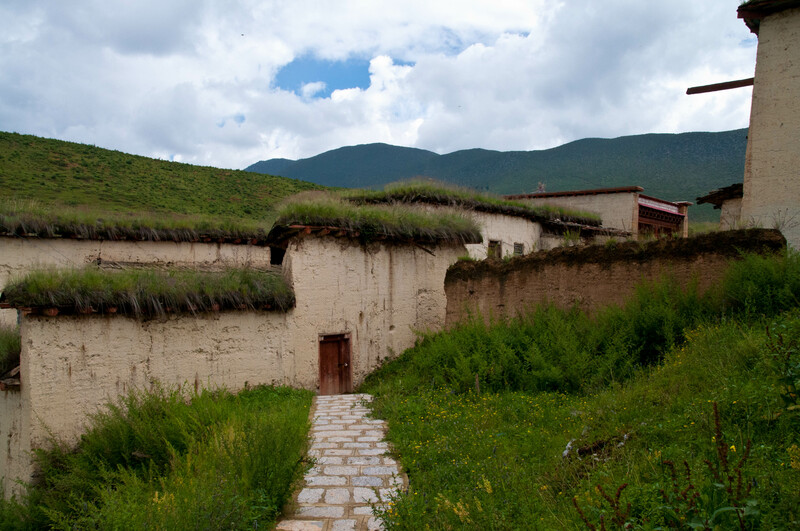 Behind the monastery were many more houses, many of which seemed to be made of rammed earth and wood. We walked through this small village and climbed to the top of the hill behind the monastery. 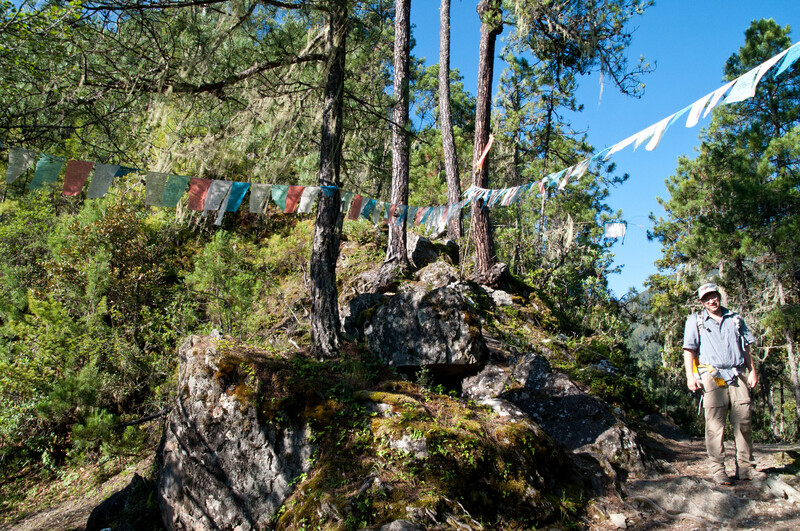 There were the customary prayer flags as well as beautiful views of the valley. 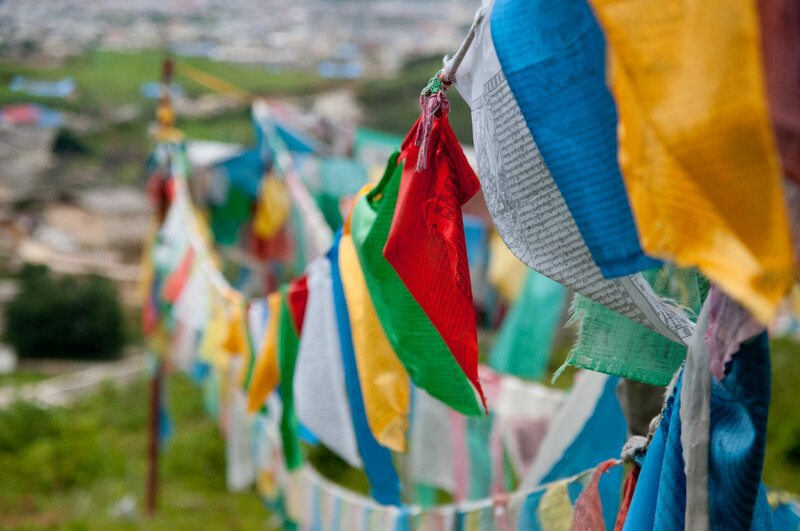 Tibetan Buddhist prayer flags are inscribed with prayers and mantras and are said to bring good luck. The wind carries these prayers across the countryside. 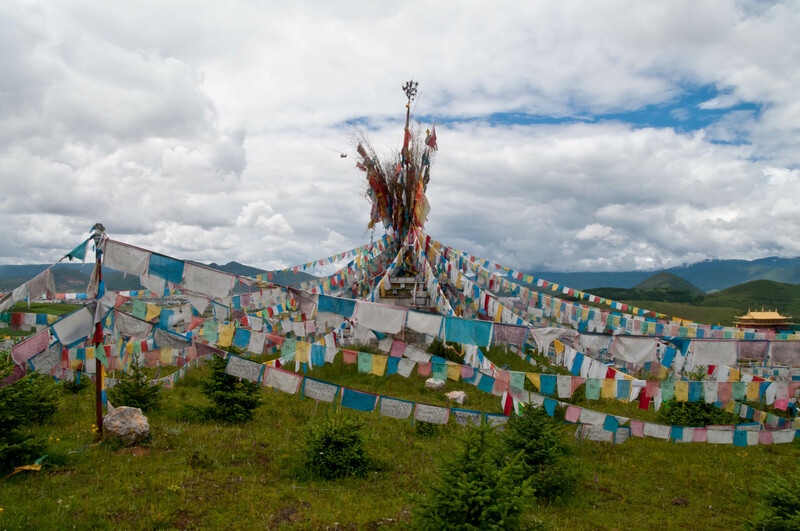 For more information on prayer flags see, http://www.prayerflags.com. 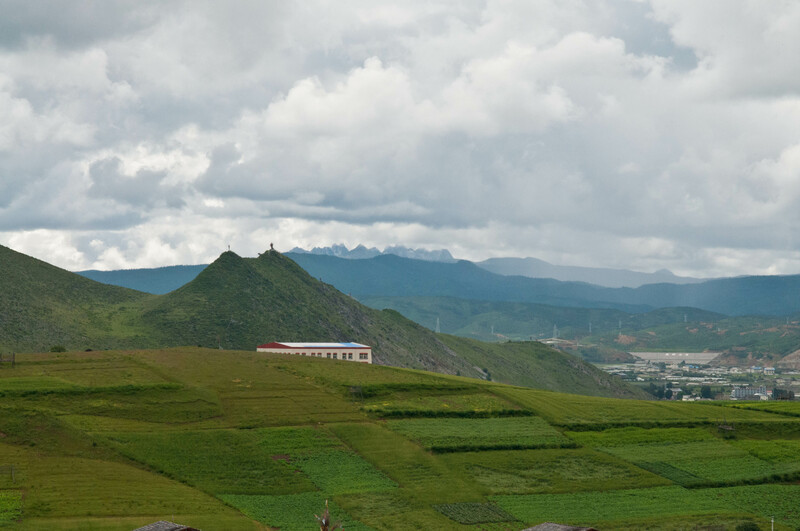 From the top of this hill there were nice views of distant Shangri-la, as well as distant mountain ranges, and surrounding farm and grazing land. 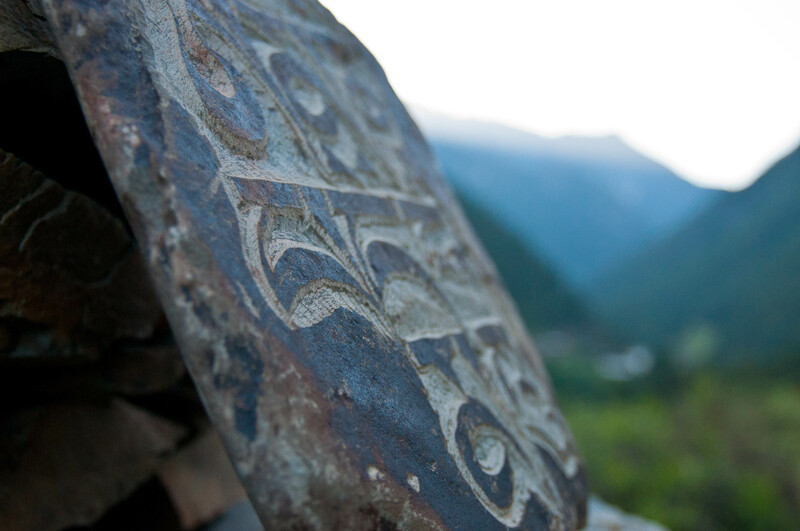 We hiked off the back of the hill down into another valley with a few traditional Tibetan houses. 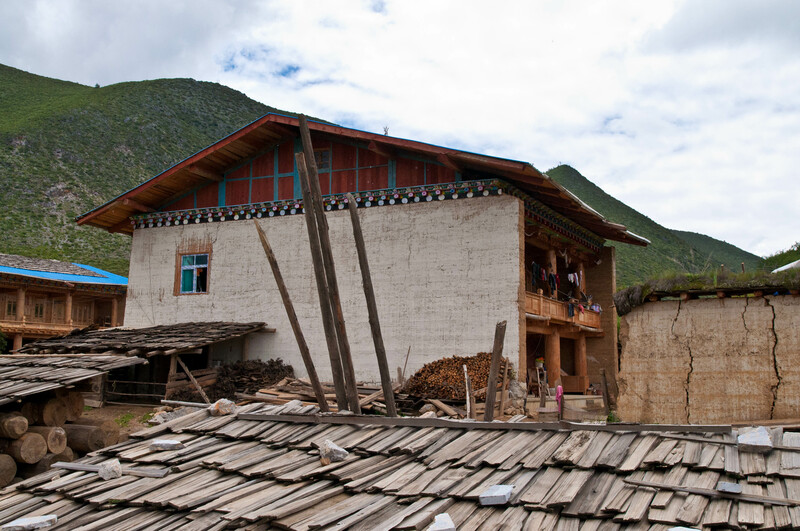 At the end of this valley was another small village full of traditional wooden framed Tibetan houses. 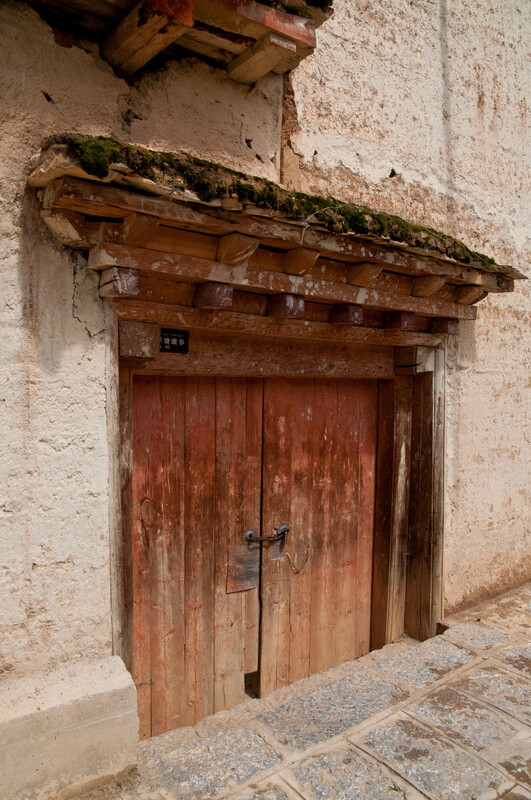 These houses consist of a gate that leads into a courtyard. 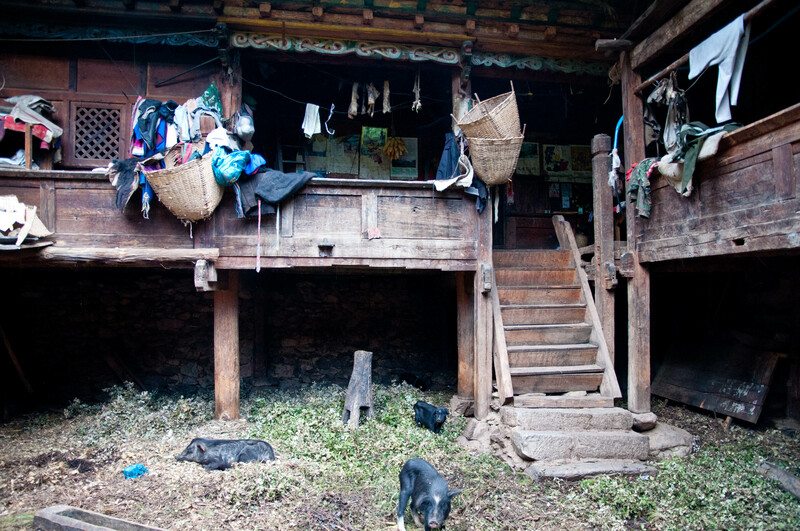 The houses are three stories with animals, (pigs, chickens, cows), on the ground floor, living quarters on the second floor and storage on the third floor. These houses were pretty nice. 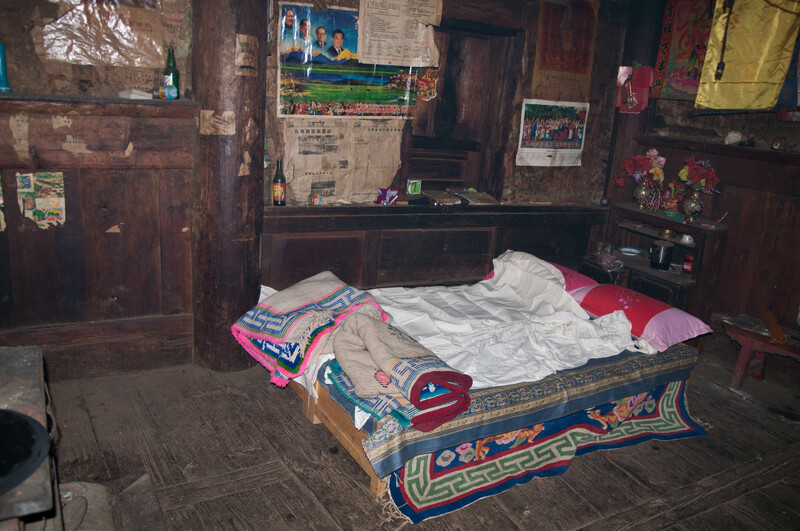 We would later stay in a much more rustic Tibetan house. 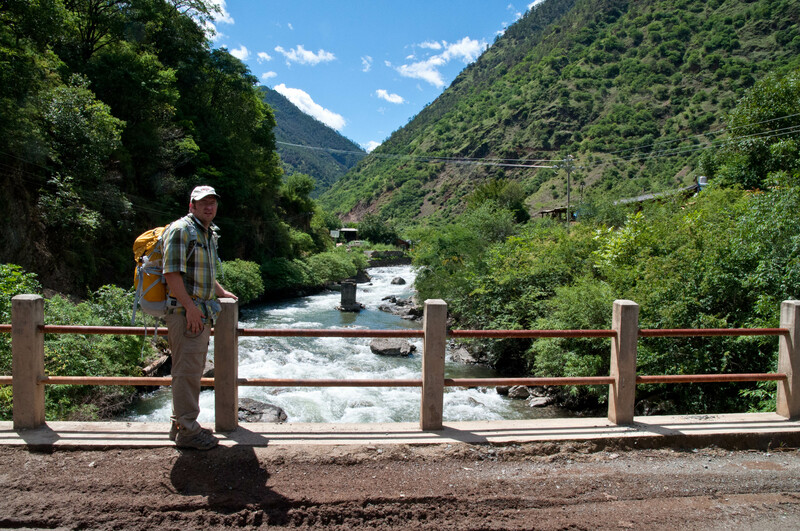 After walking around for most of the day, we were really feeling the altitude and were tired, thirsty and hungry. We found a nearby restaurant and had a pretty basic (i.e. not very good) meal. But it was nice to sit and rest a bit before we took a bus back to Shangri-la. 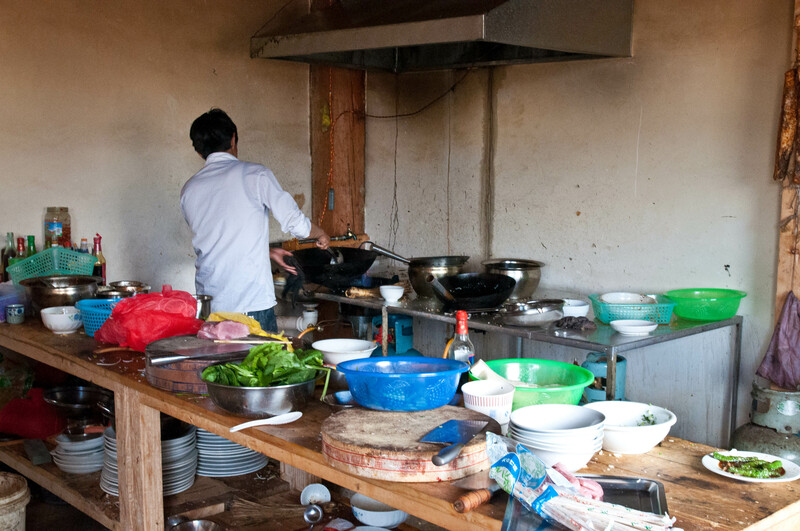 I do not recommend that you go poking around in restaurant kitchens in China as they can be pretty unsanitary. But I couldn’t resist a peak into the kitchen of this place. After all it was right next to where we were sitting. They certainly weren’t trying to hide anything. 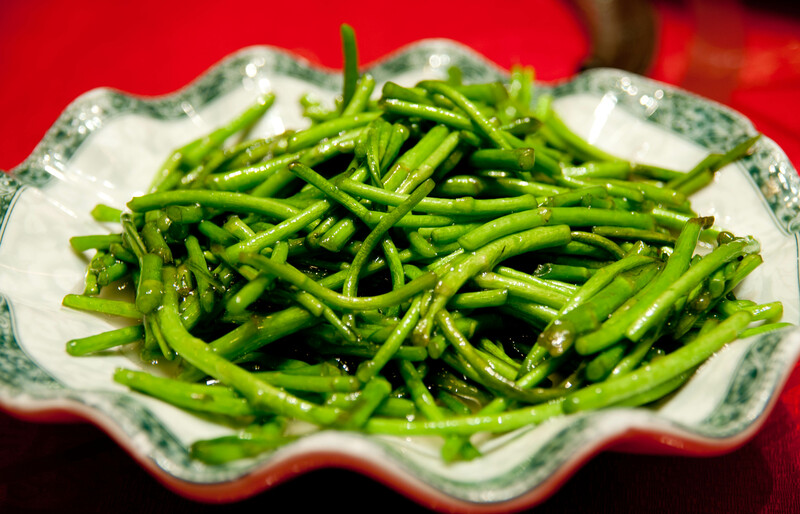 To say that Chinese life revolves around food and eating is not an overstatement. 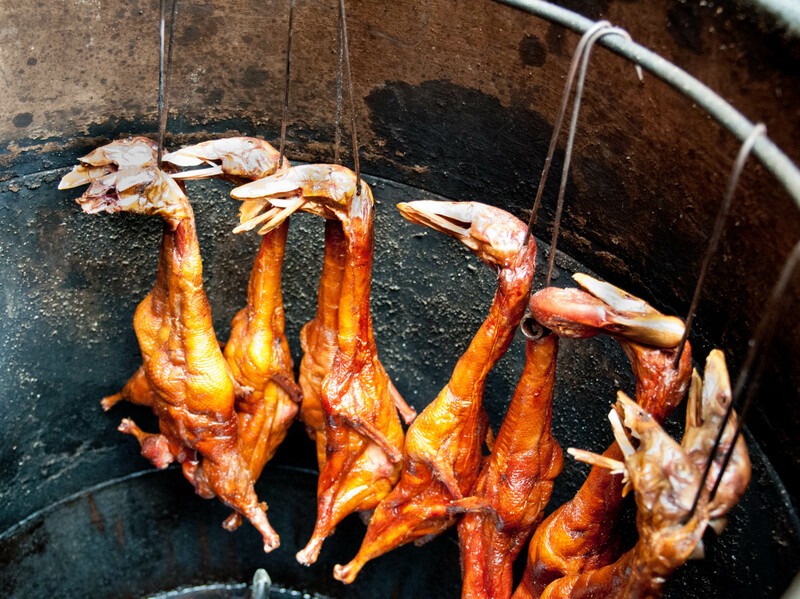 Food is at the core of literally every Chinese holiday and a multitude of everyday activities. In fact, a very common greeting in Chinese is 你吃饭了吗？ nǐ chīfàn le ma? “Have you eaten yet?” It is an expression of well-being, or concern for the other individual. This seems pretty logical coming from a country that has endured centuries of on and off famine. 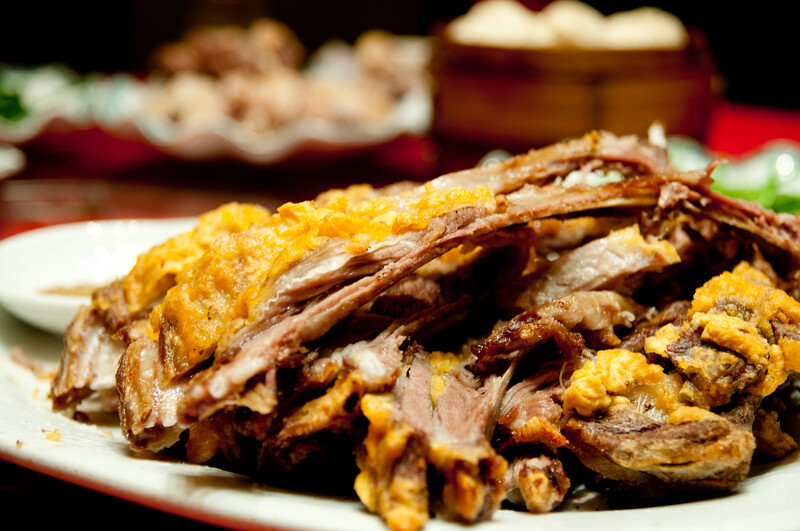 carry away leftovers from a meal = to get into serious trouble; for example if I said, 你吃不了兜着走 nǐ chībuliǎo dōuzhe zǒu means that you are in serious trouble. Obviously the meaning in this expression is metaphorical. 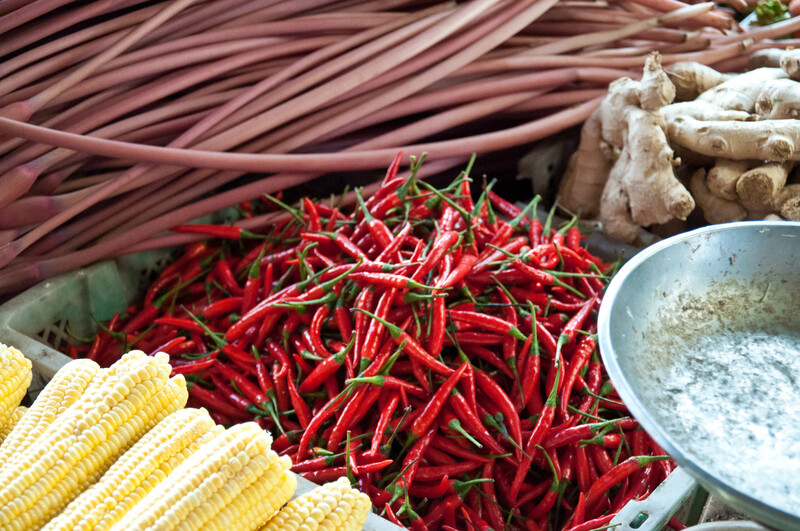 China truly is one of the great ancient cuisines, along with France and Greece. 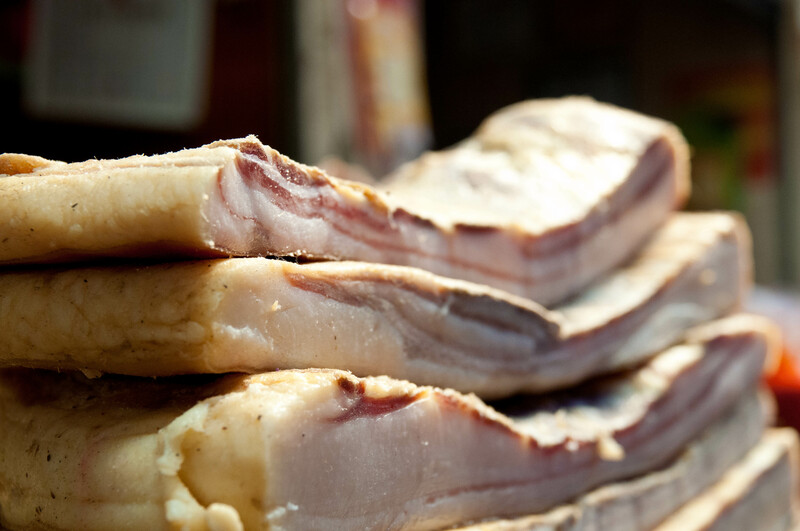 It is a cuisine that has survived and evolved for thousands of years. 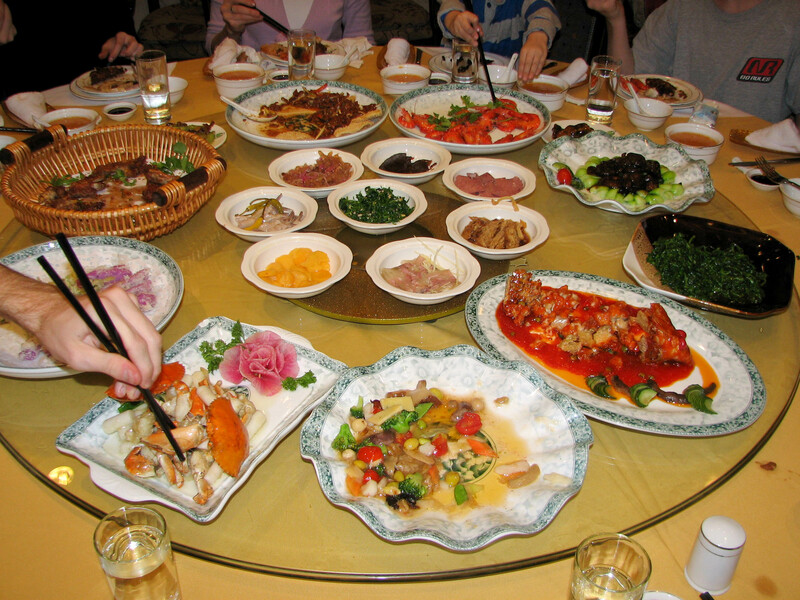 What most Americans do not realize is that Chinese cuisine varies dramatically across the country. 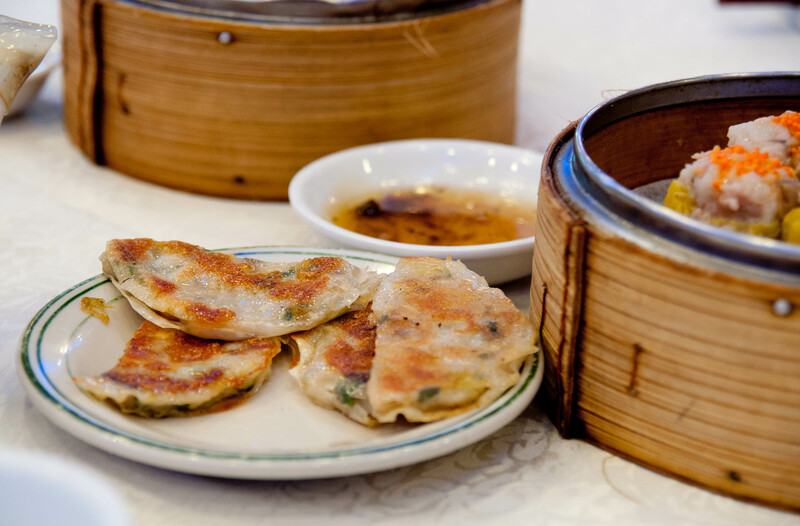 In other words, there is not just one kind of Chinese food, but rather many kinds of Chinese food, that use different ingredients, different methods of preparation, and different methods of cooking. 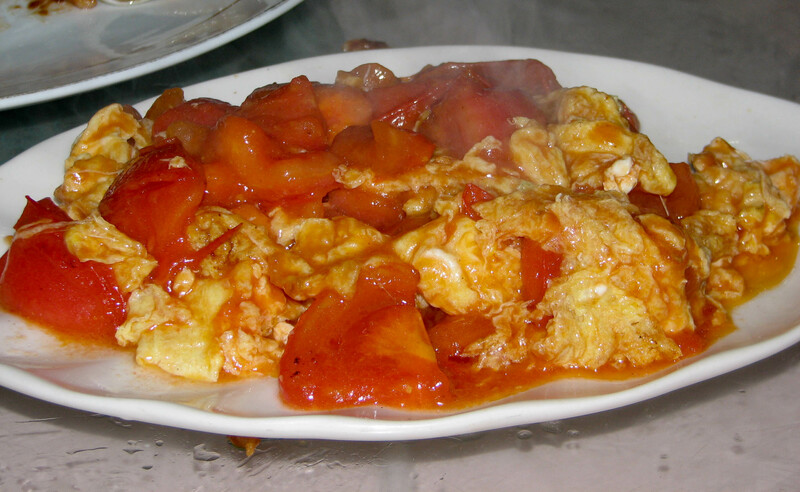 There are also popular dishes that you can find all over China. 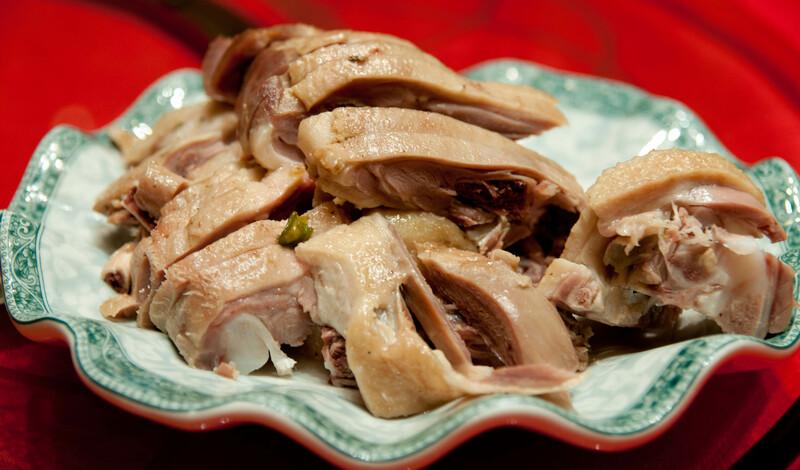 Below are a few photographs of some dishes I like to eat when I travel to China. 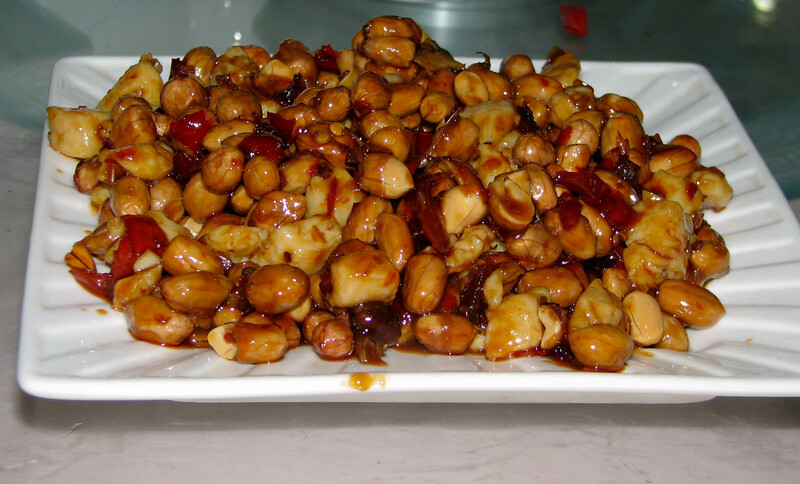 In a later post I’ll discuss some of the different kinds of Chinese food. 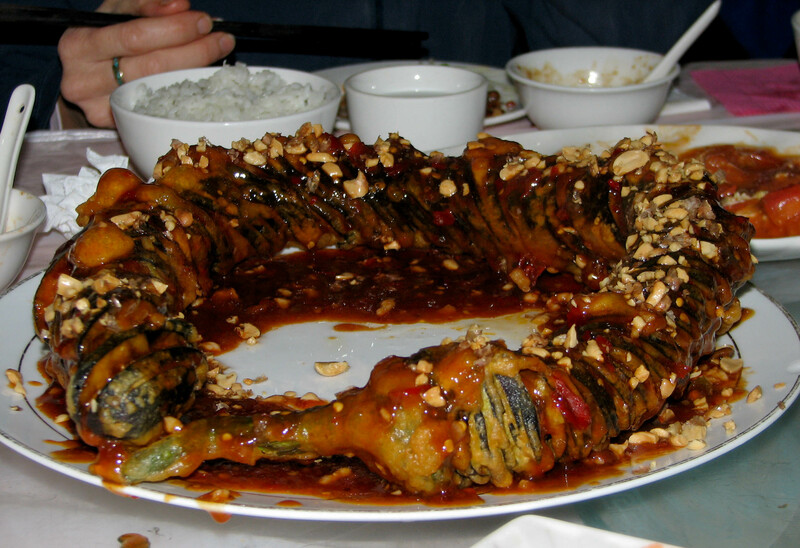 I don’t know the origin of the eggplant dish below, but I have only found it at one very small restaurant in Nanjing. 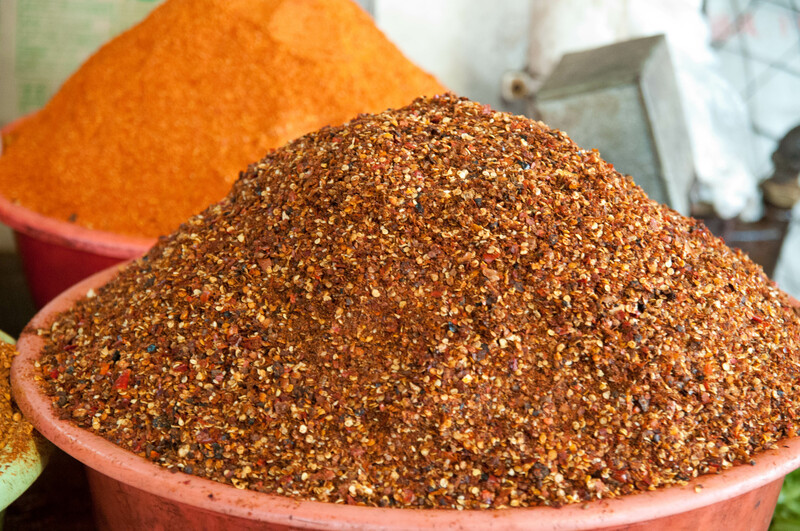 It is truly delicious—spicy, sweet, and crunchy. And finally some dimsum dishes from Hong Kong. A couple years ago a friend and I were in Kunming for an academic conference and decided to visit the famous Yuantong Temple. 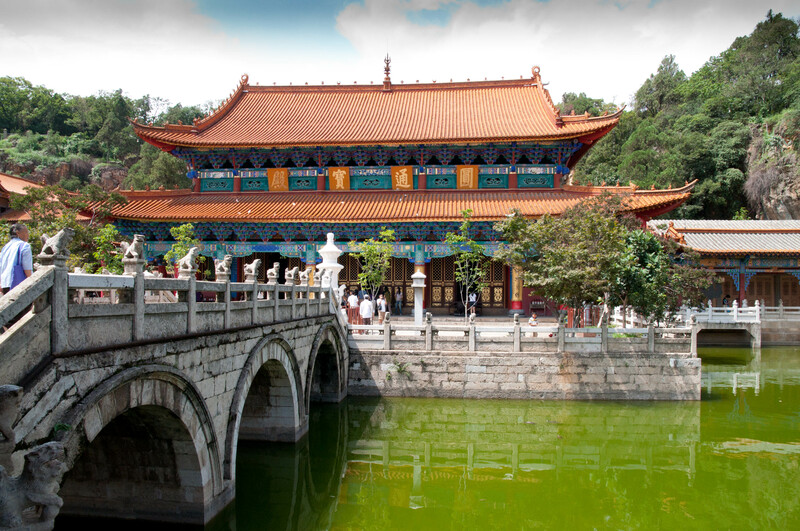 It was originally built in the late eighth century, but like all old structures in China, it has been rebuilt many times. It is a working temple with quite a few resident monks. 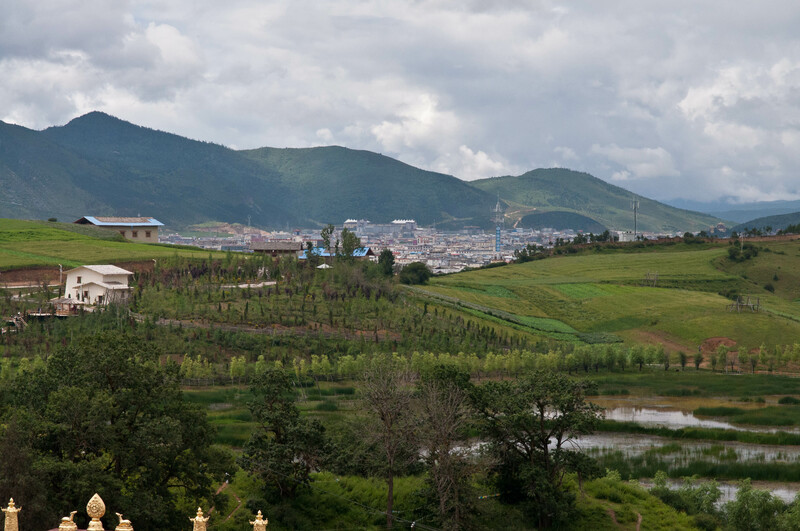 It is the most important Buddhist temple in Yunnan Province. Pilgrims come from all over the area to pay their respects. 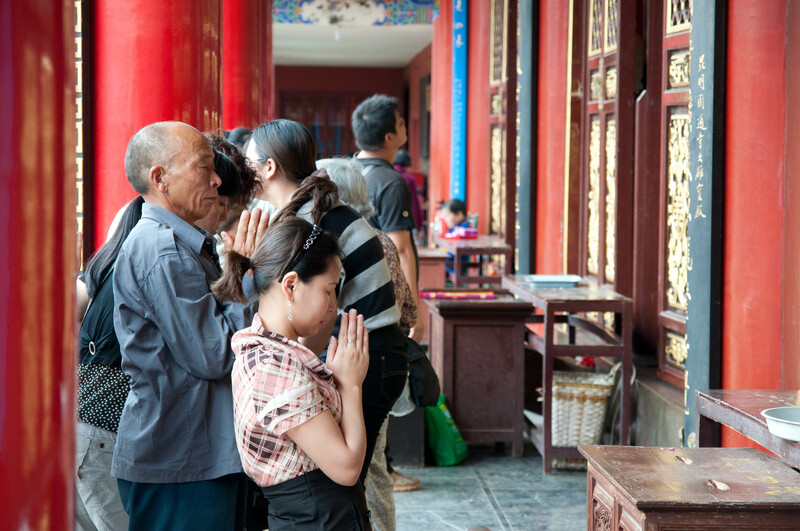 At the temple there are classes on Buddhist scriptures as well as many oridinary citizens praying. We observed several gatherings of people in the various pavilions singing, chanting, and praying together. 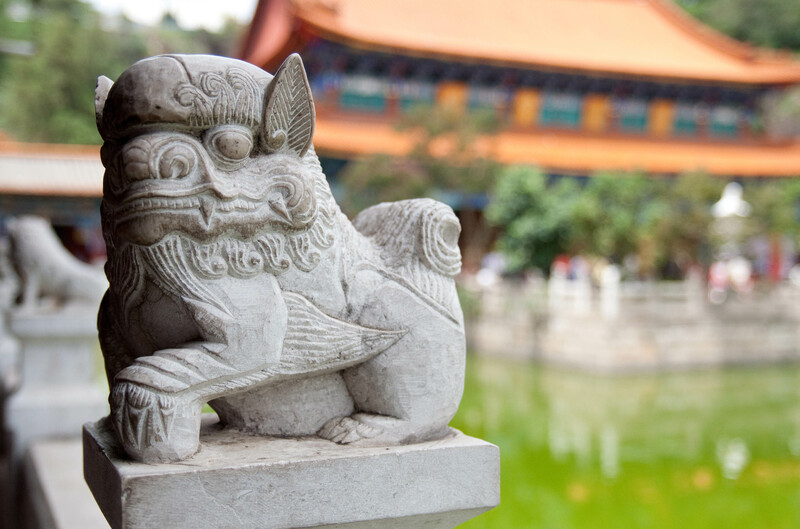 I really enjoy visiting Buddhist temples in China. 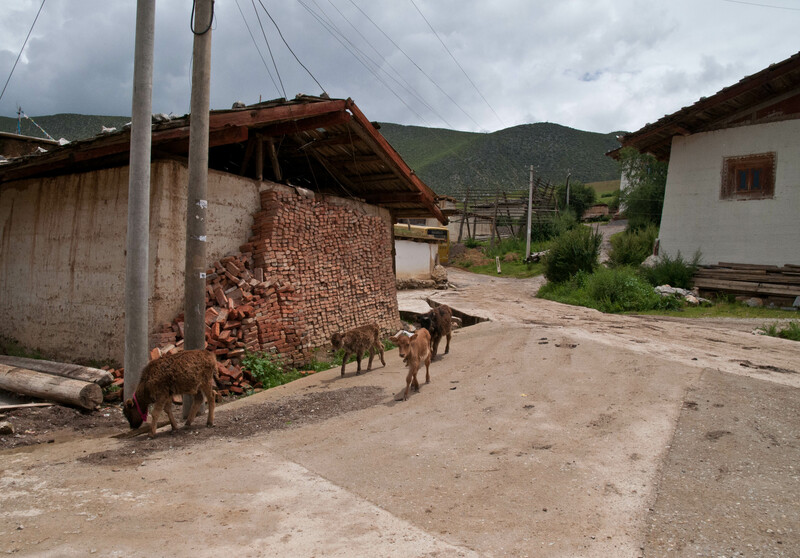 Usually they are are very peaceful and a welcome break from the frenetic pace of large Chinese cities. I like talking to Buddhist monks about their background, why they decided to become a monk, their daily activities, and so on. I’ve had some very interesting conversations over the years. 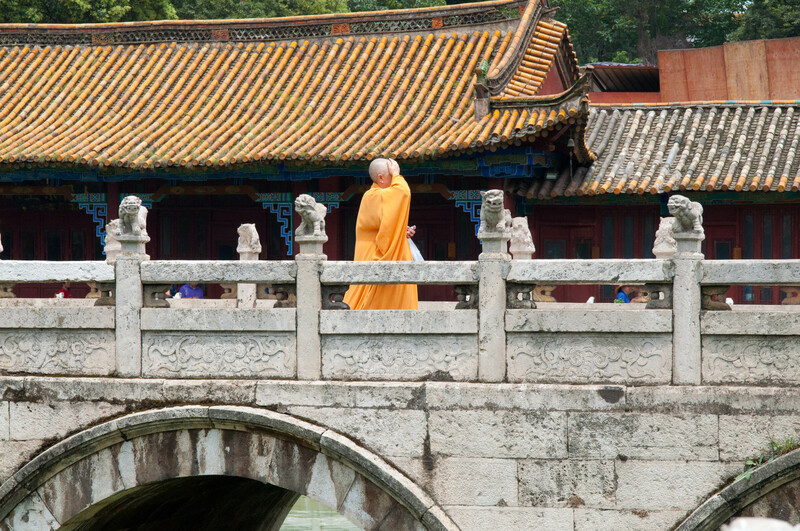 I remember at a monastery in Xi’an once chatting with a middle-aged monk. We were strolling through a quiet back courtyard with no one else around. Out of the blue he pulled out a handful of kettle corn from somewhere inside his saffron robes and offered it to me. My first thought was, “where did that come from?” I graciously accepted his simple gesture. Another time at the Lingyin Temple and monastery in Hangzhou I struck up a conversation with another monk. After chatting for awhile he offered to show me around. After a brief tour of the main hall, he ushered me into his office. I was surprised to find a computer, fax machine, and other modern electronics. 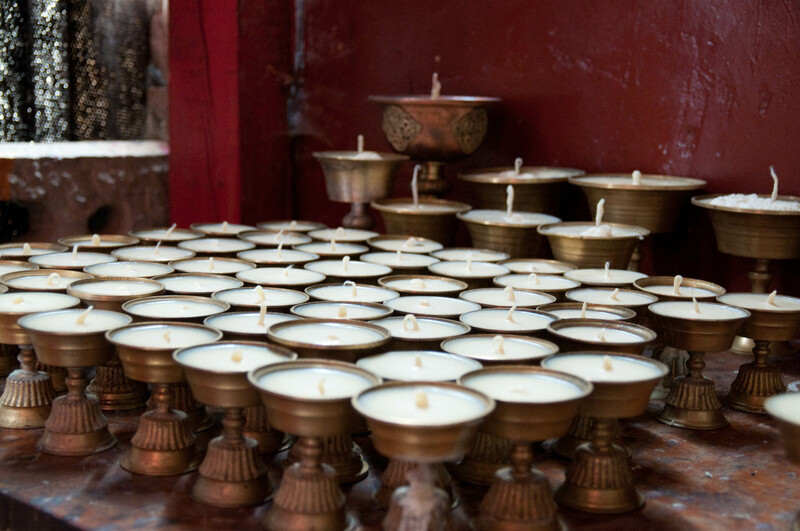 He offered me a cup of tea and we sat on burnished wood chairs as he explained why Buddhism is important to him. 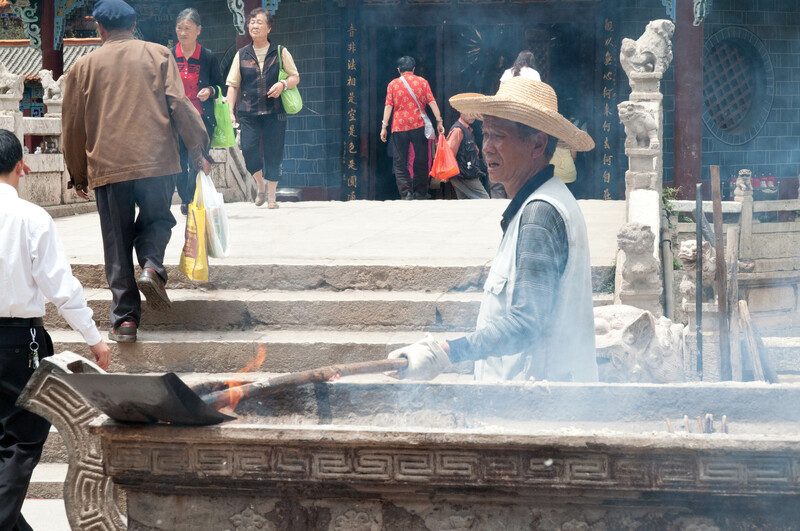 Below are a few pictures from the Yuantong Temple in Kunming. I’m not sure why the water is so green, but that is how it really looked. And it was full of fish and turtles.